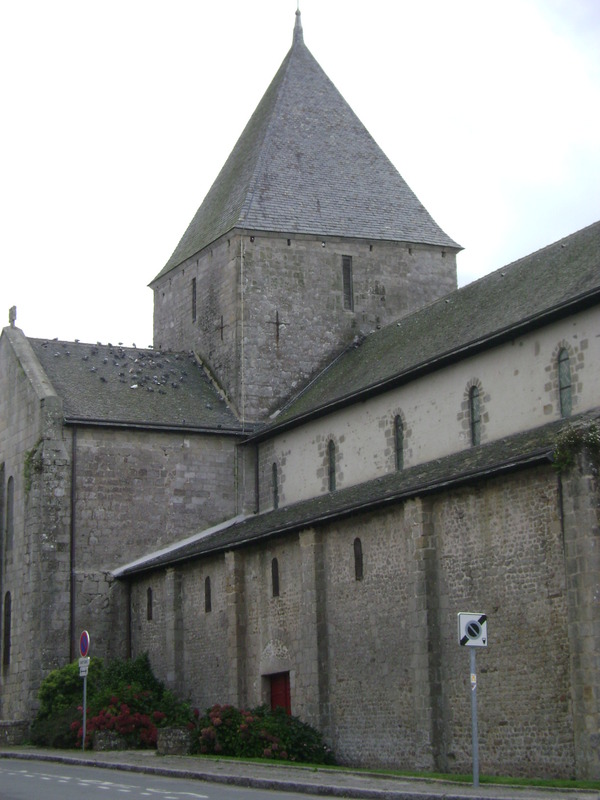 The romanesque style Abbaye of Daoulas in the Brittany region of France dates back to the 12th century. 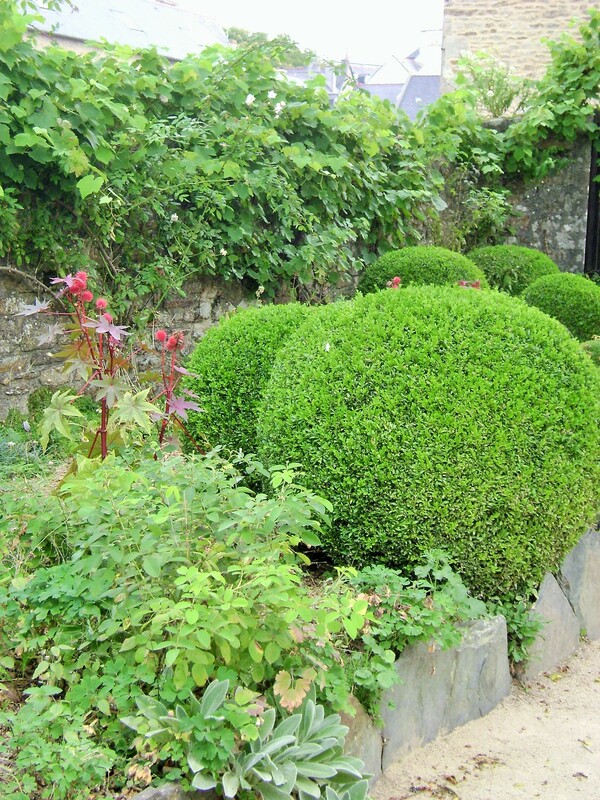 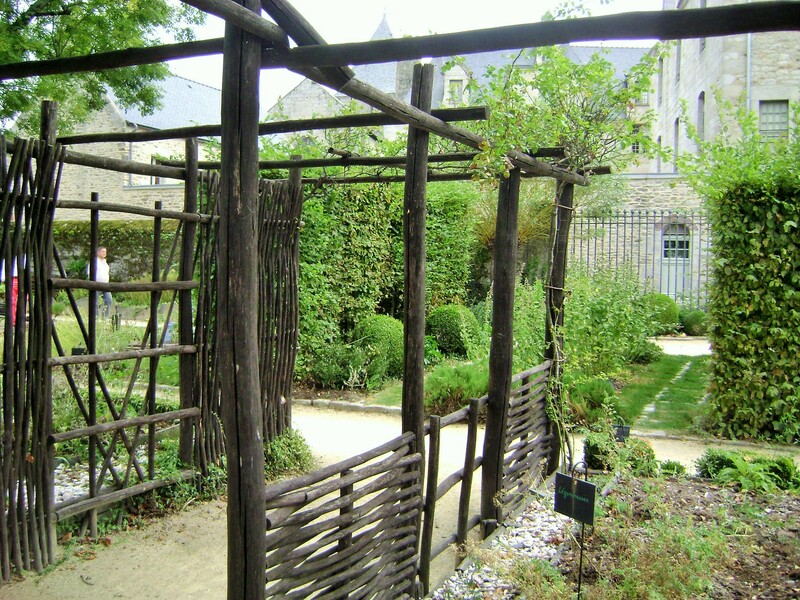 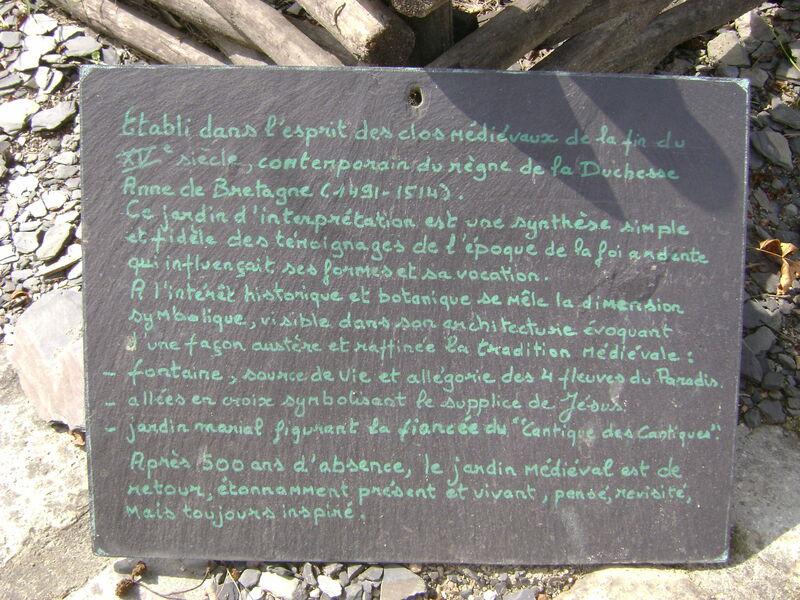 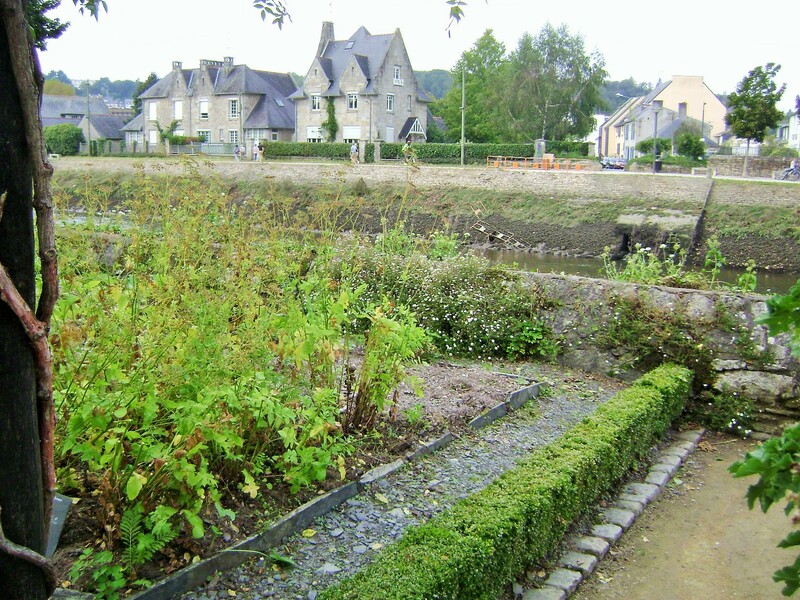 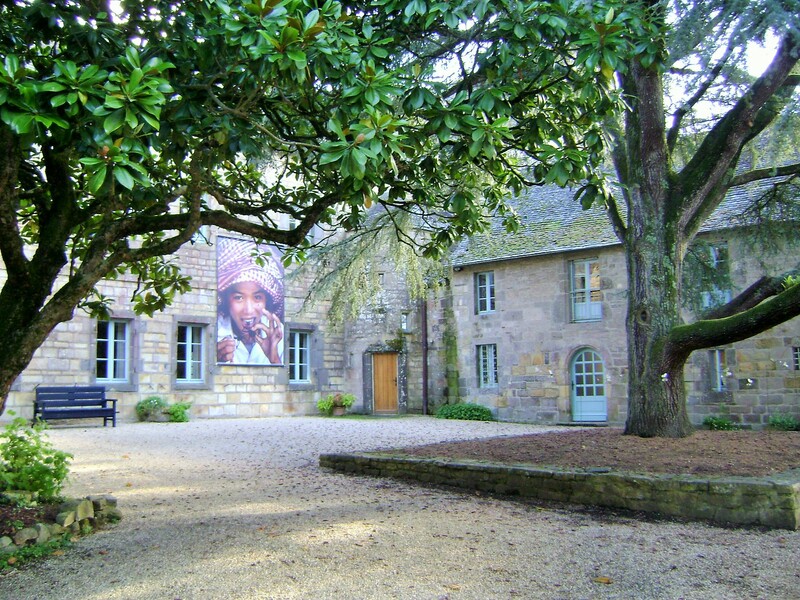 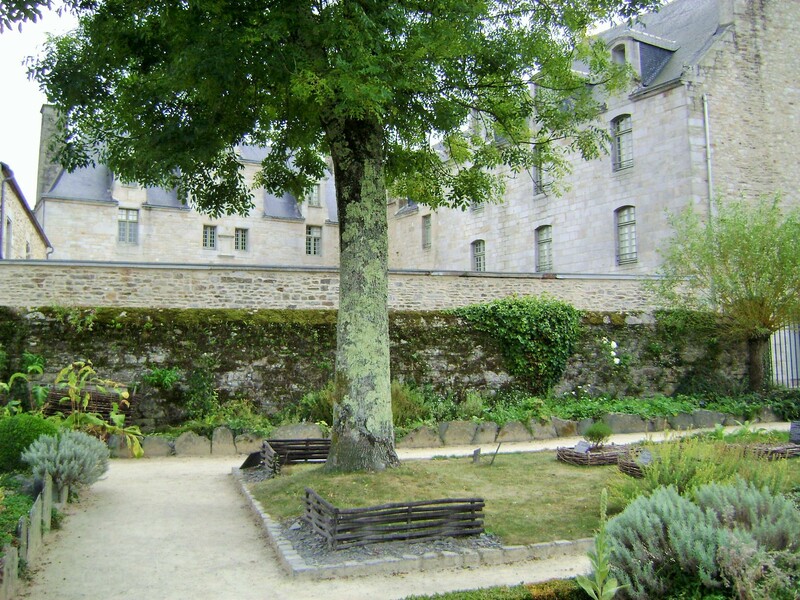 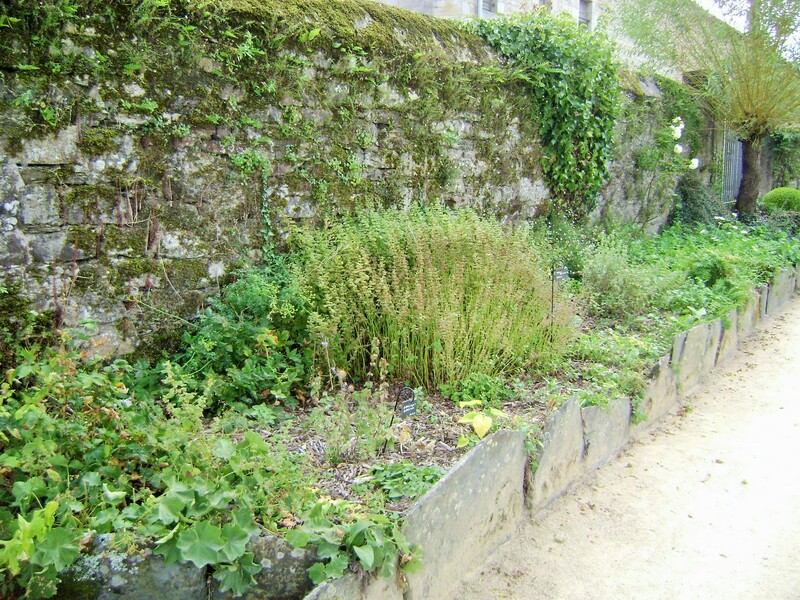 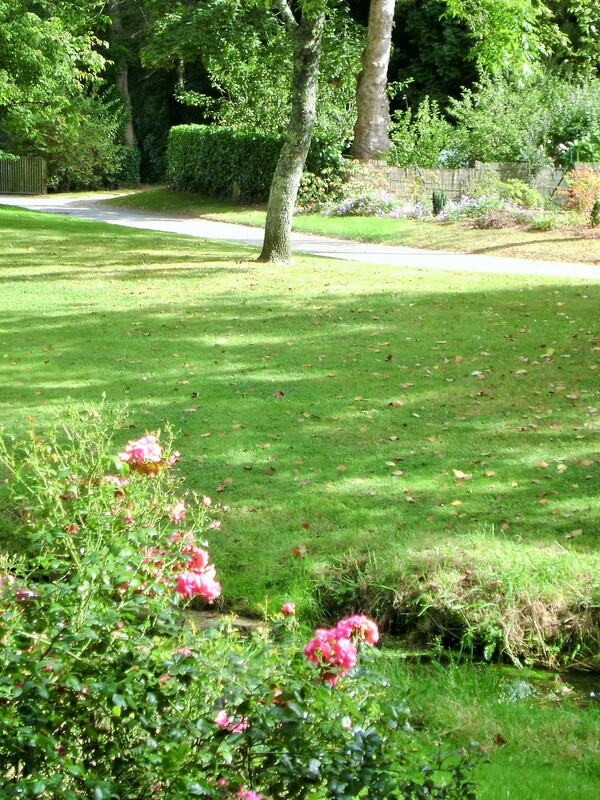 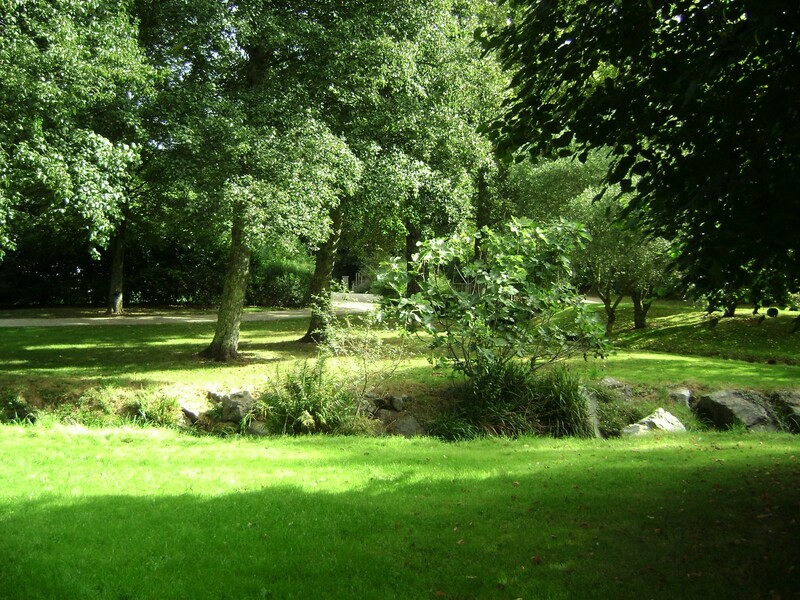 This site is of interest not only for the monastery itself but for a remarkable cloister unique in Brittany, large grounds with a pond, old washouse and integrating outdoor art exhibits, but also for its medicinal garden which has one of the largest collection of plants in Europe. 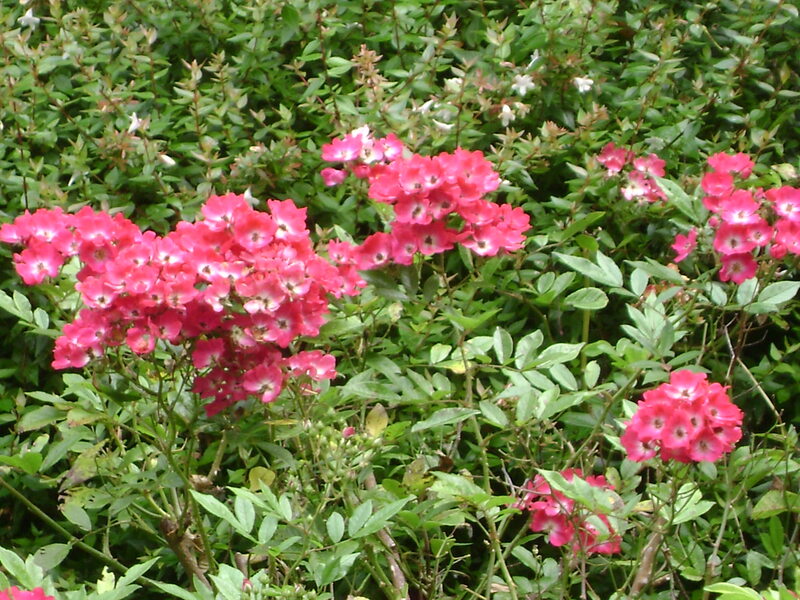 I am writing about these in separate posts. 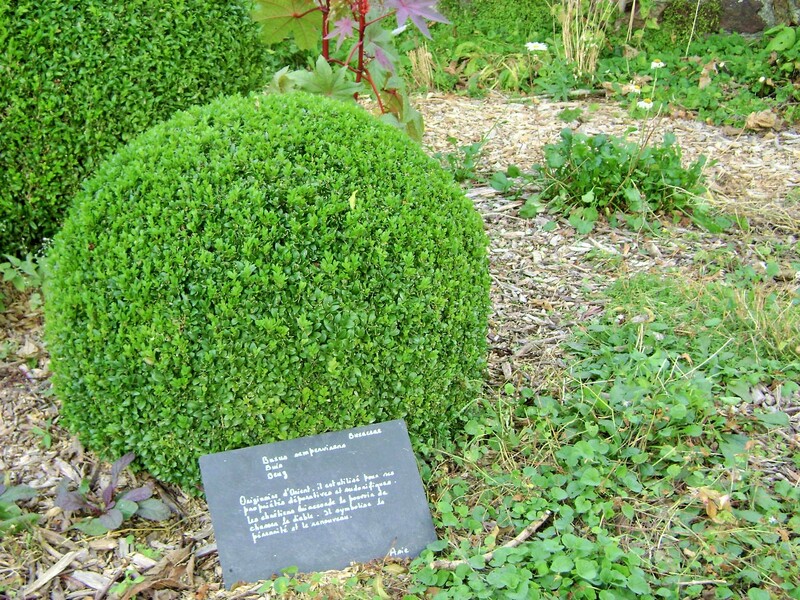 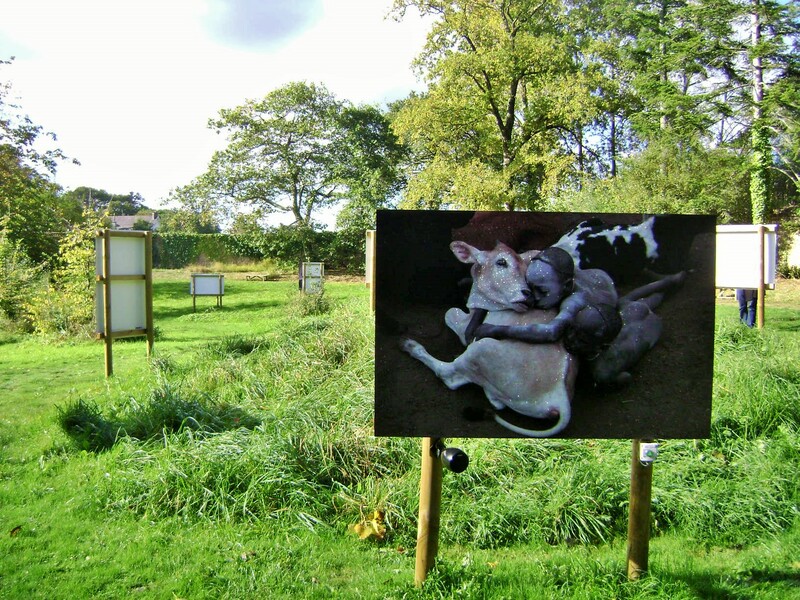 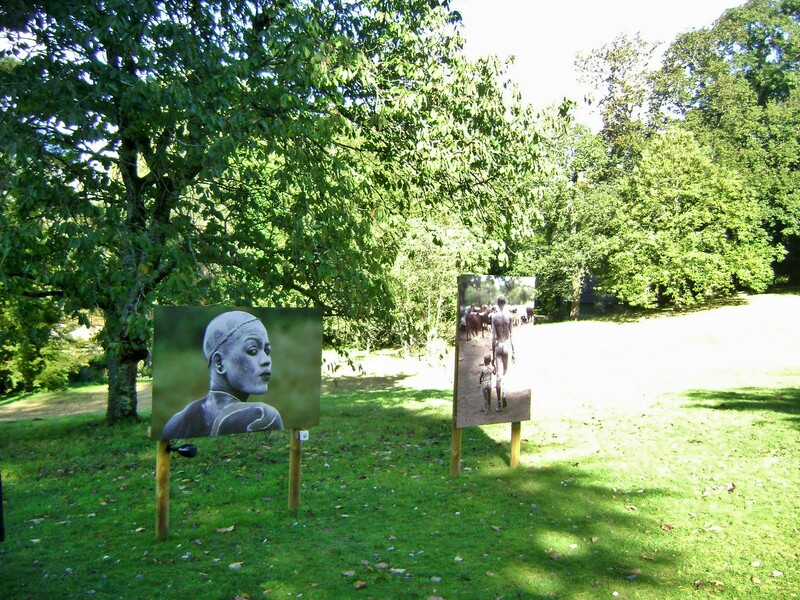 In this post, I am featuring the grounds and art exhibit. 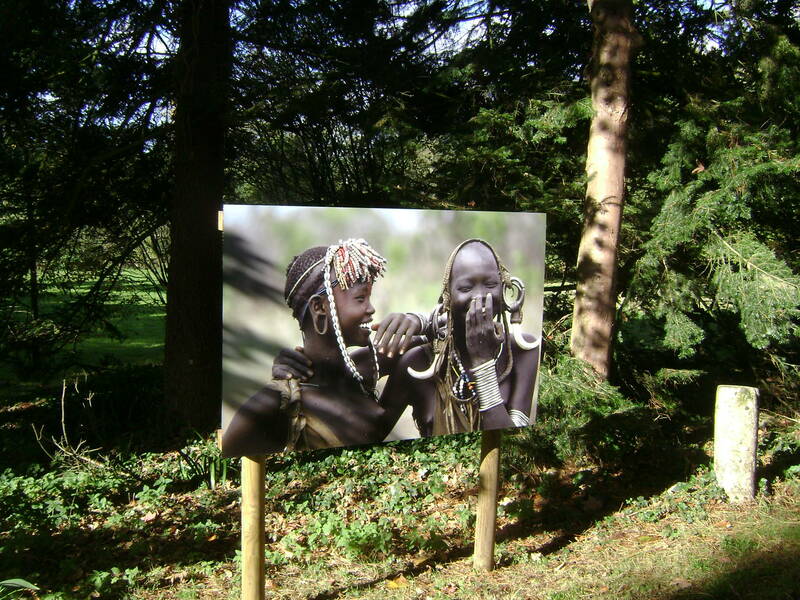 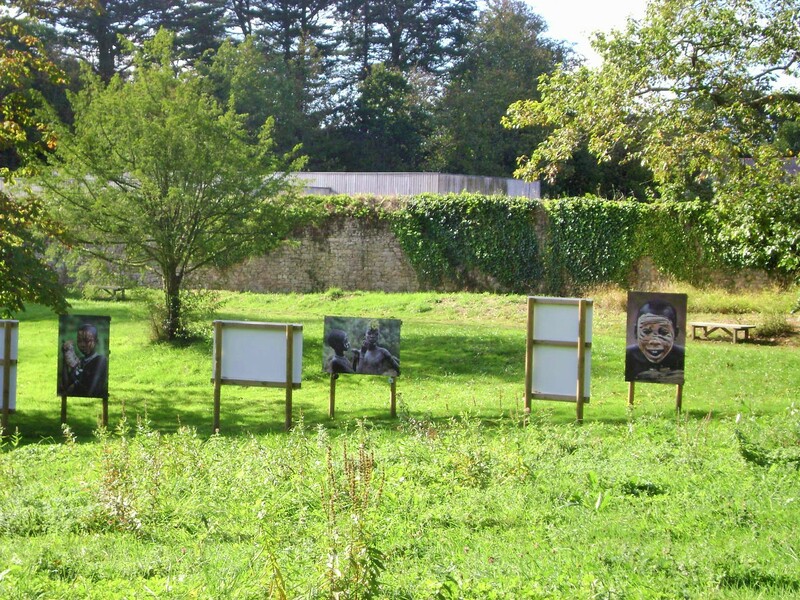 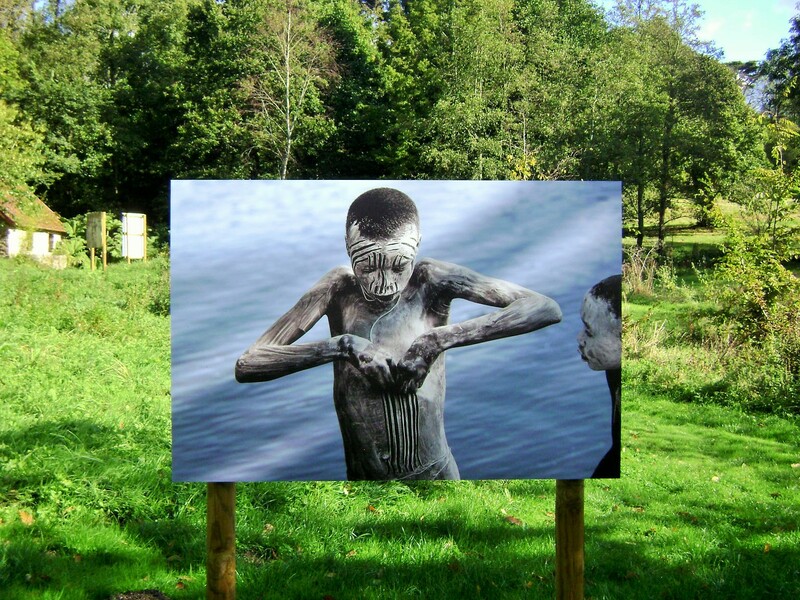 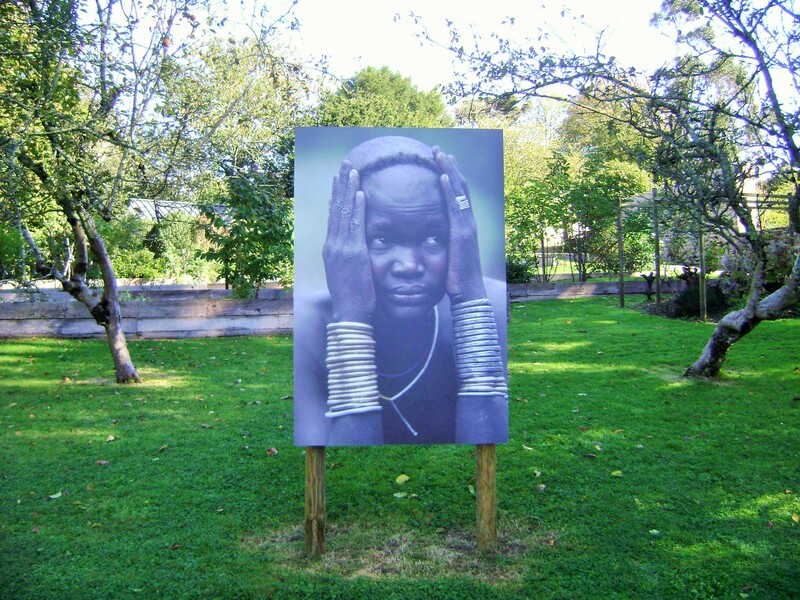 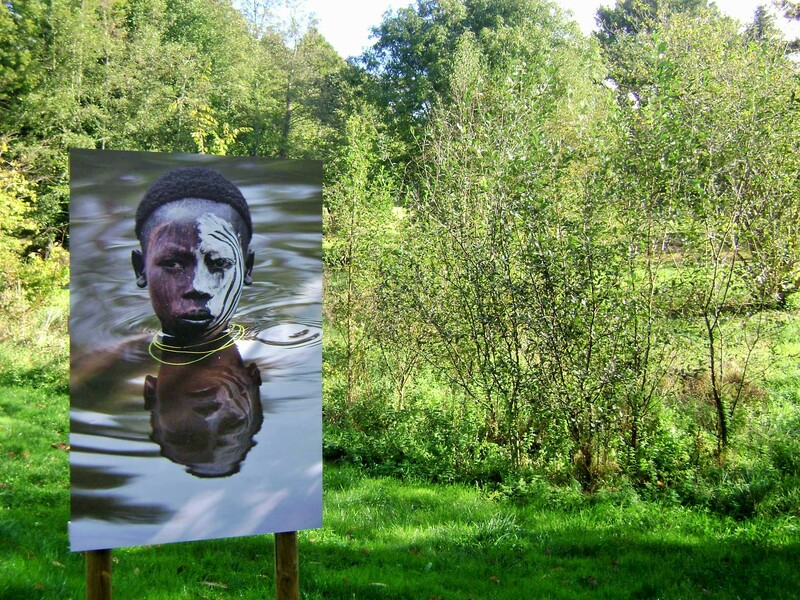 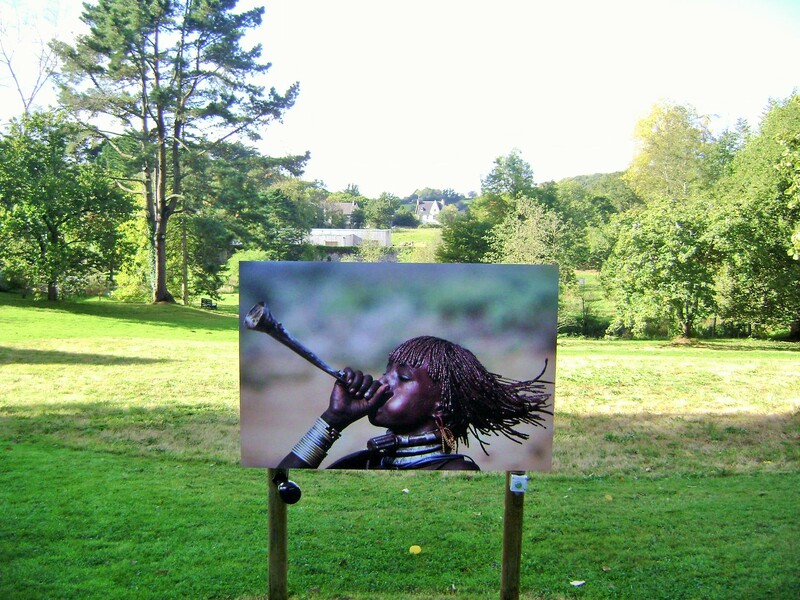 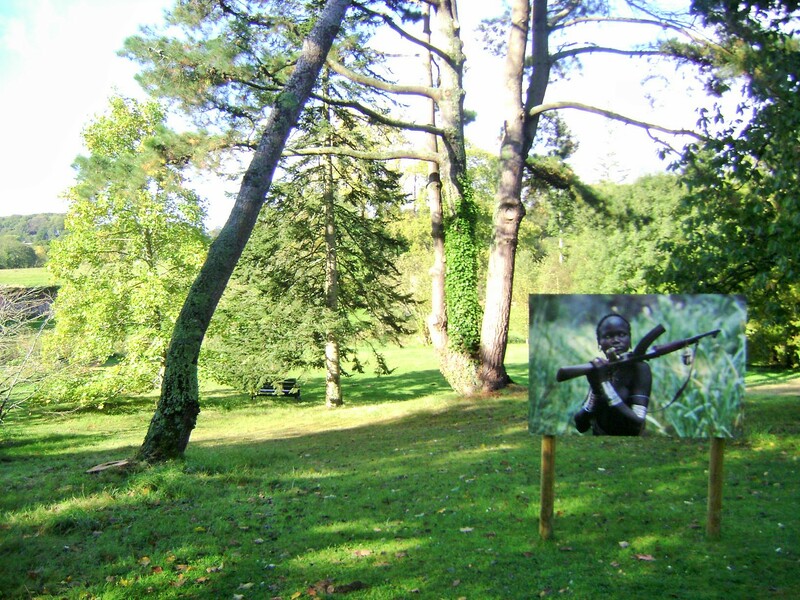 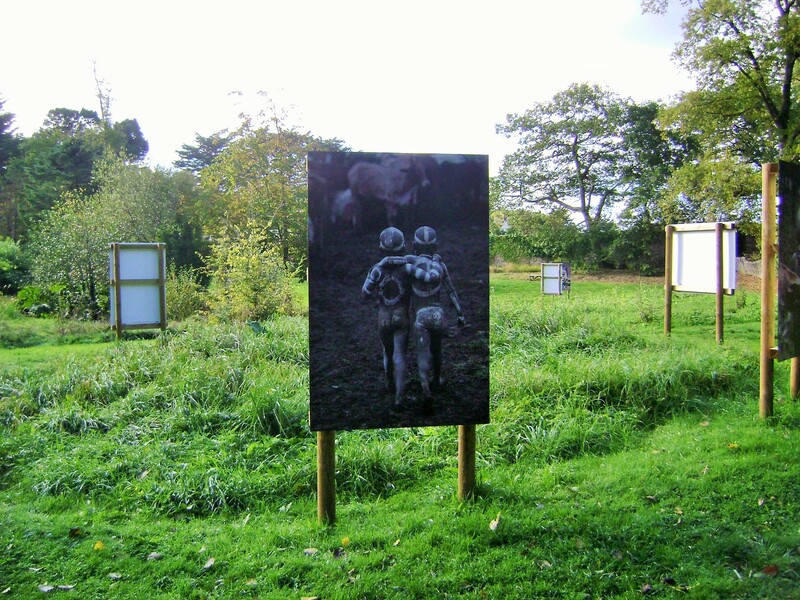 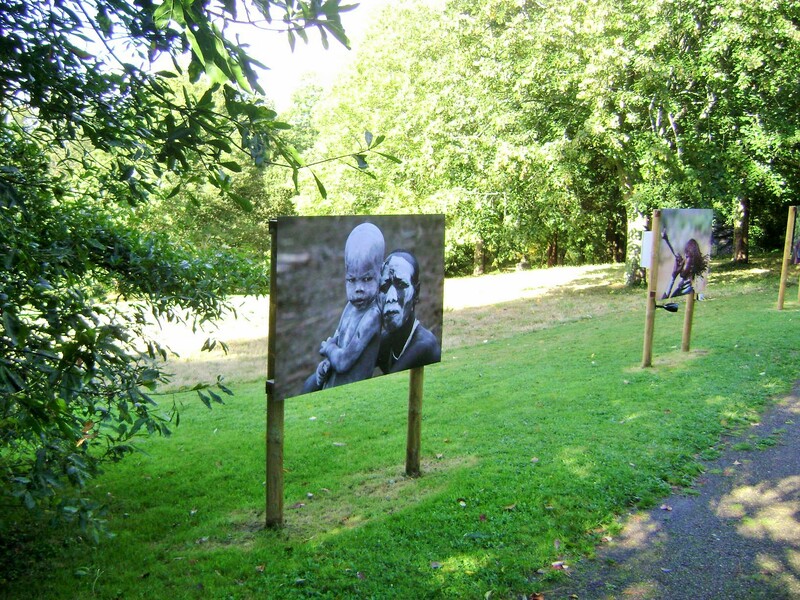 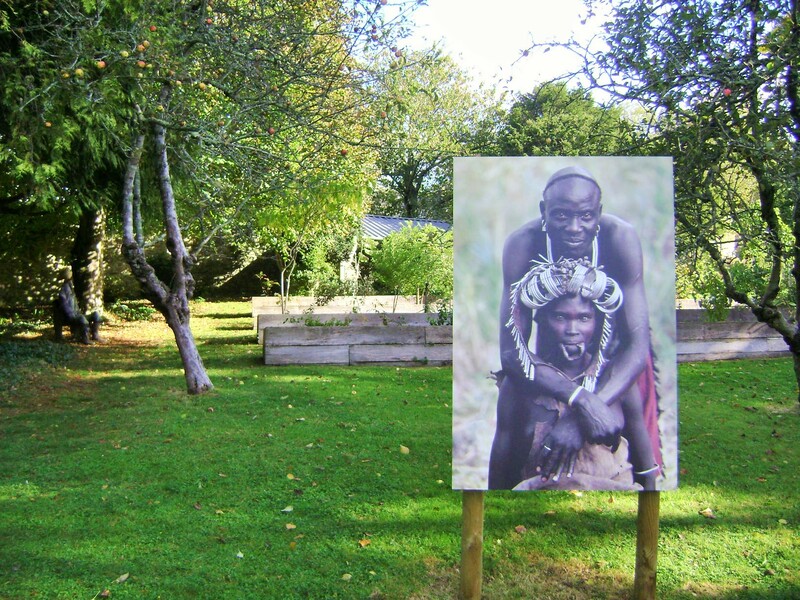 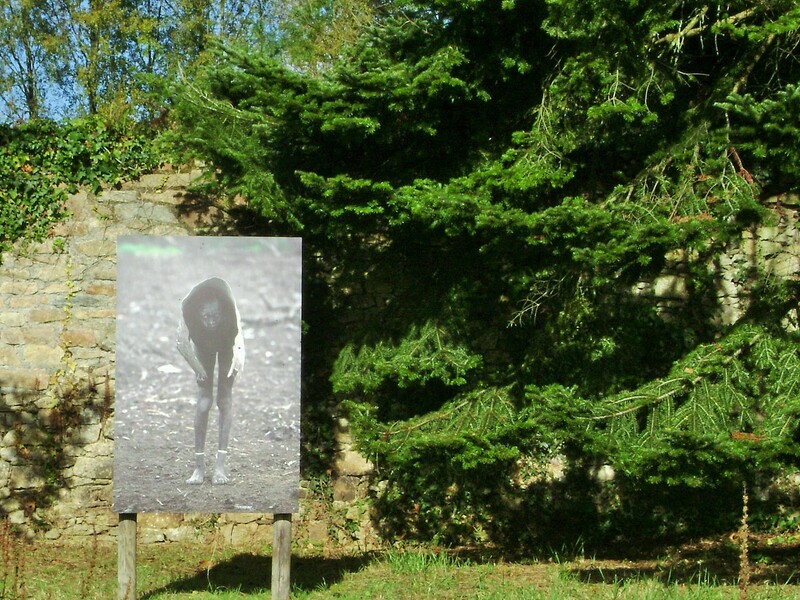 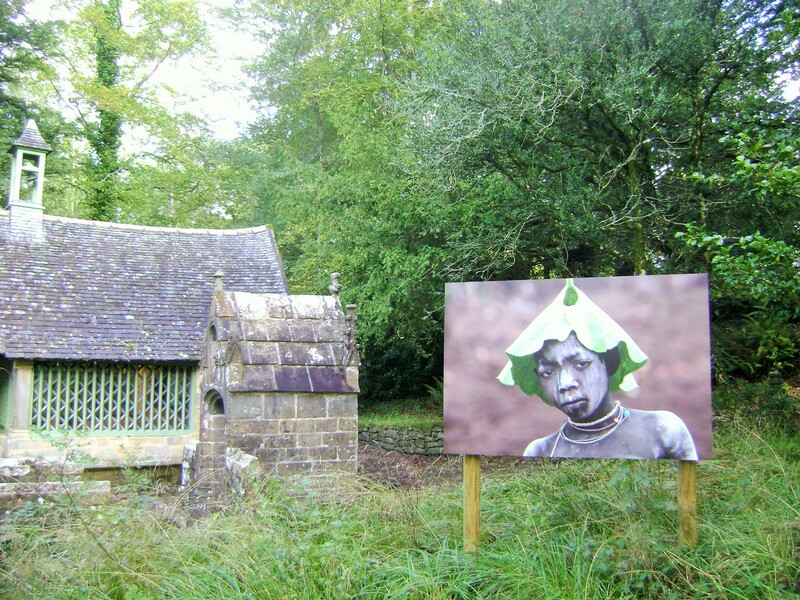 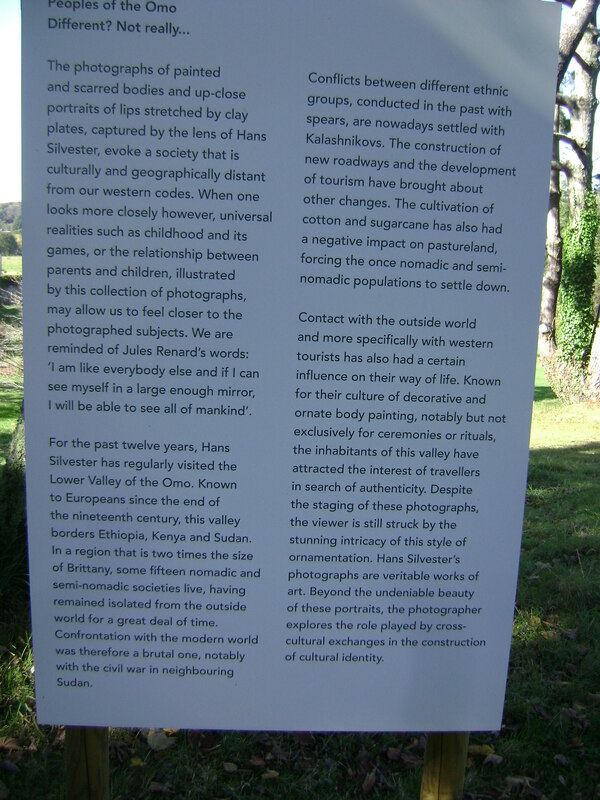 The grounds of the abbaye form an unexpected background for large scale photos of the Omi people by photographer Hans Sylvester. 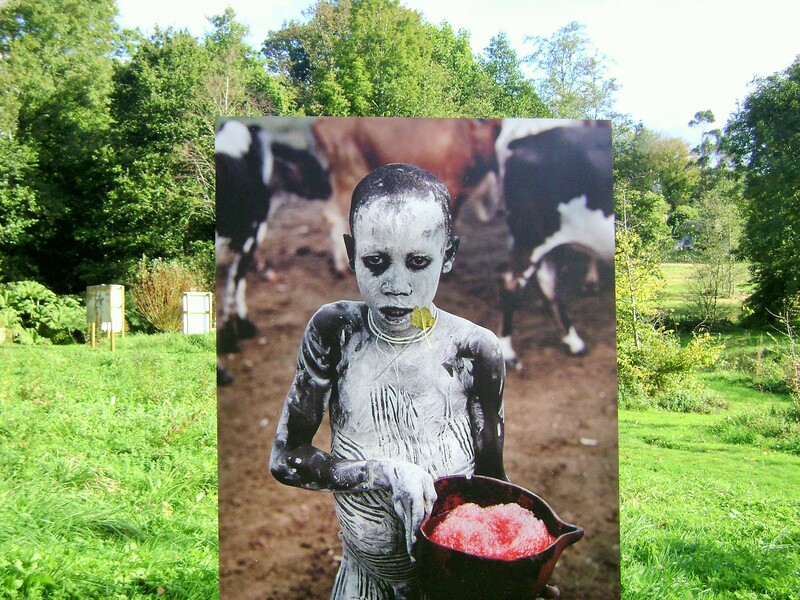 Showing people who are so strikingly different from us at first glance, he also captures a human commonality in everyday gestures and occupations. 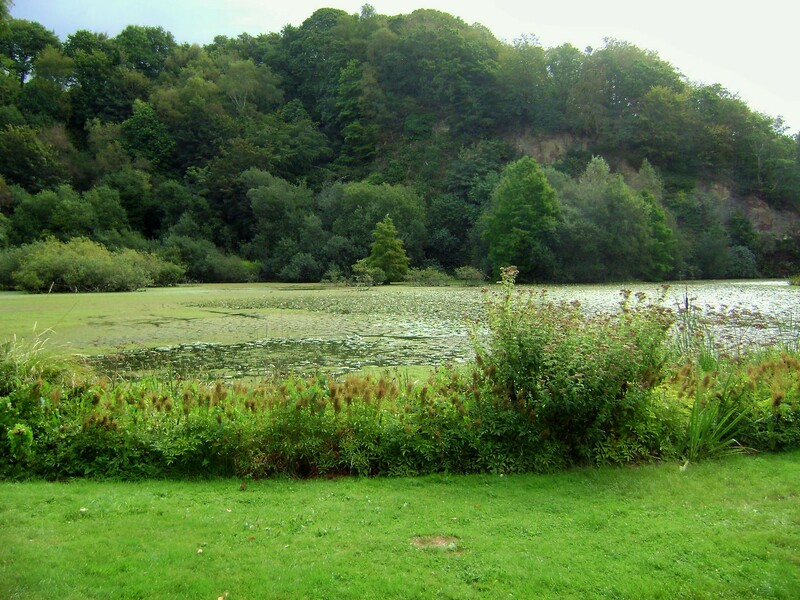 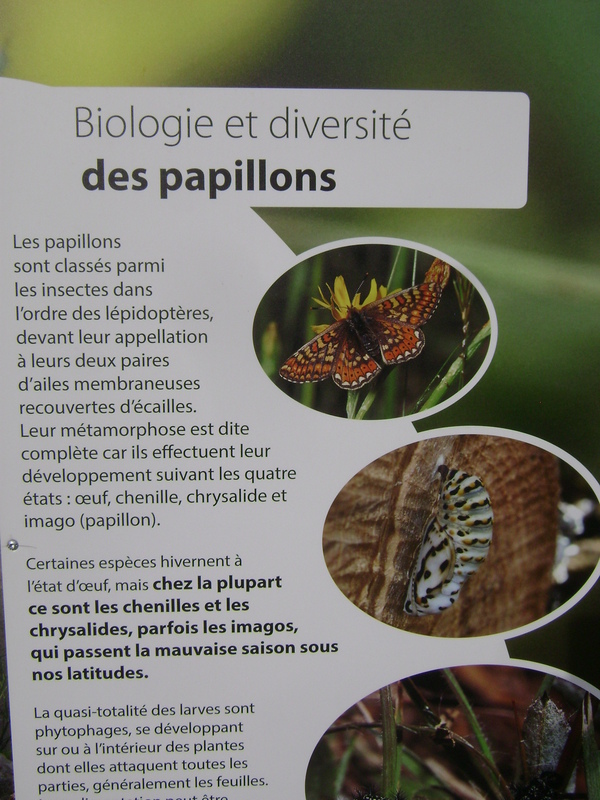 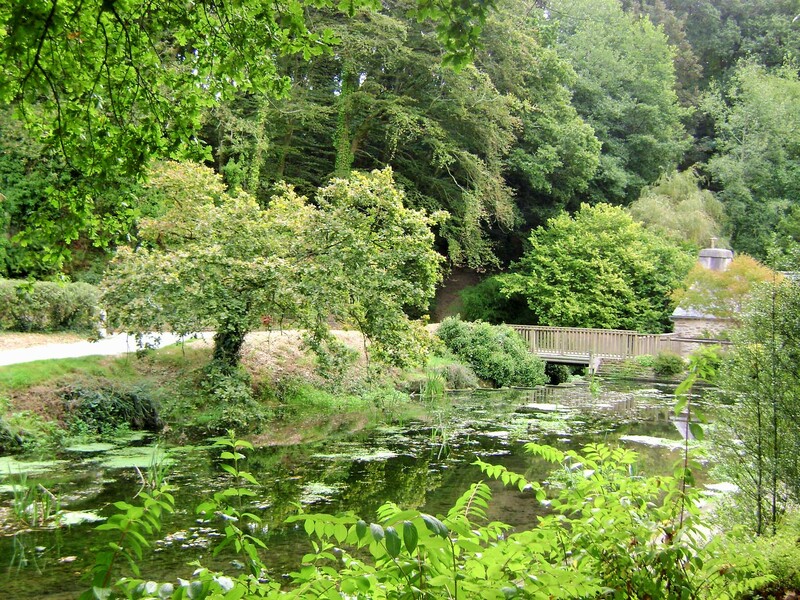 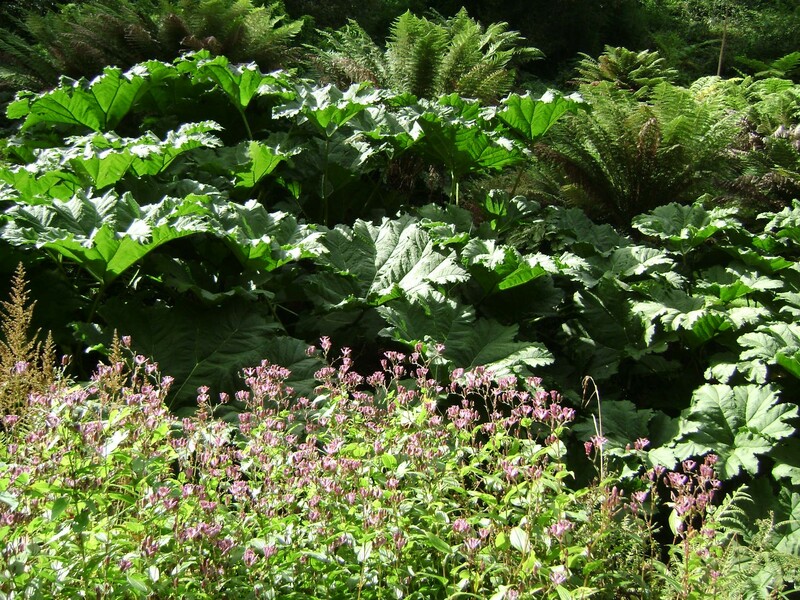 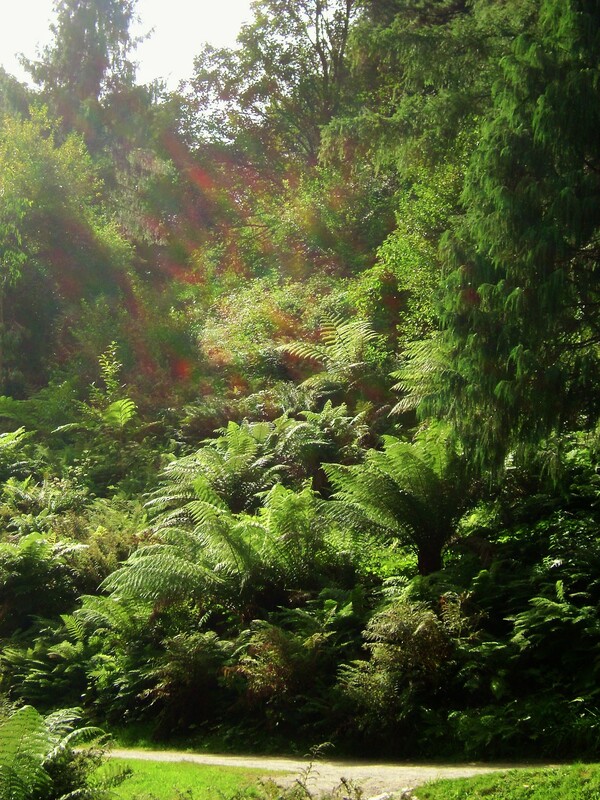 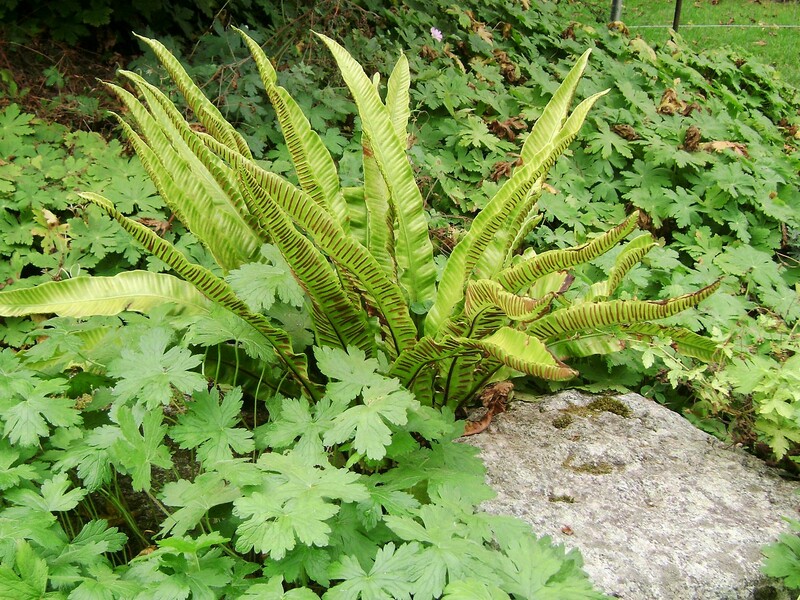 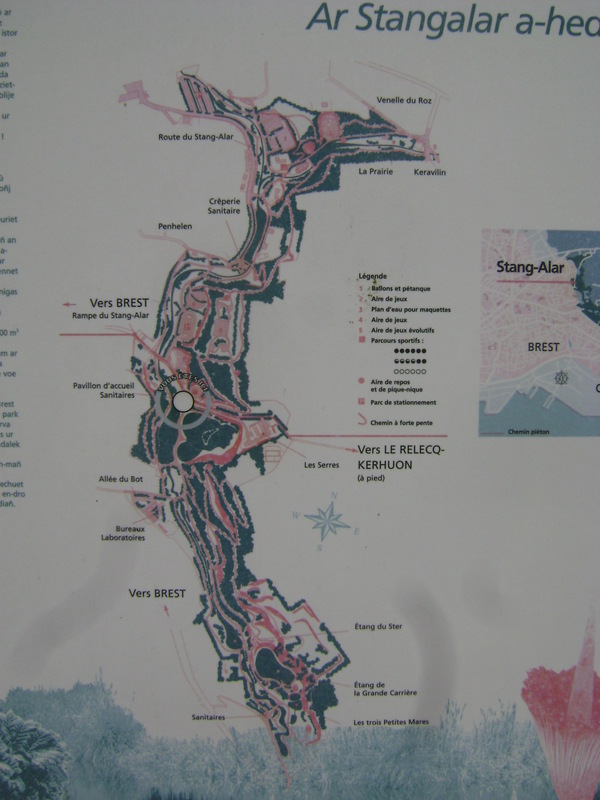 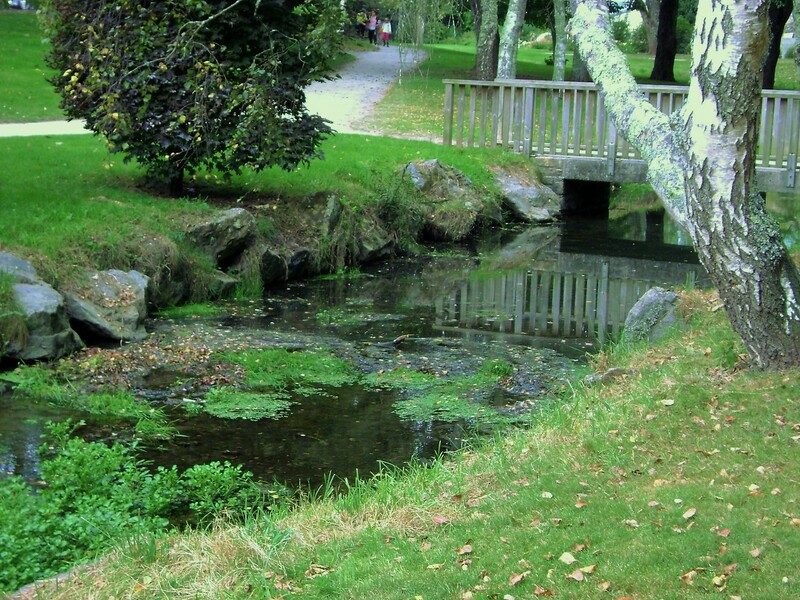 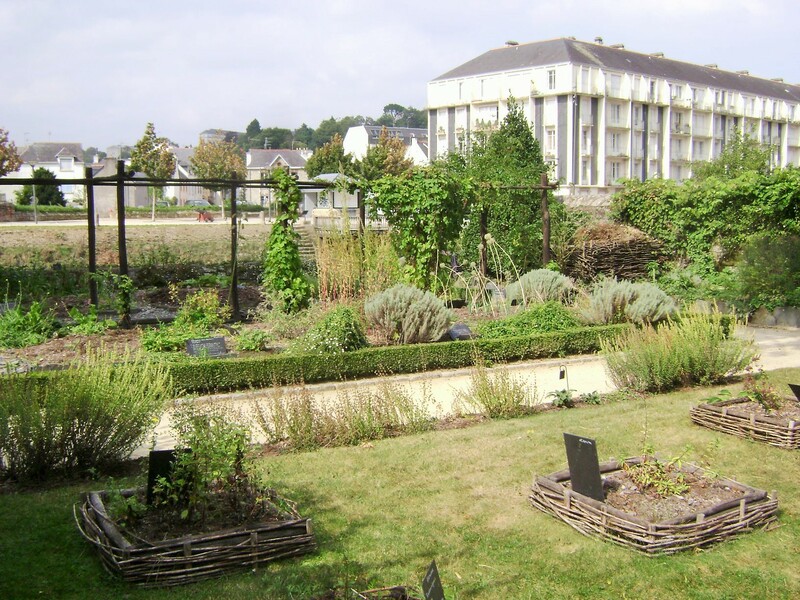 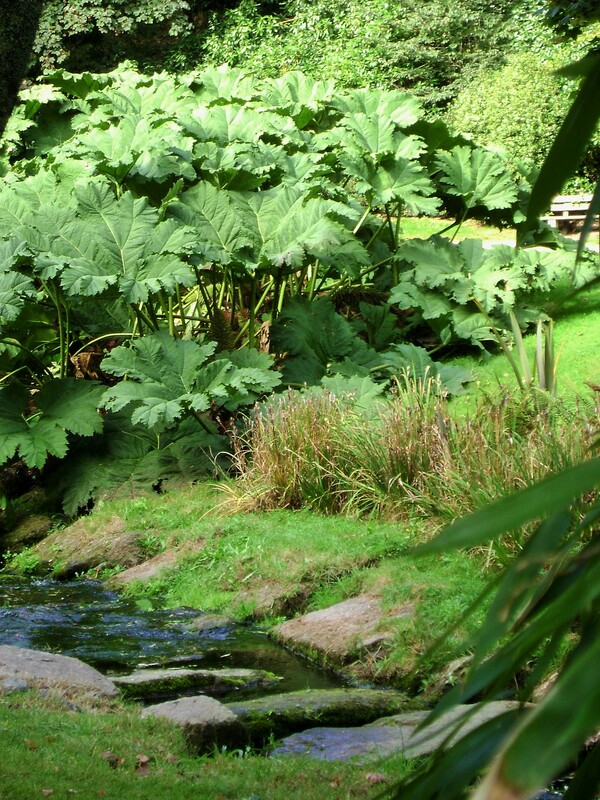 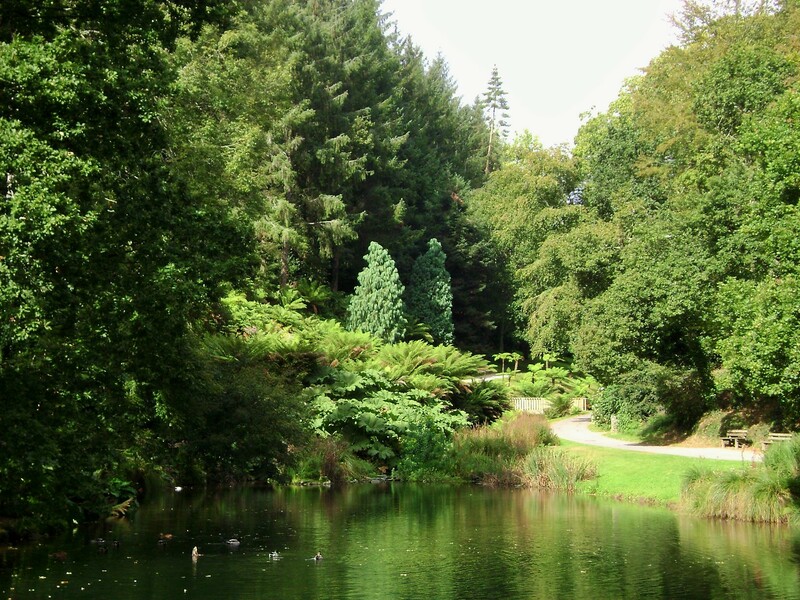 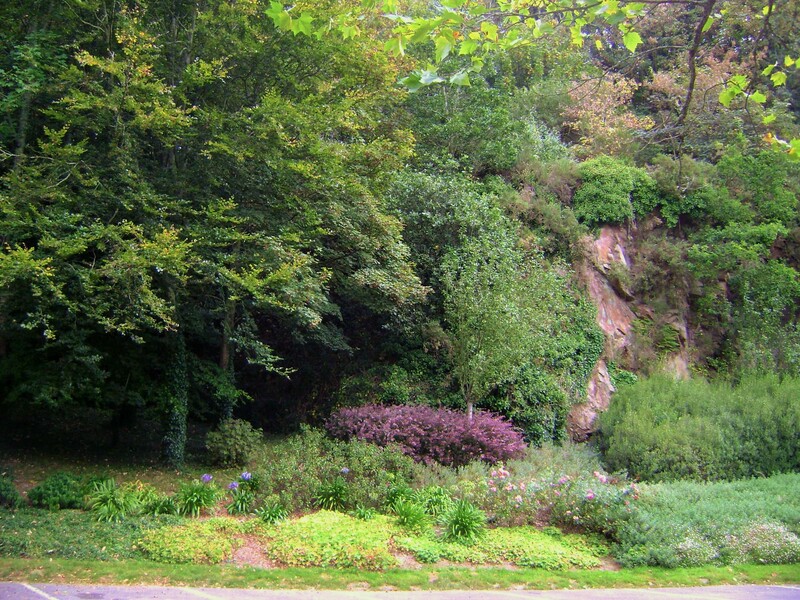 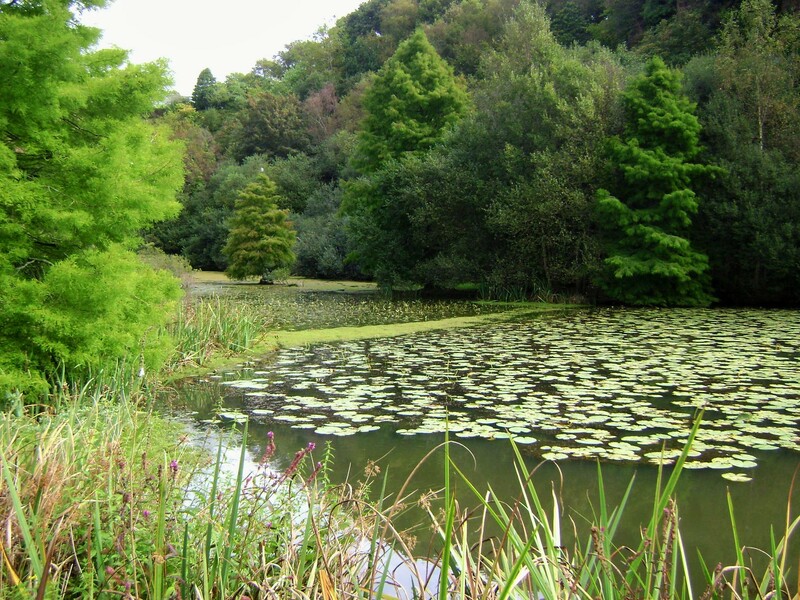 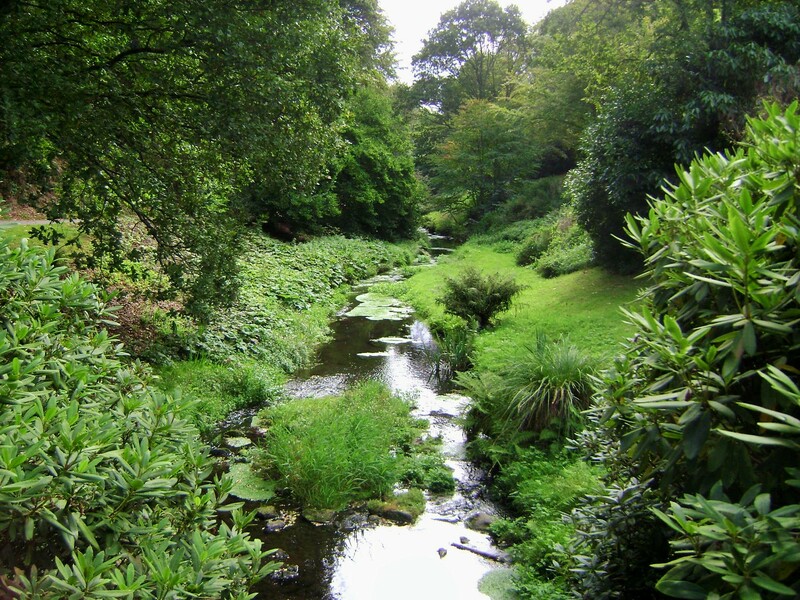 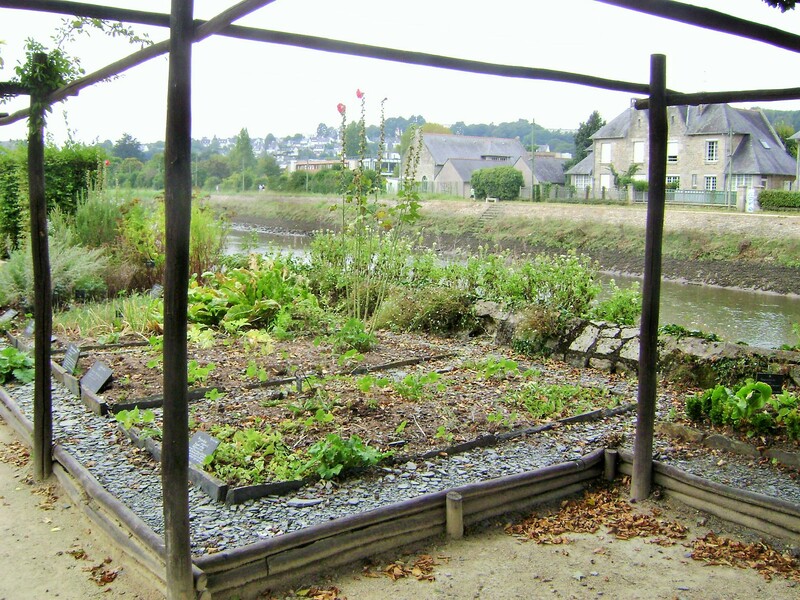 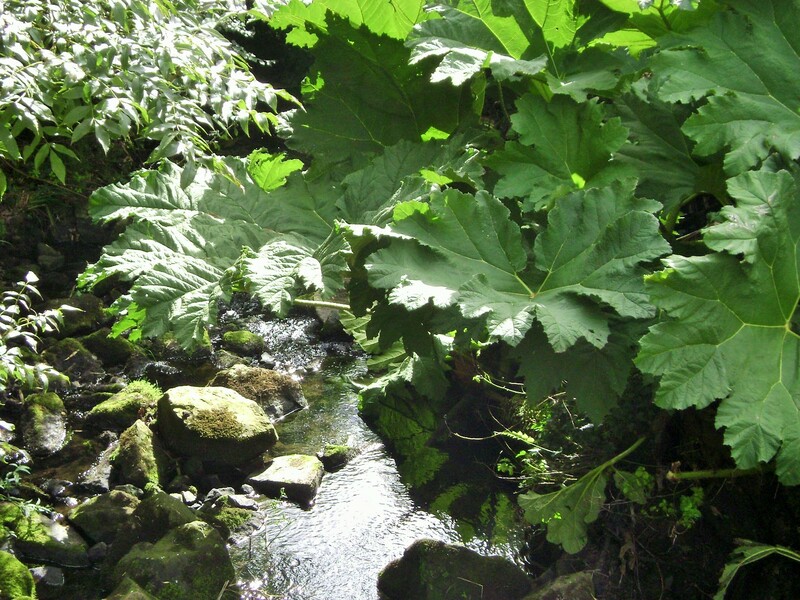 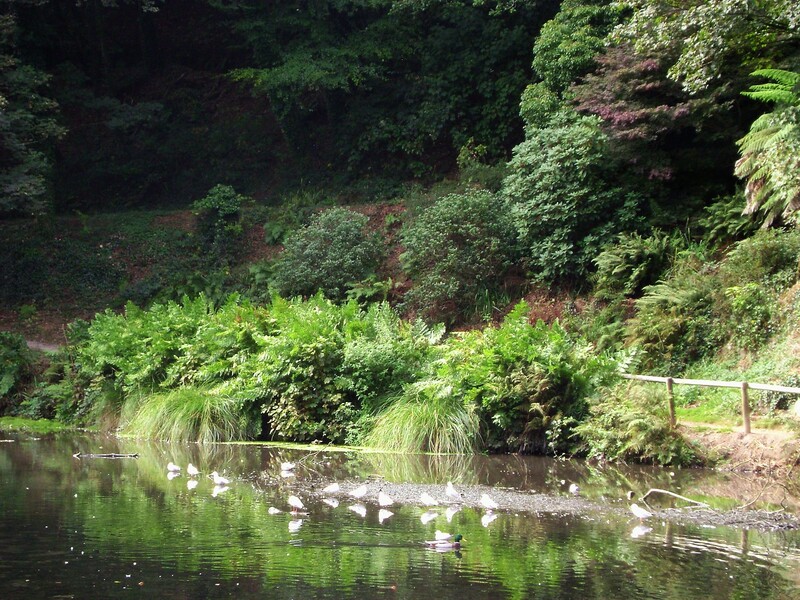 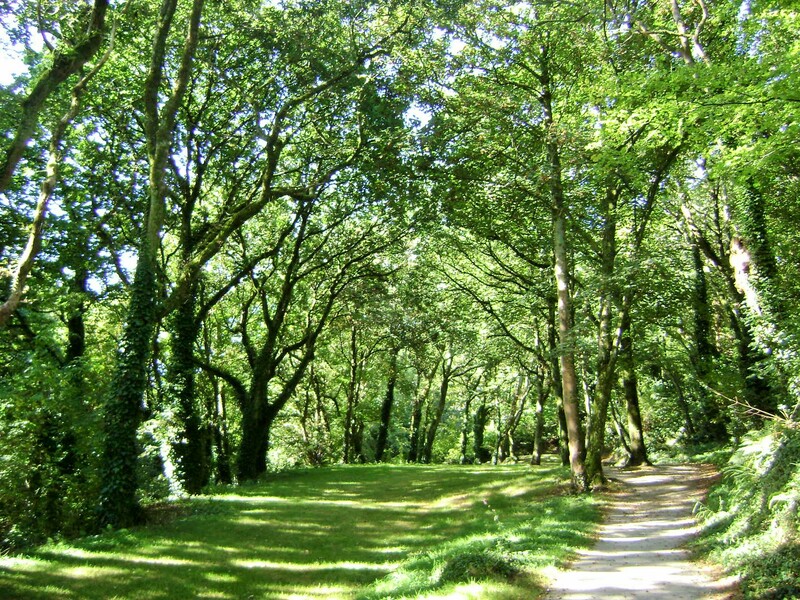 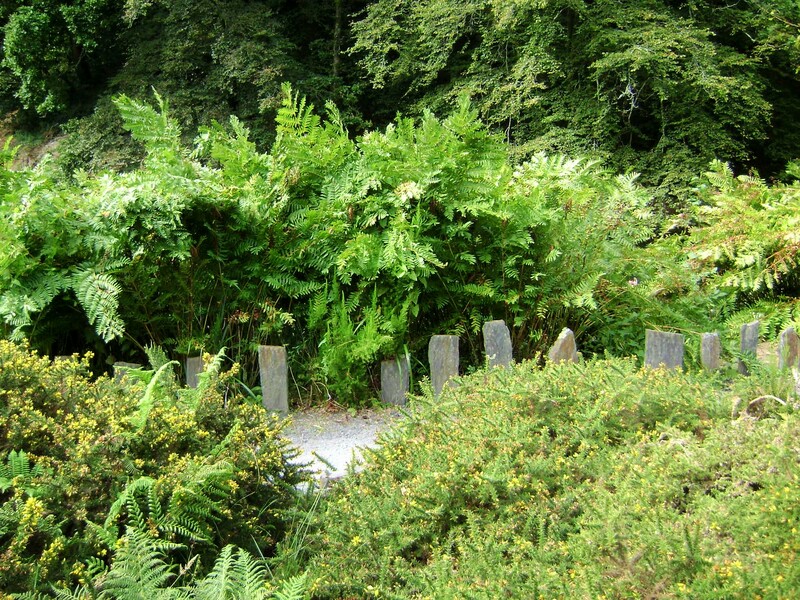 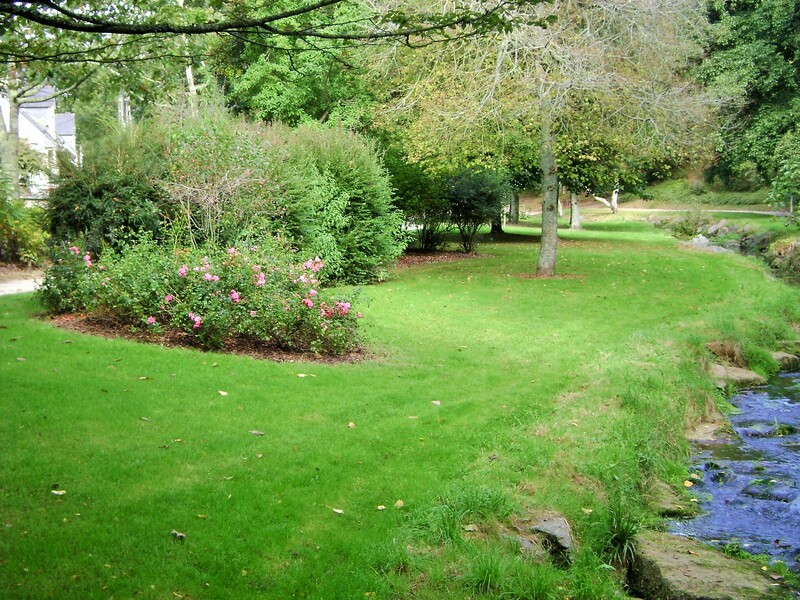 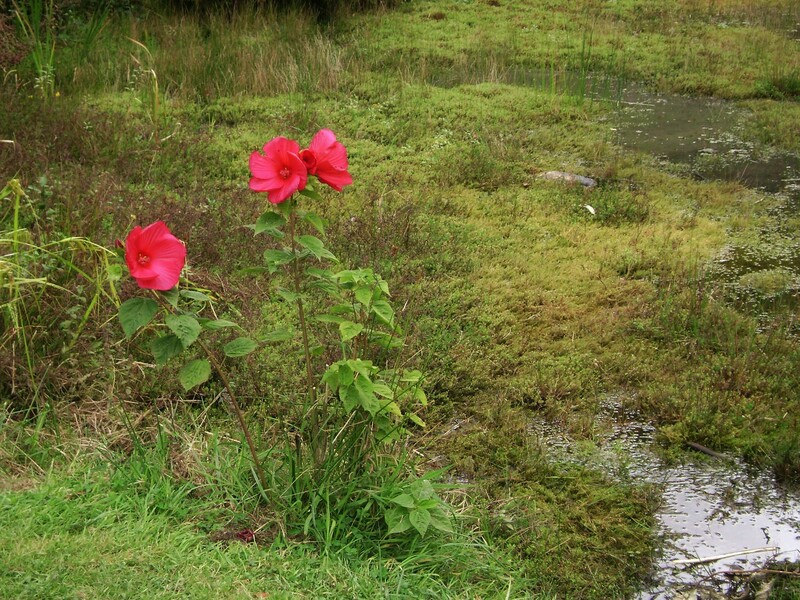 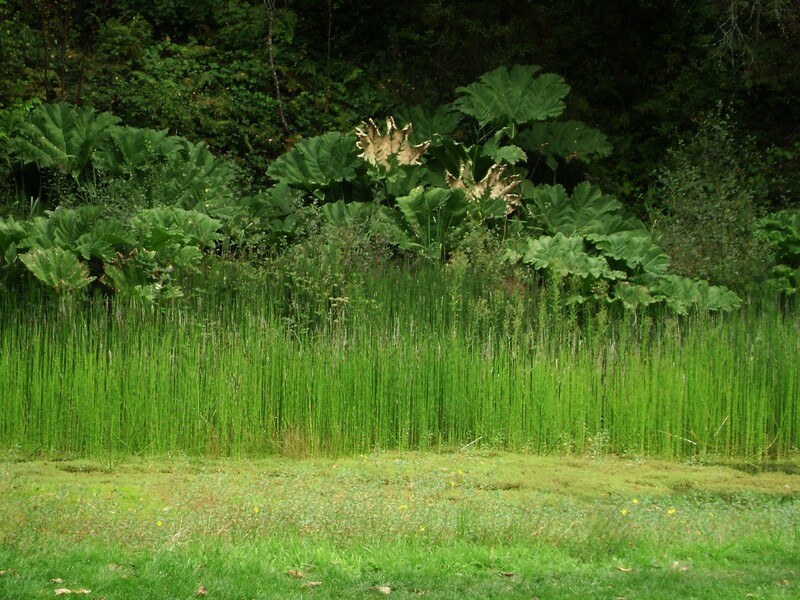 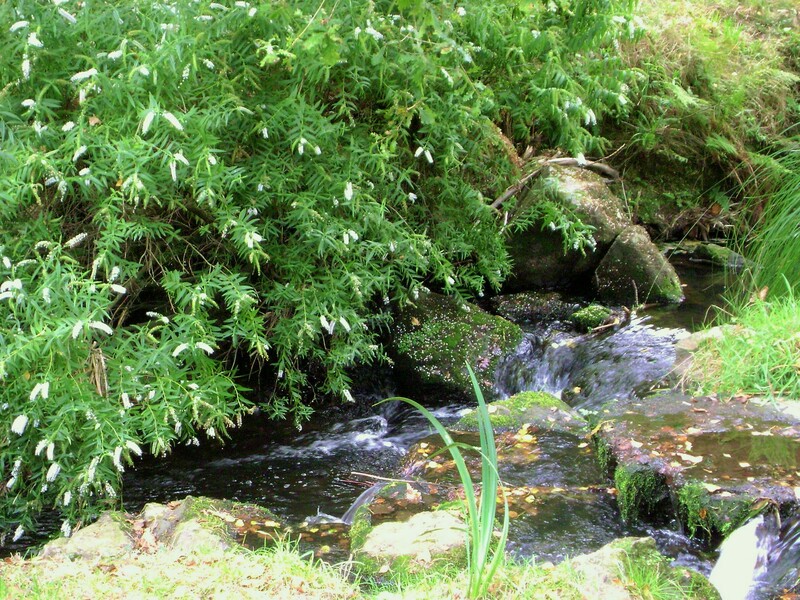 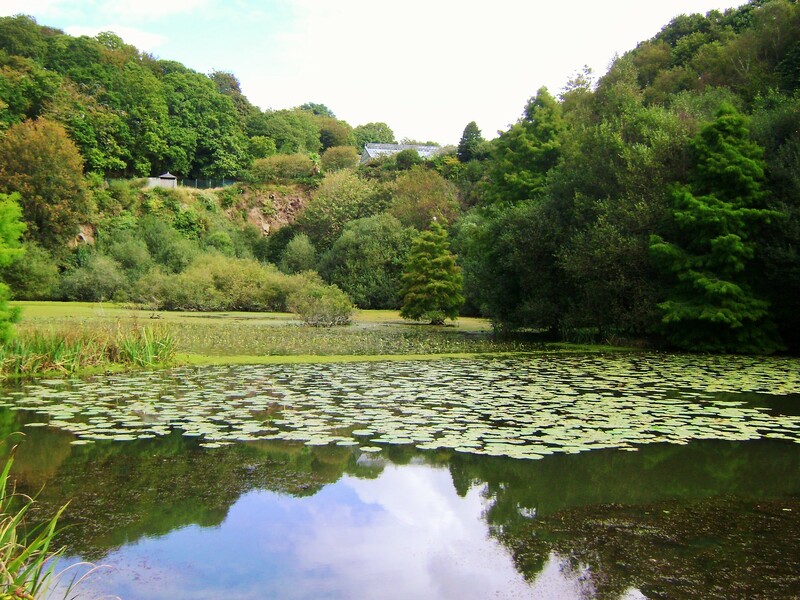 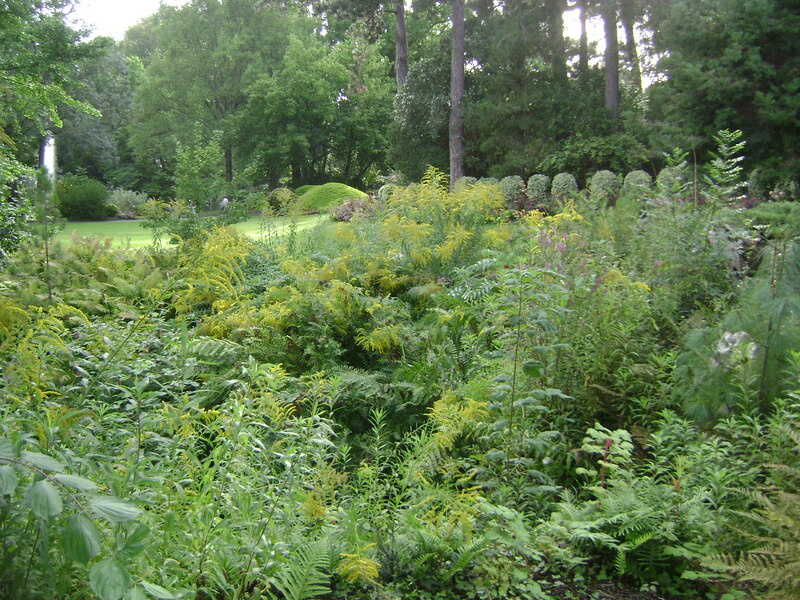 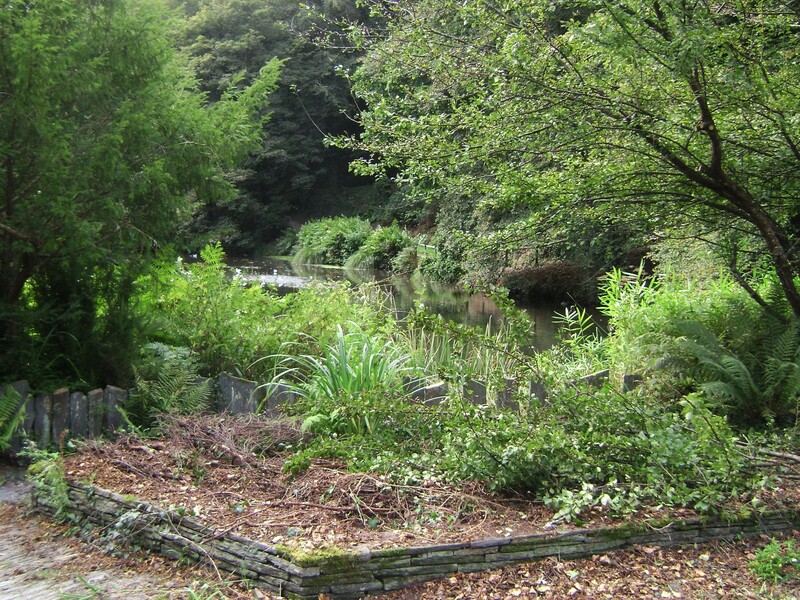 In northern Brittany, the Botanical Gardens in Brest enjoy a privileged location in a small valley with a stream throughout, and creating a microclimate allowing endangered species to grow with additional protection. 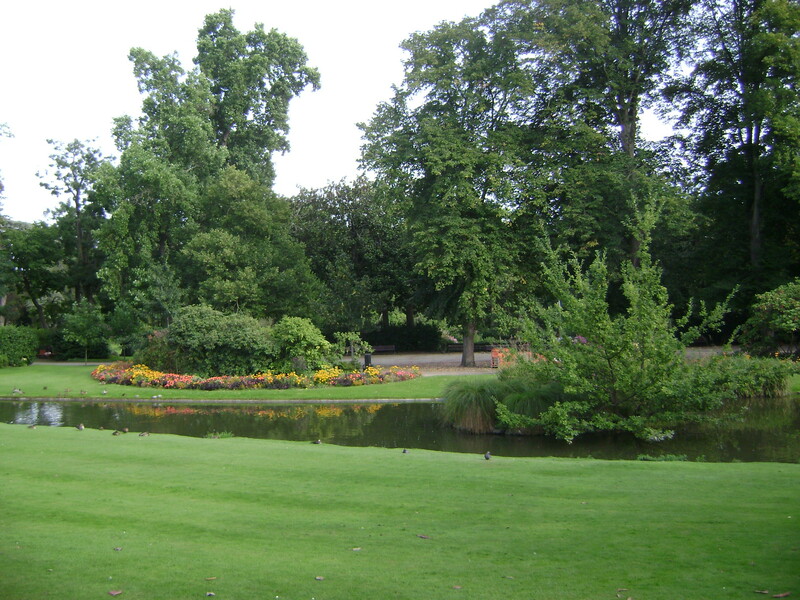 Long and narrow, these gardens are divided into the park area at one end, end the botanical gardens proper at the other. 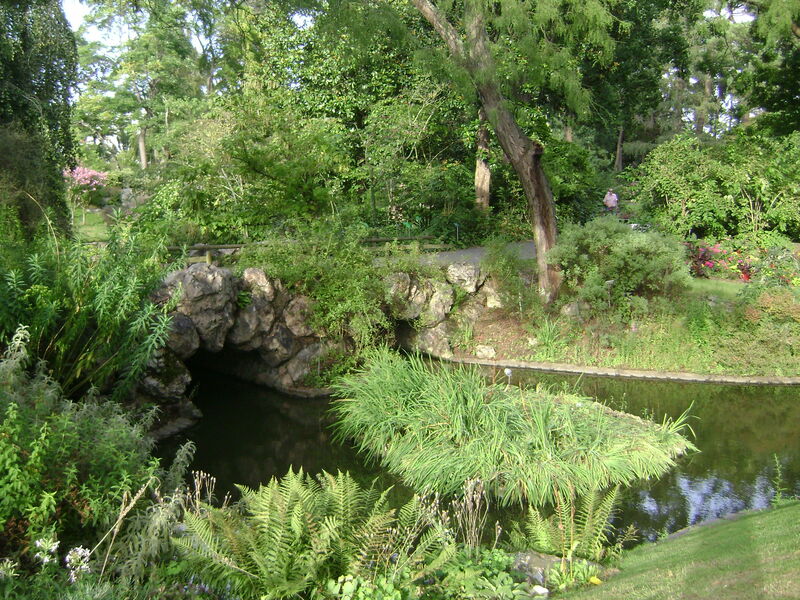 In this second post, I am featuring the botanical gardens, which are largely dedicated to the preservation of endangered species of plants. 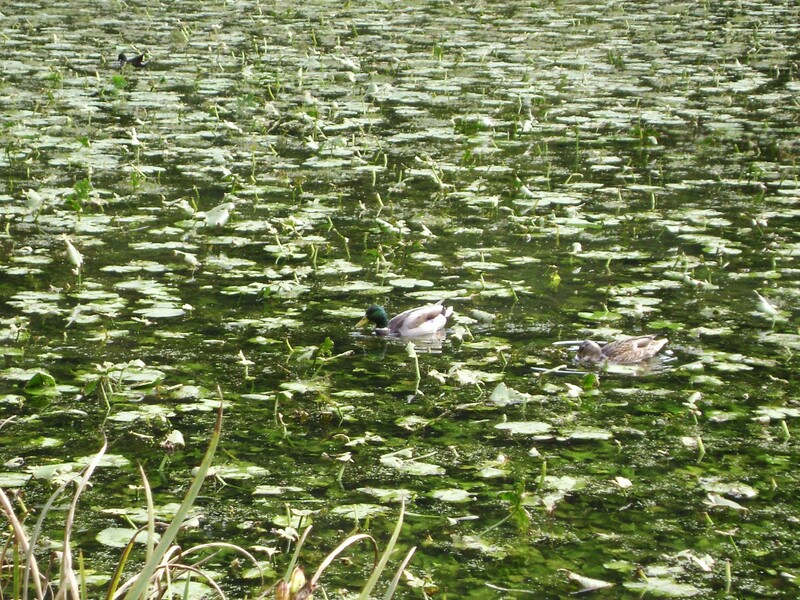 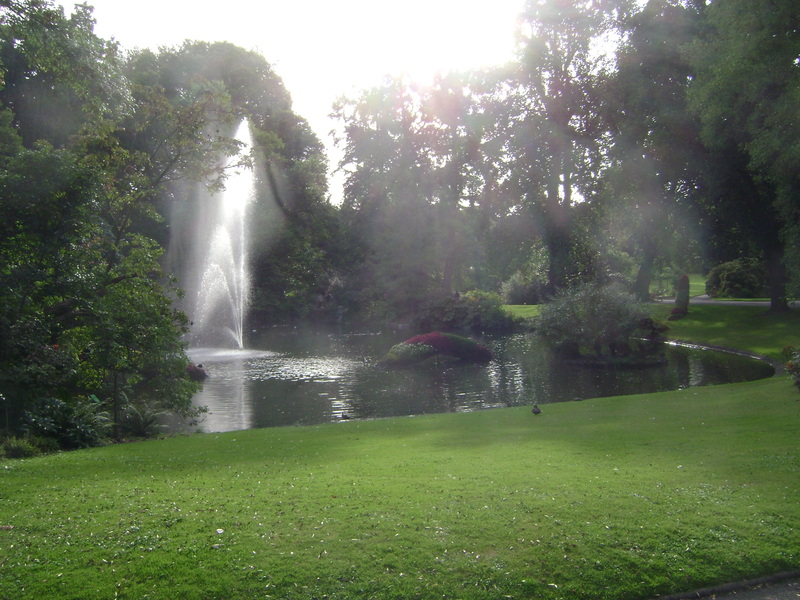 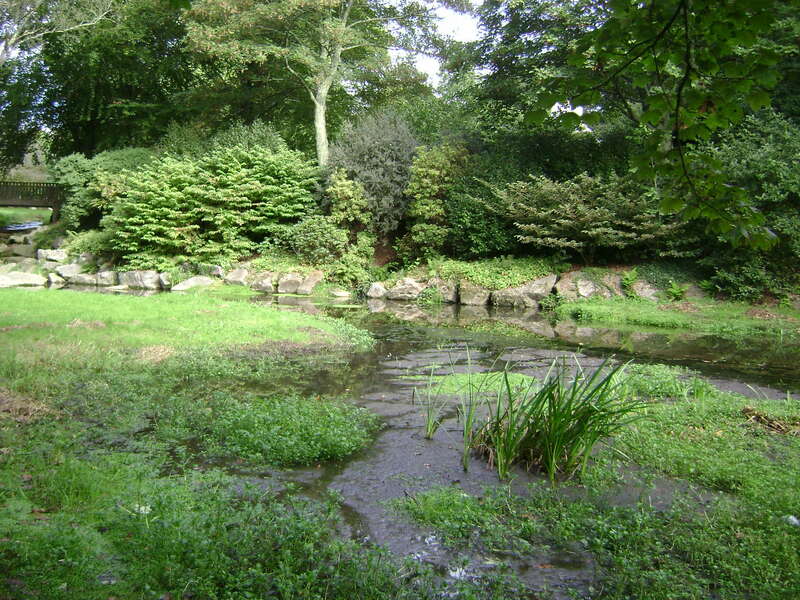 The water features here are more extensive than in the park area, with large ponds and ducks in addition to the stream running the length of the park. 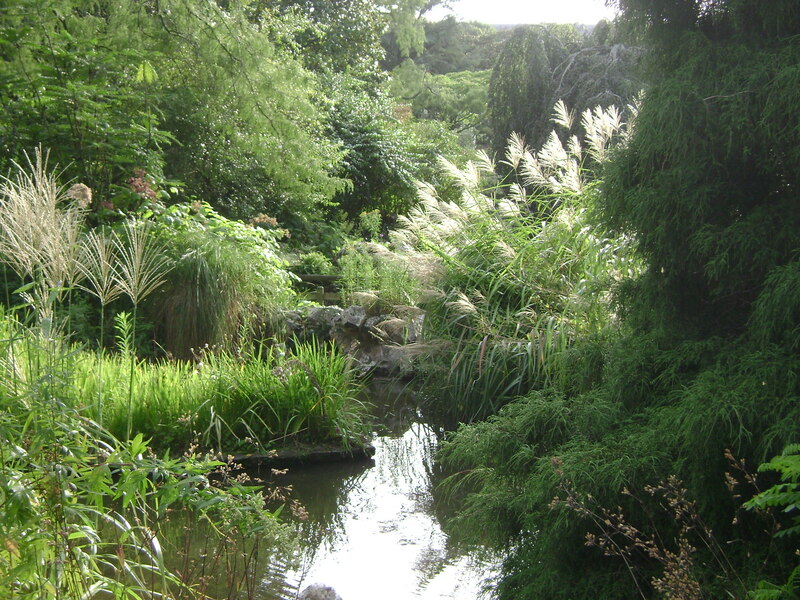 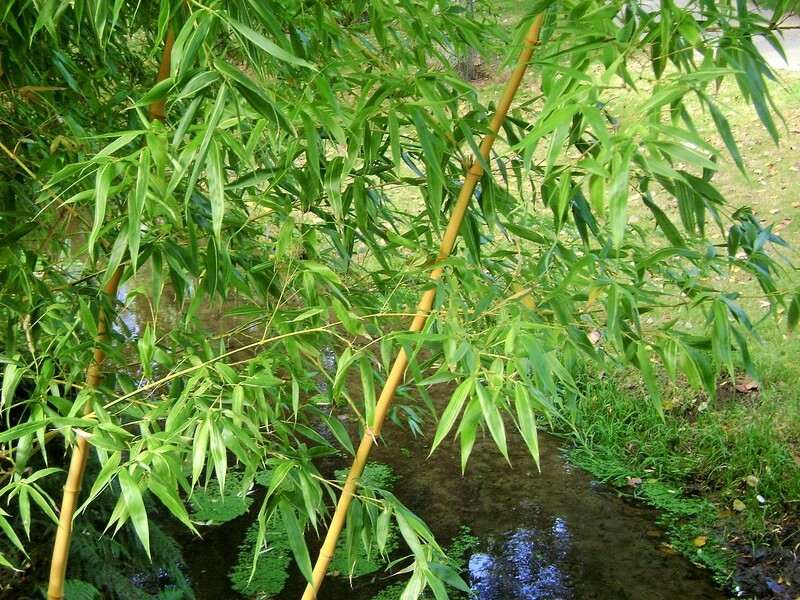 Here again, the areas around the stream are reminiscent of Japanese rock gardens, and landscaped with a profusion of bridges, ferns or bamboo groves. 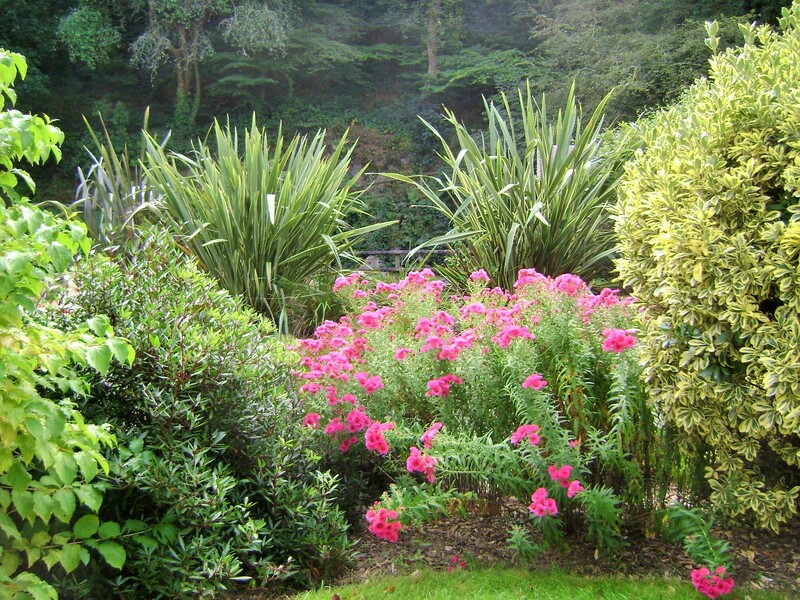 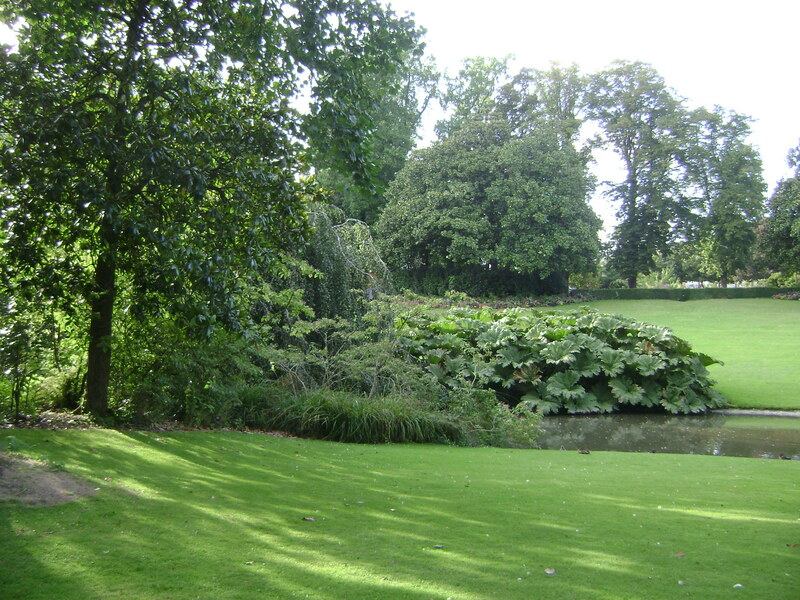 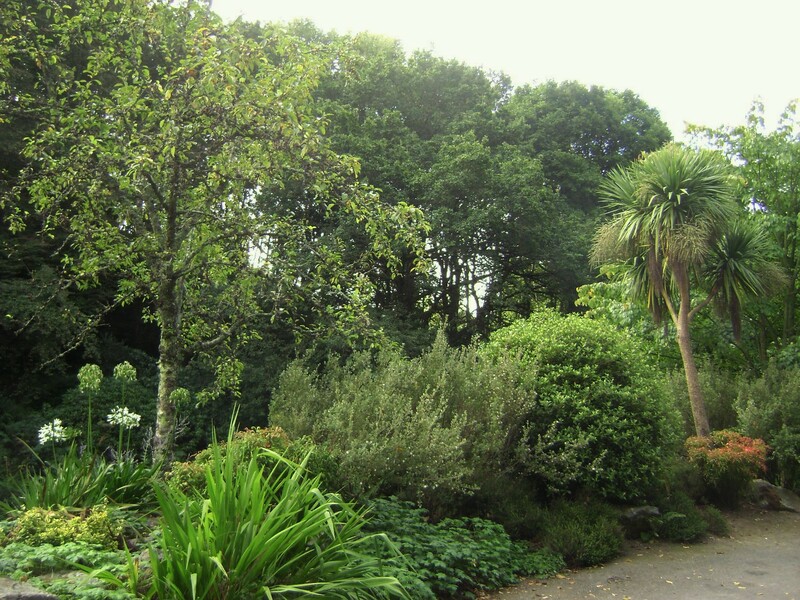 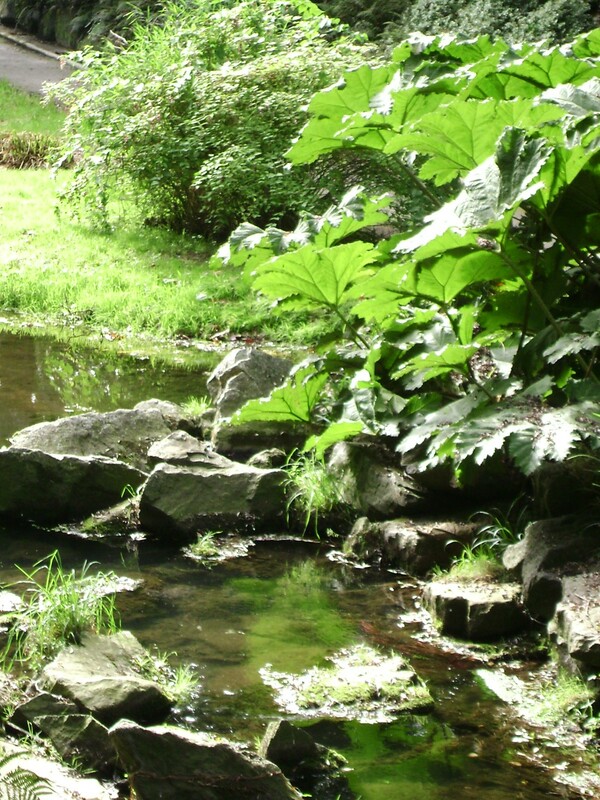 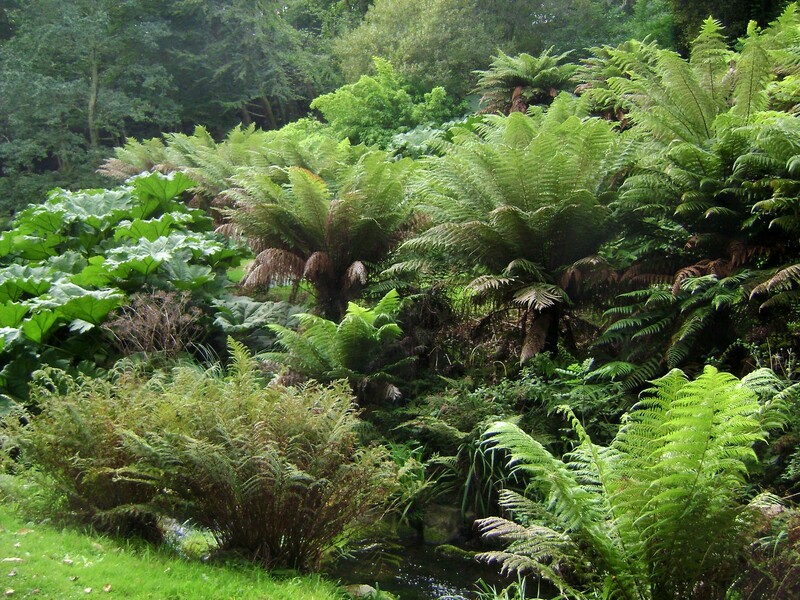 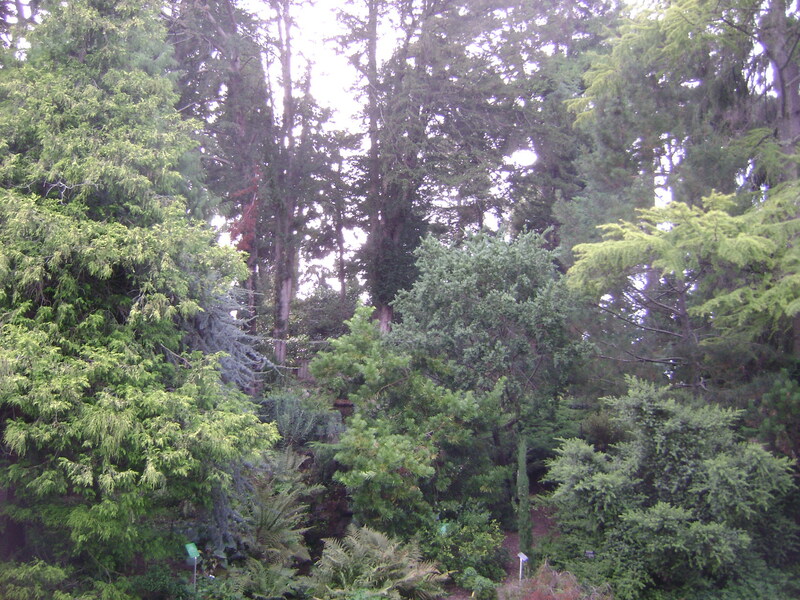 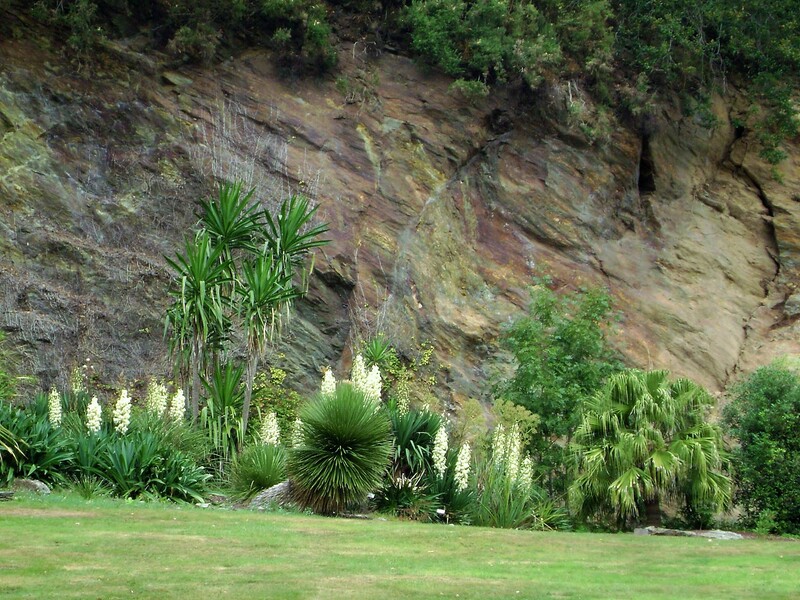 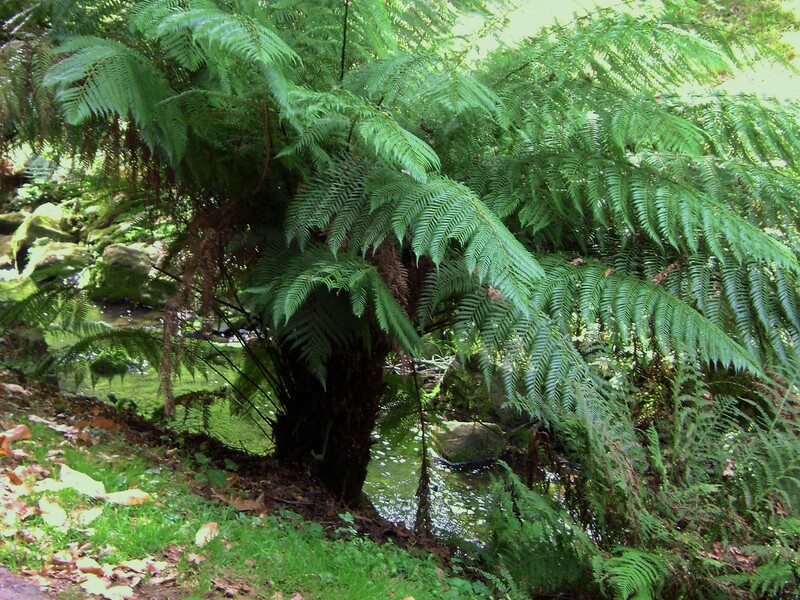 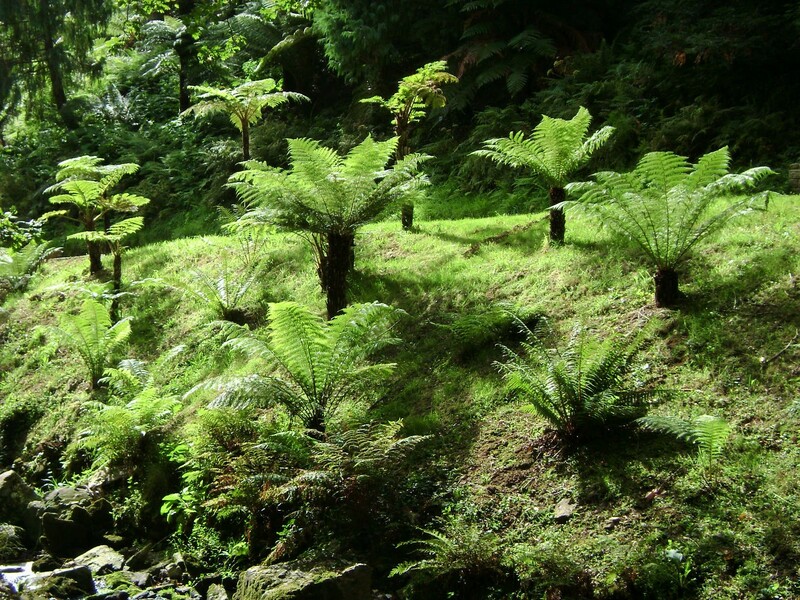 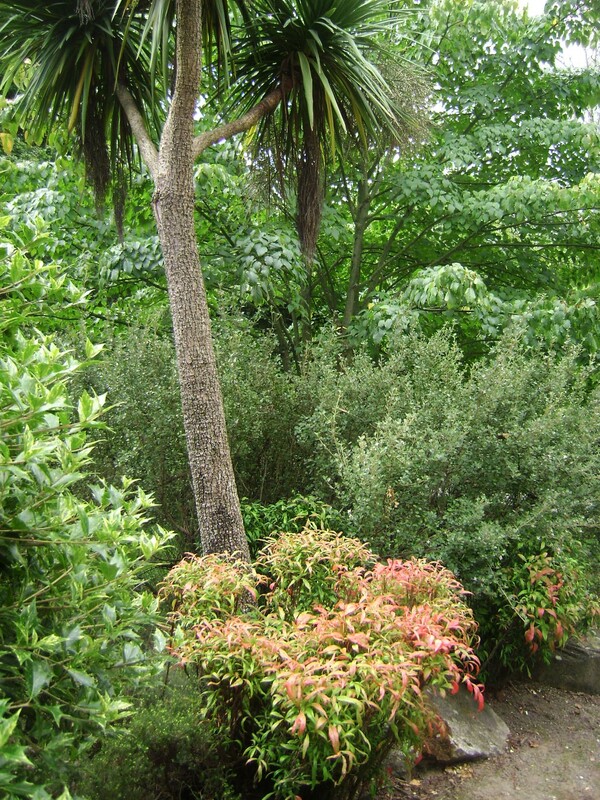 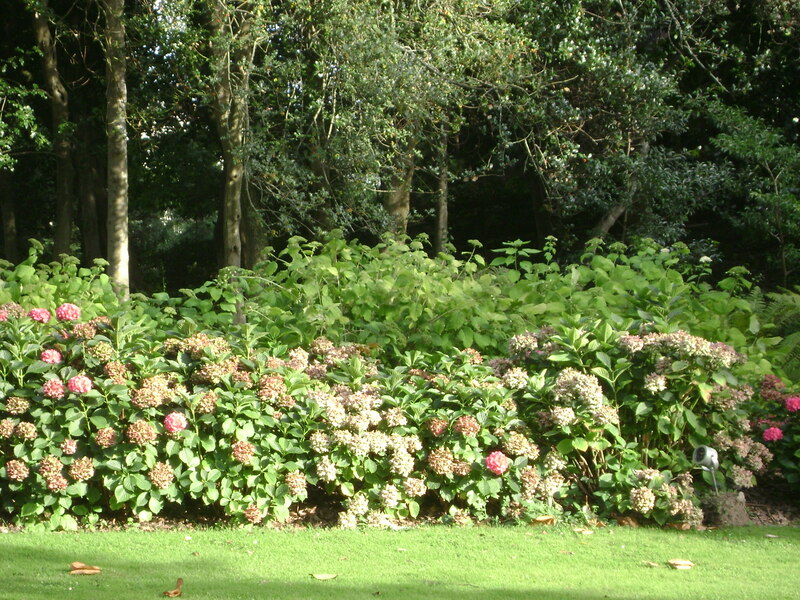 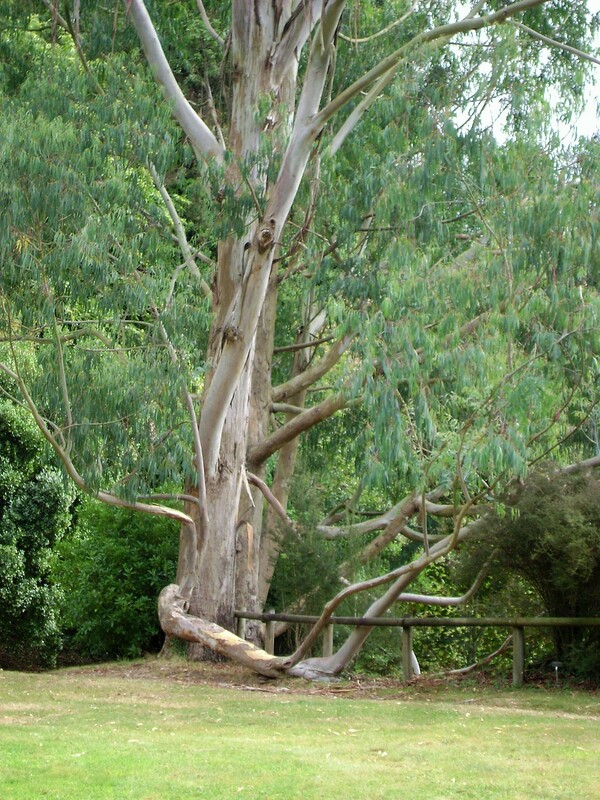 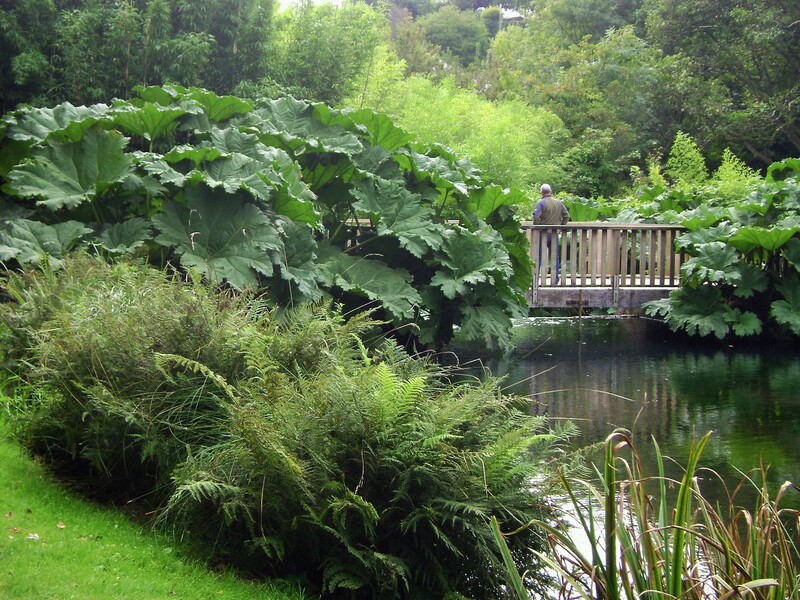 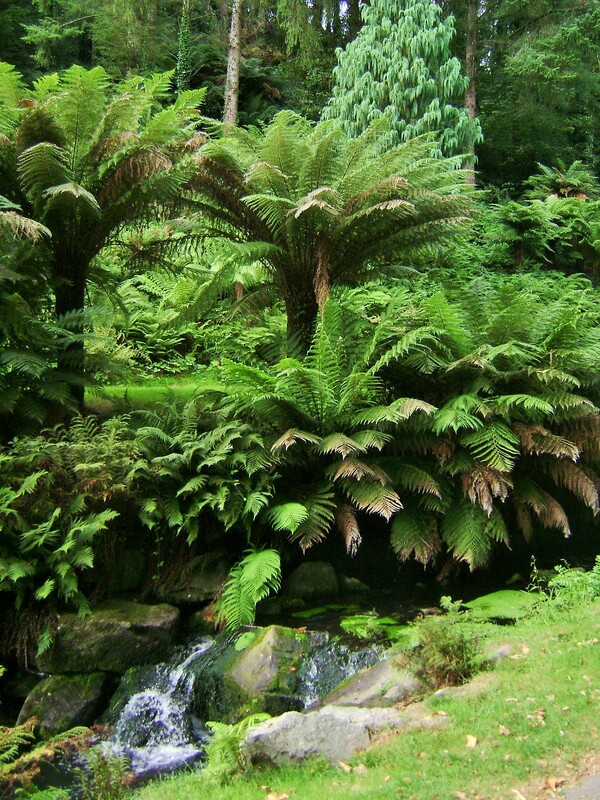 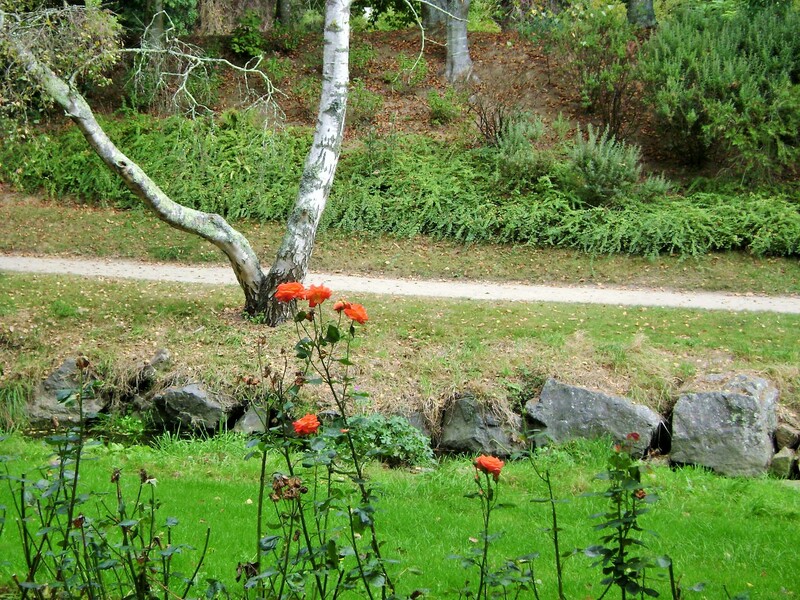 Note the beautiful planting of Tasmanian tree ferns along the banks, as well as some particularly large gunneras. 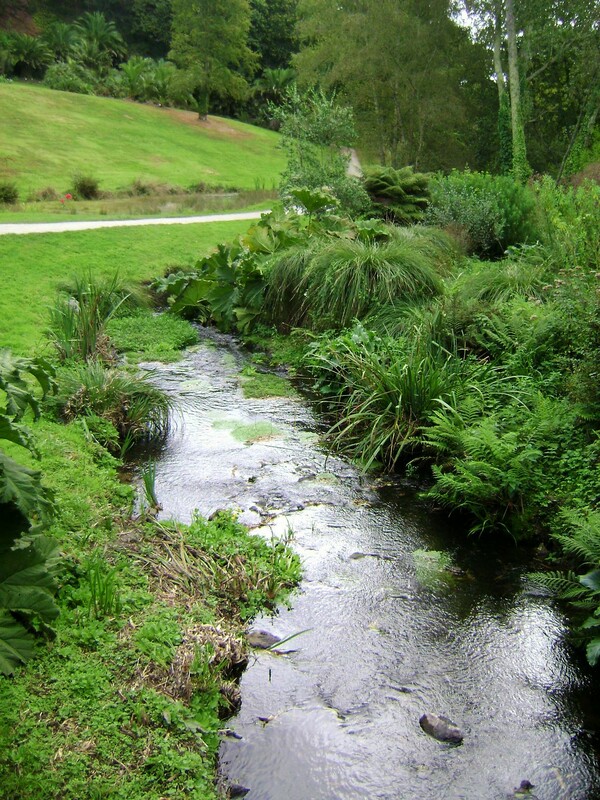 In northern Brittany, the Botanical Gardens in Brest enjoy a privileged location in a small valley with a stream throughout, and creating a microclimate allowing endangered species to grow with additional protection. 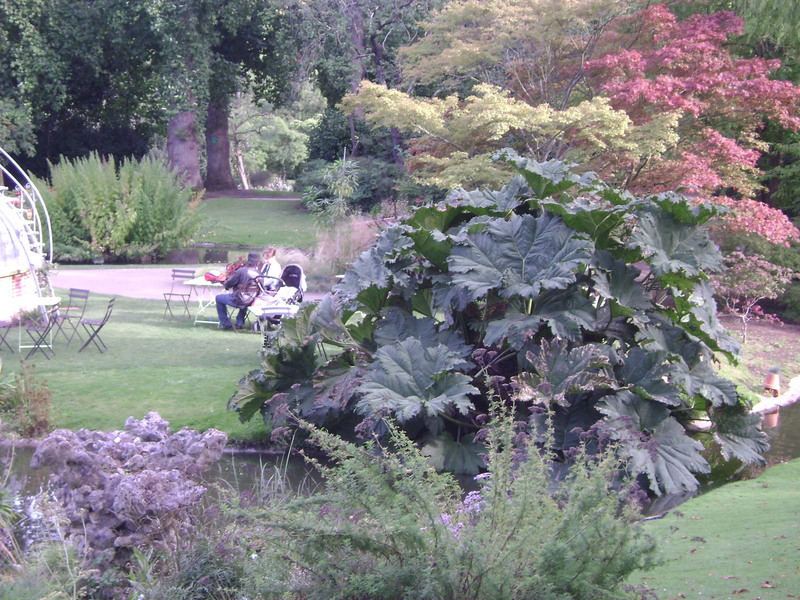 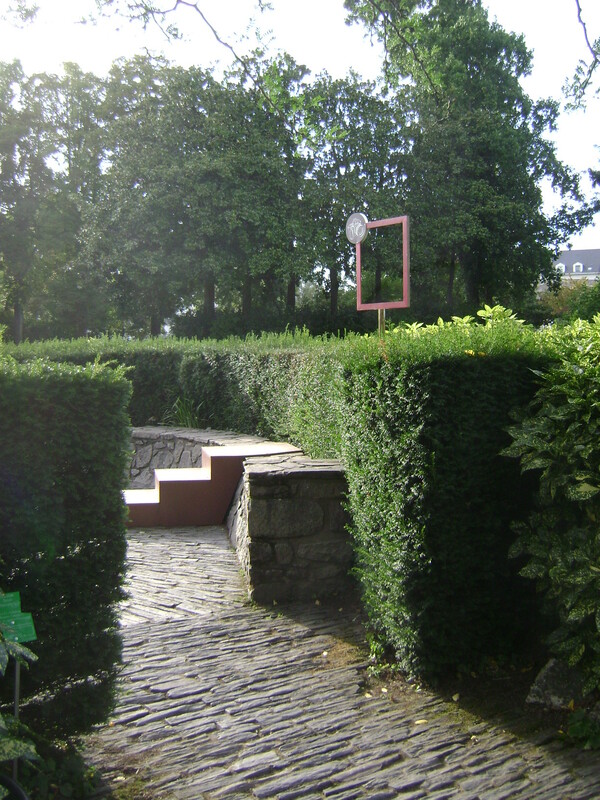 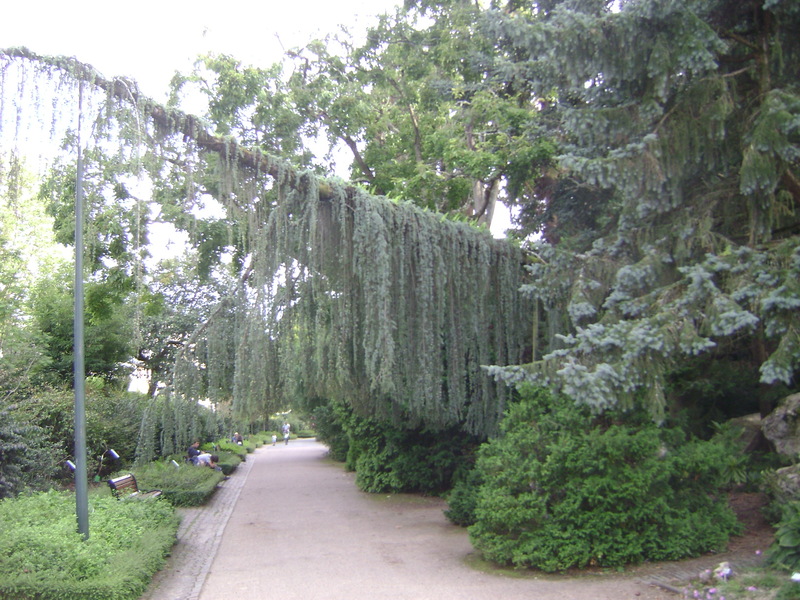 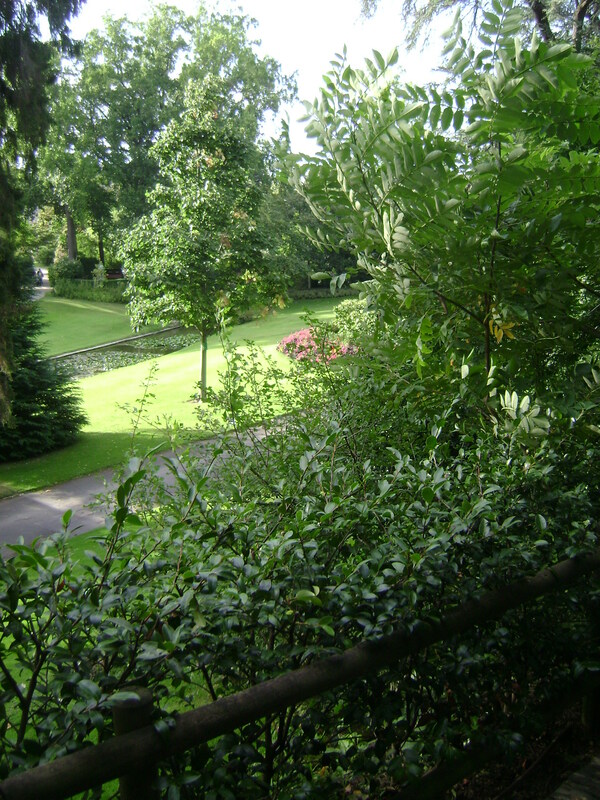 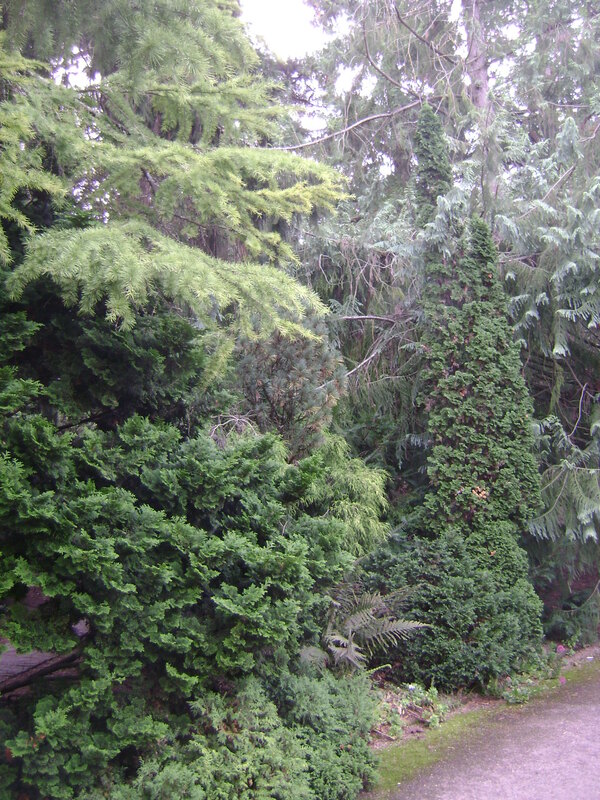 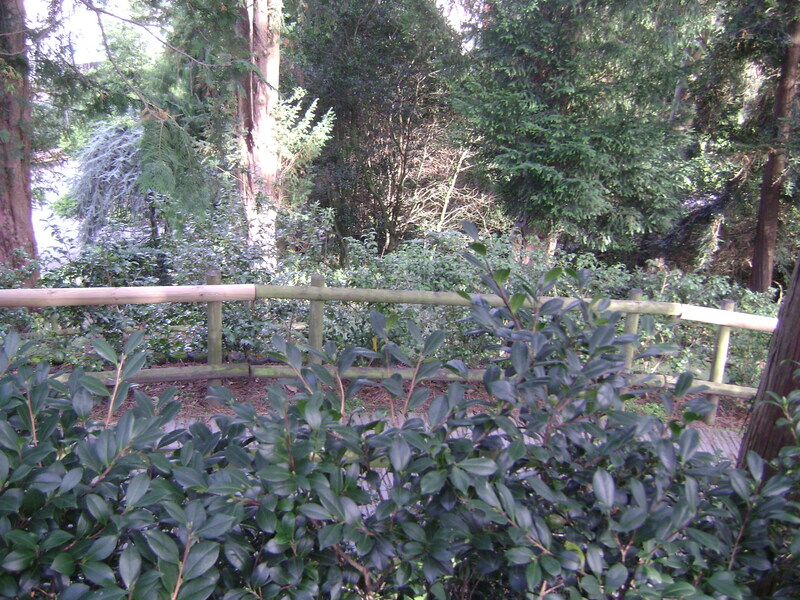 Long and narrow, these gardens are divided into the park area at one end, end thebotanical gardens proper at the other. 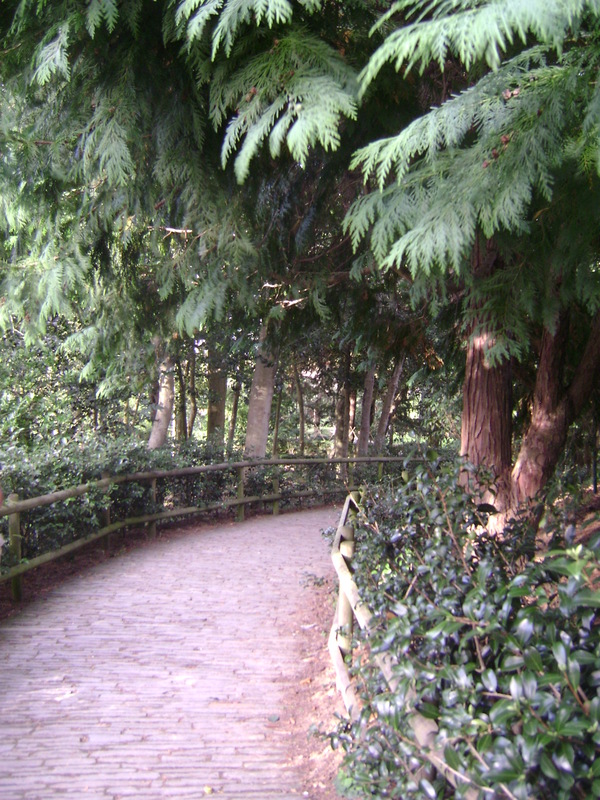 In this post, I am featuring the park. 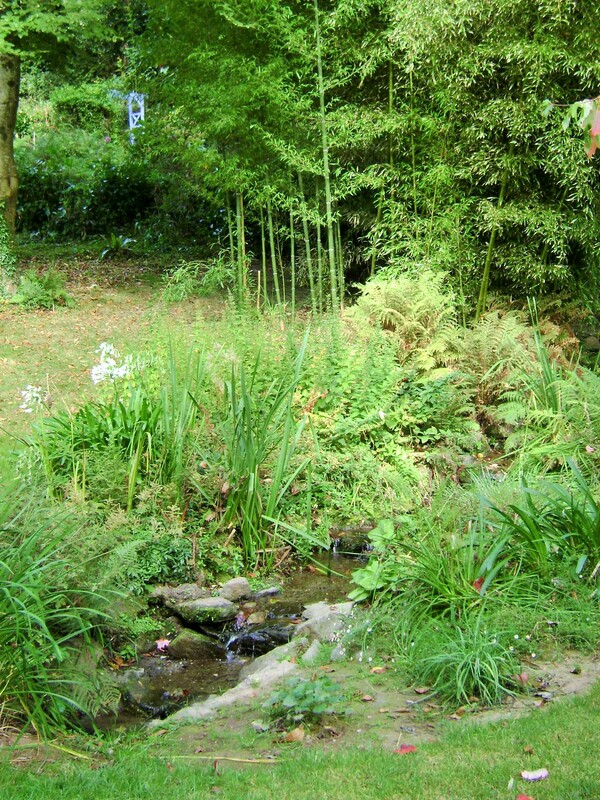 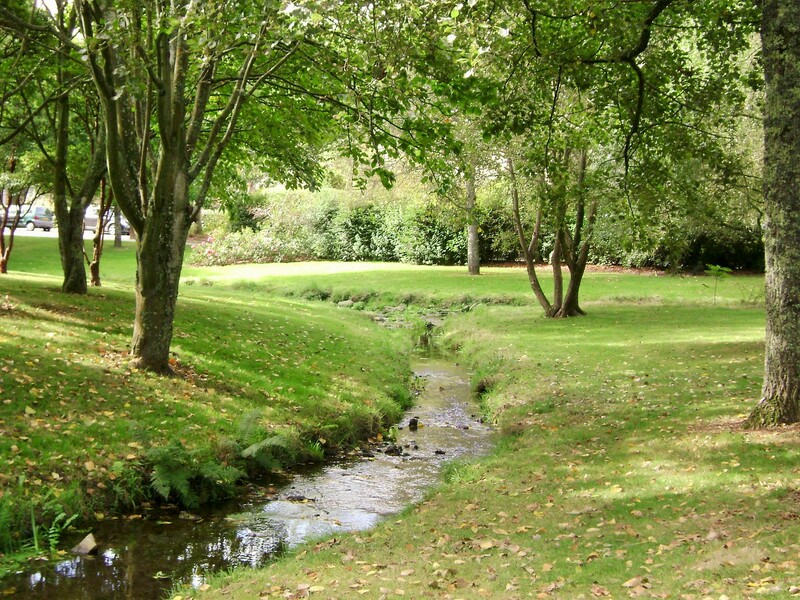 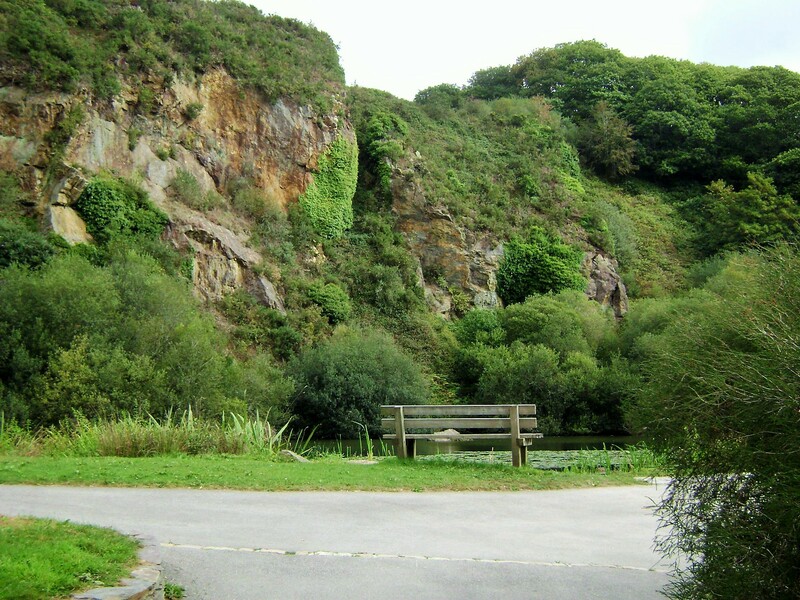 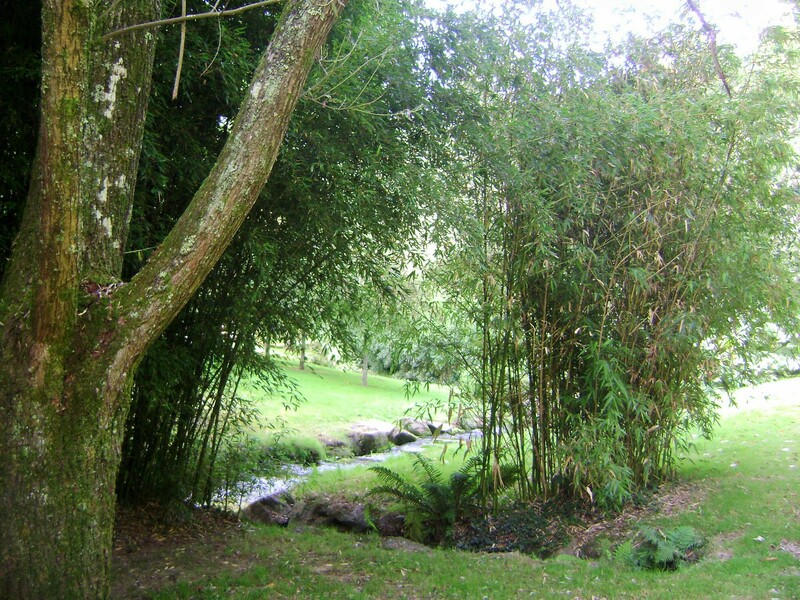 Common to both areas is the stream and therefore an abundance of water features. 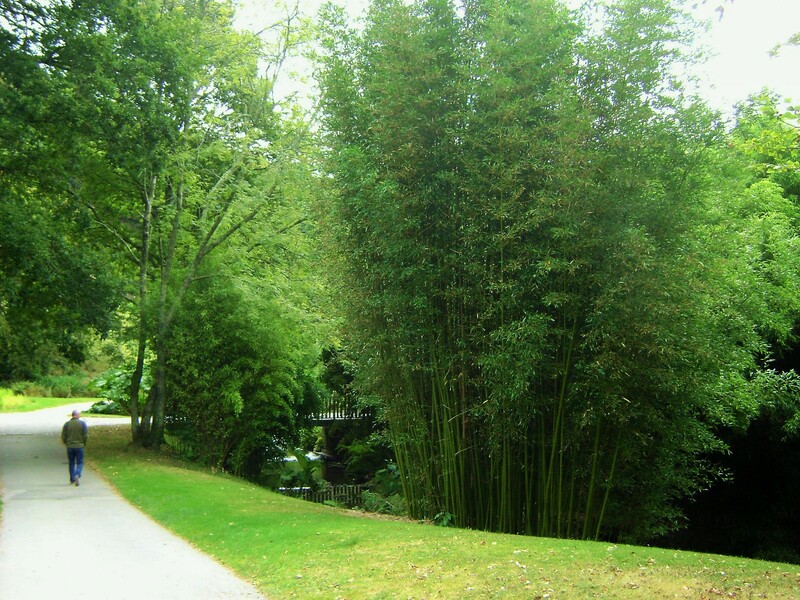 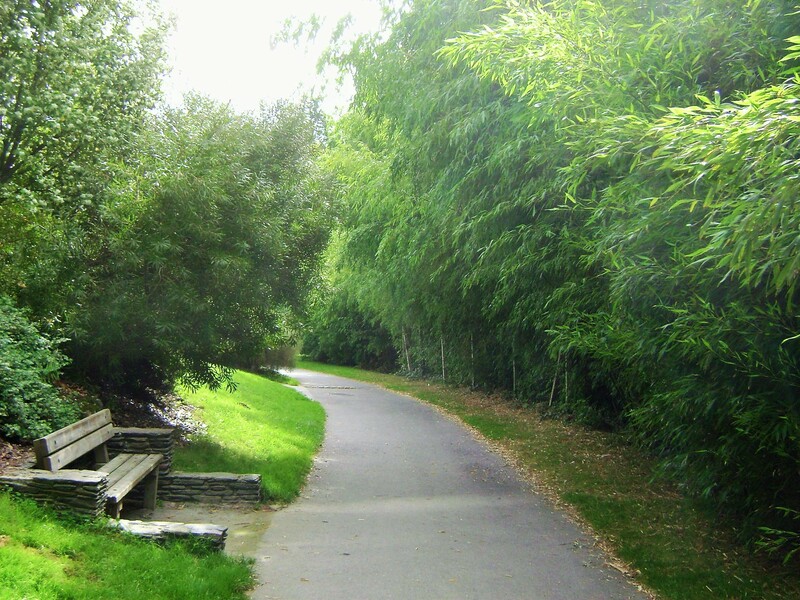 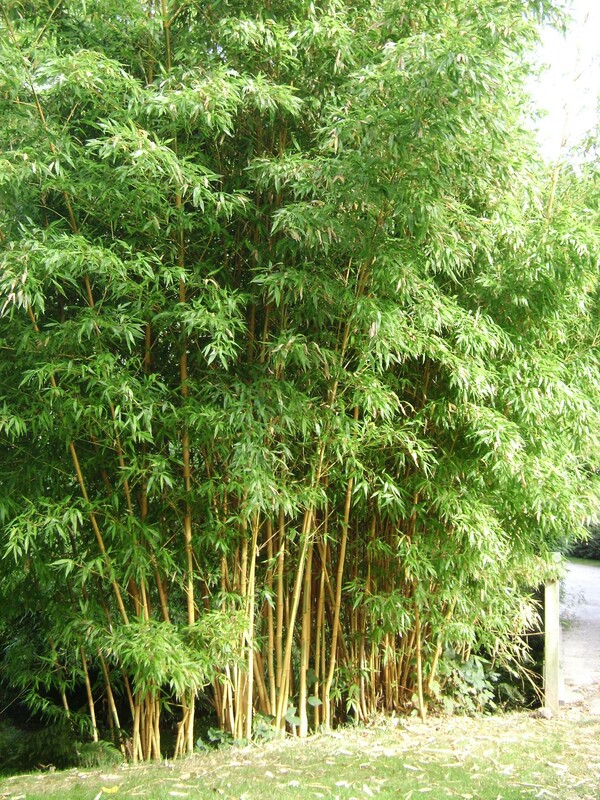 The park has the feel of a woodland garden, with more greenery, bamboos, mature trees, gunnera and the likes, than landscaped borders and flowers. 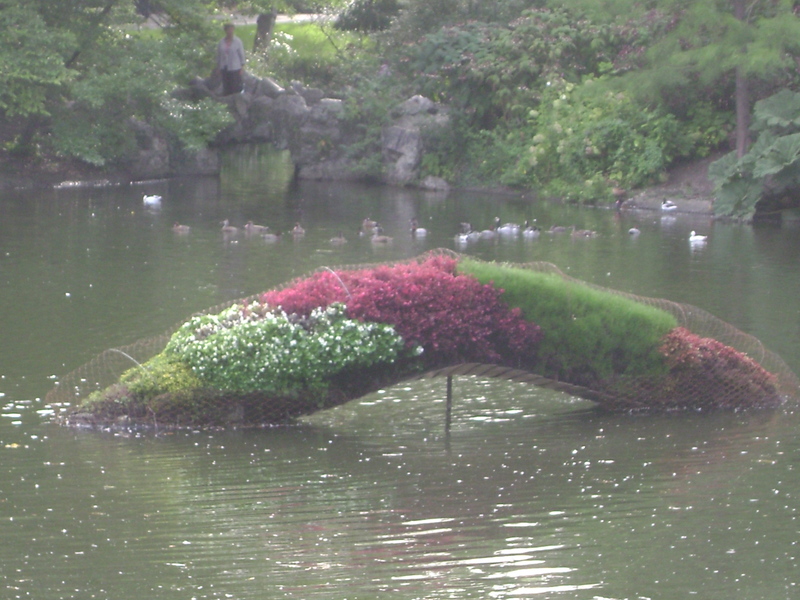 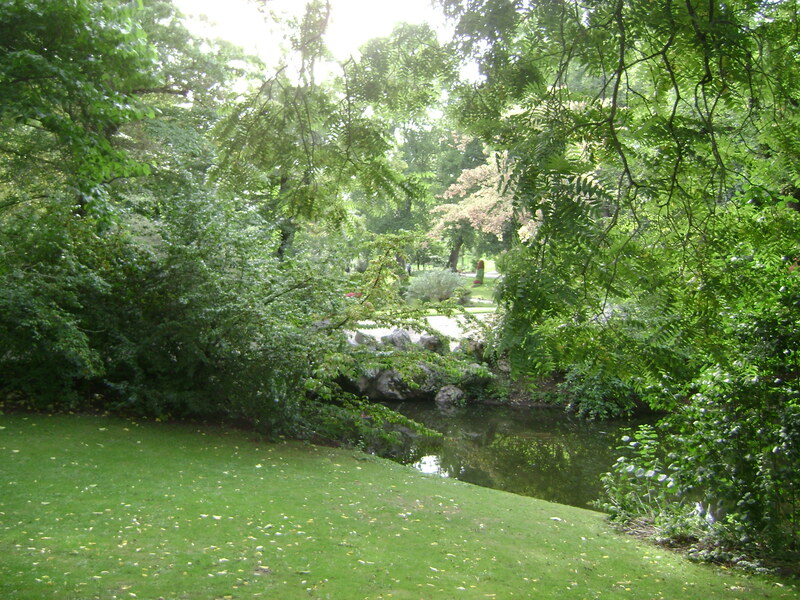 The choice of plants as well as the use of rocky elements and bridges give it very much the feel of a Japanese garden, in certain areas of the park in particular. 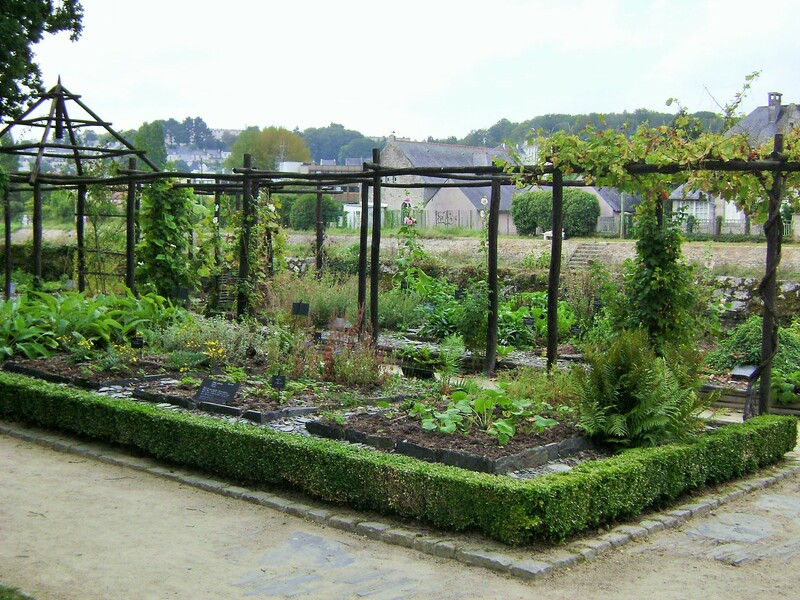 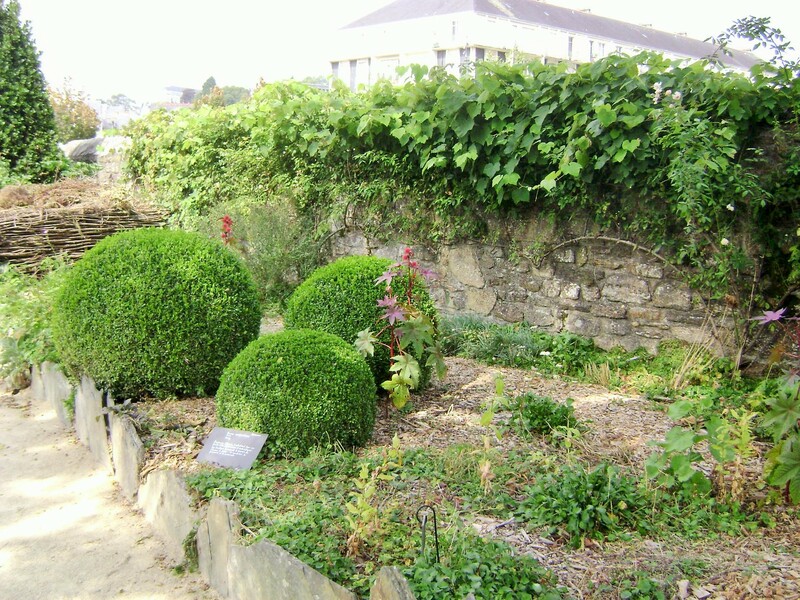 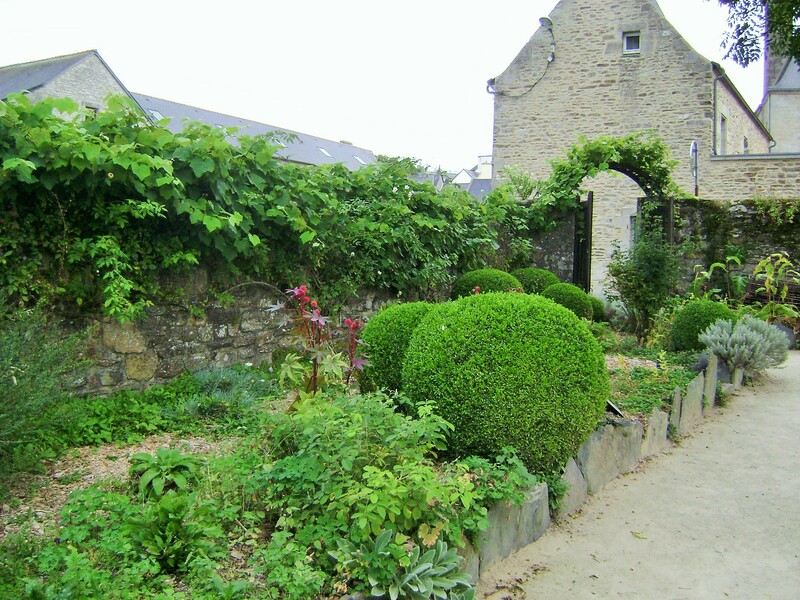 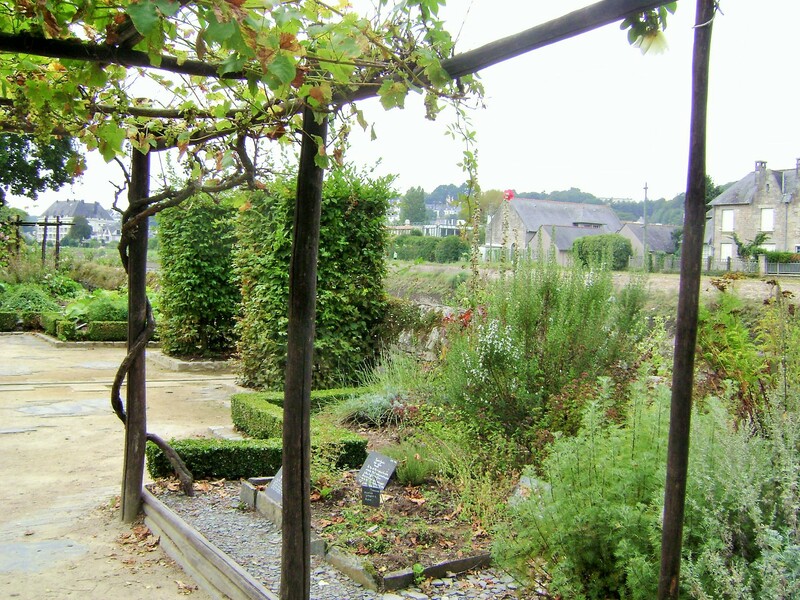 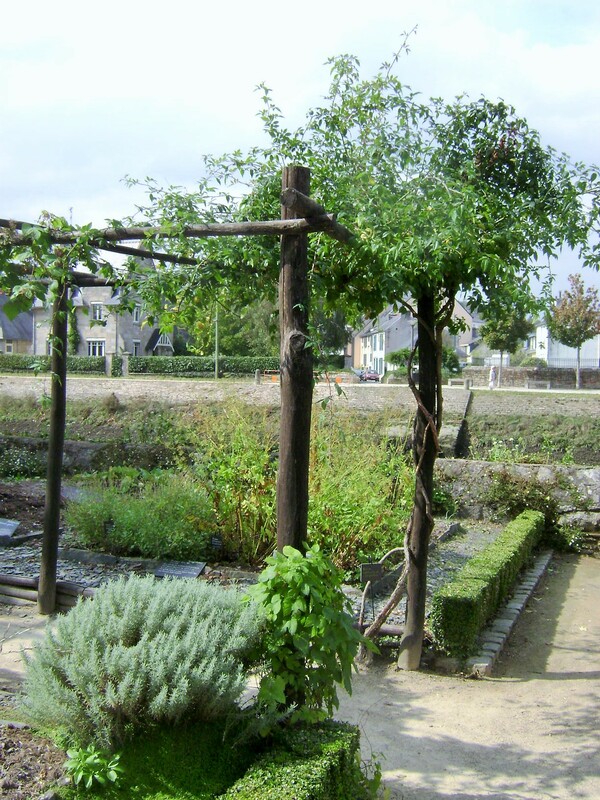 Work on this garden was started in 1997 to create a medieval garden in the style of a convent garden in the days of Anne of Brittany (1477-1514). 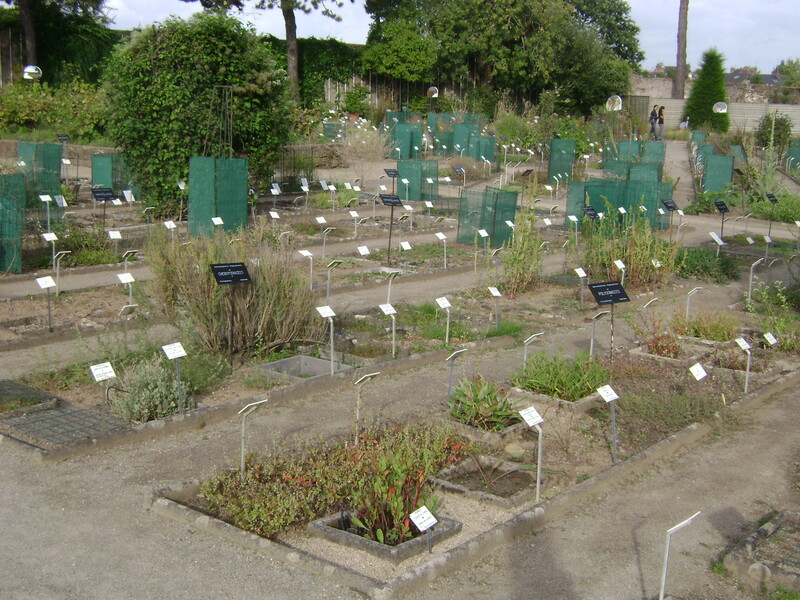 The population at the time resorted to plants for most of their needs: food, medicine and clothing. 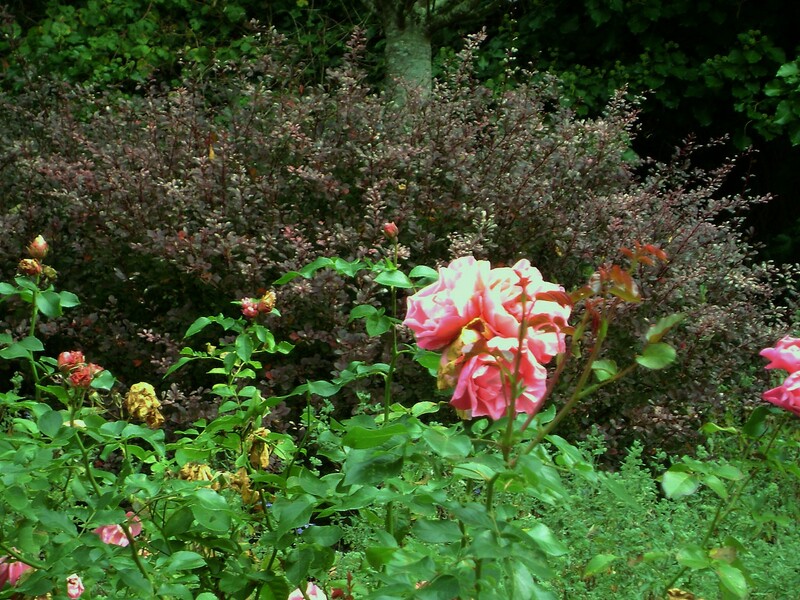 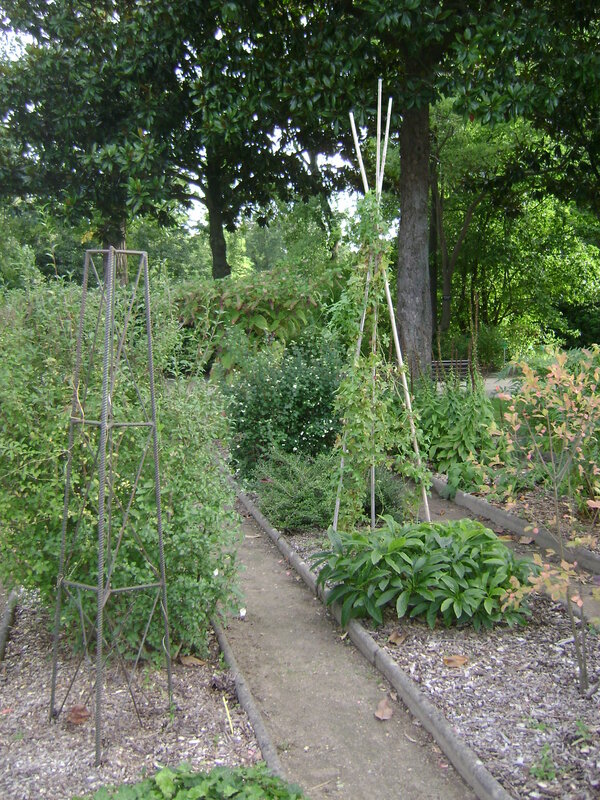 The garden has three essential components. 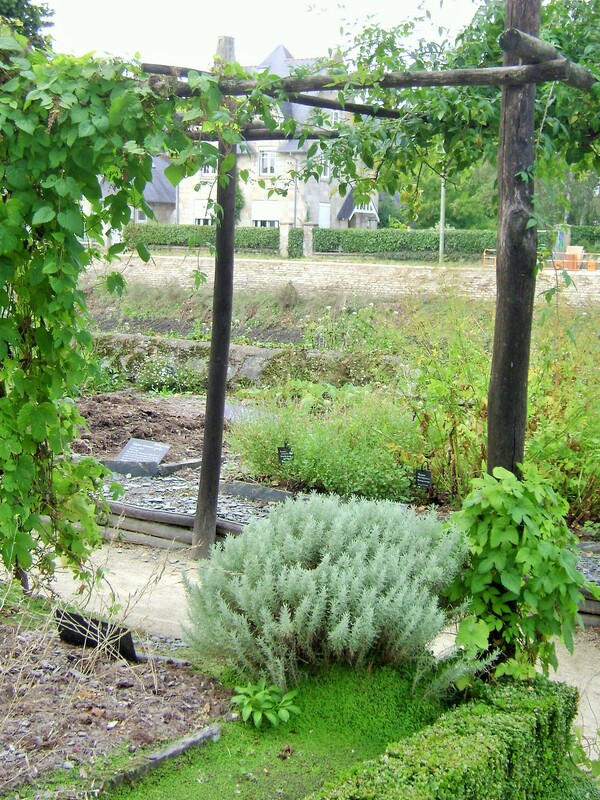 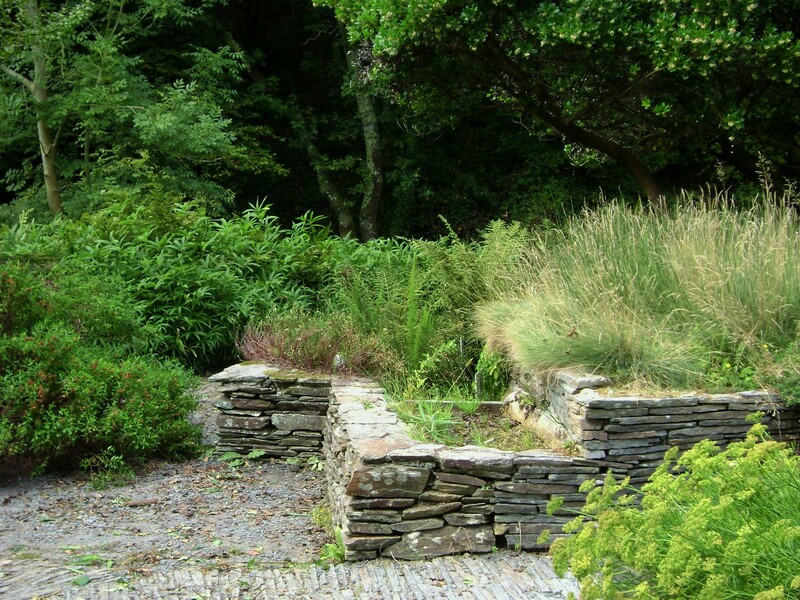 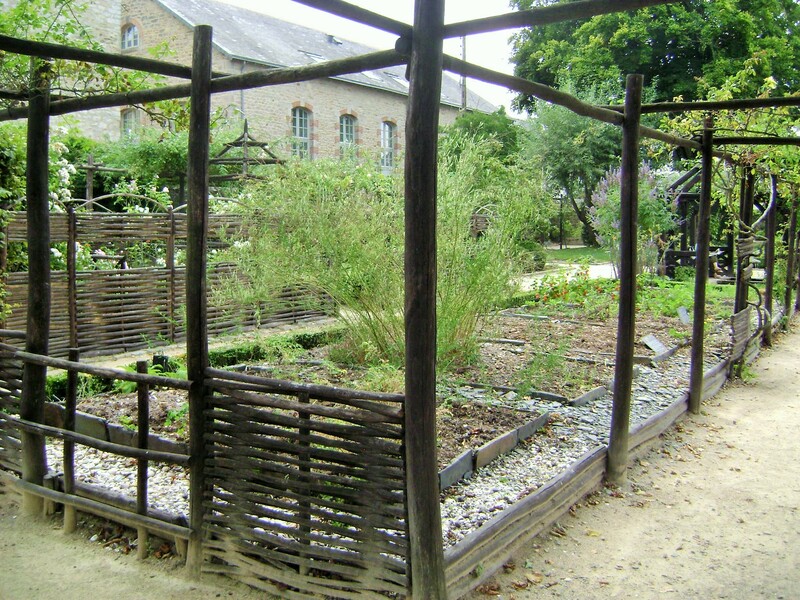 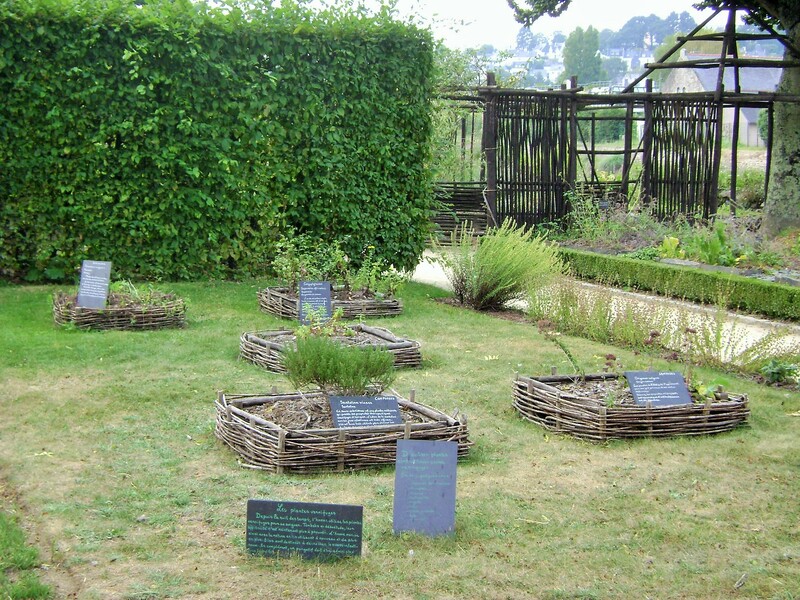 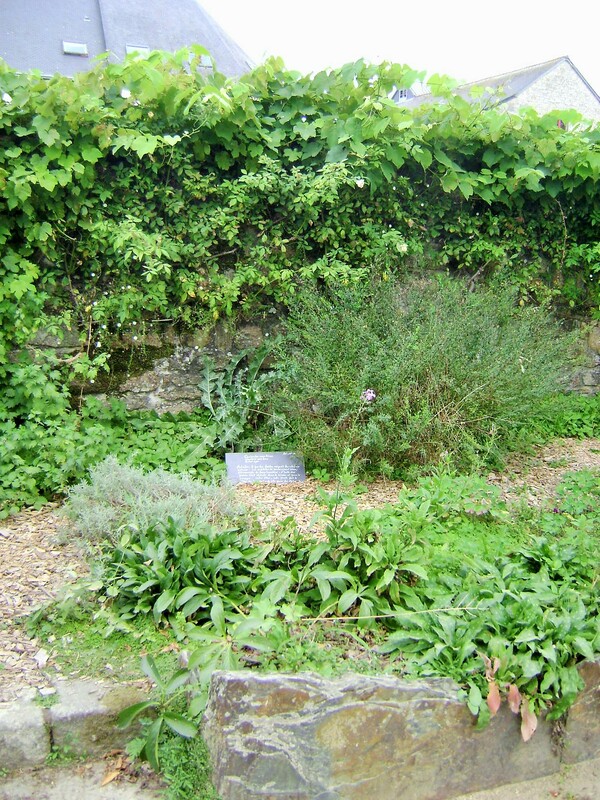 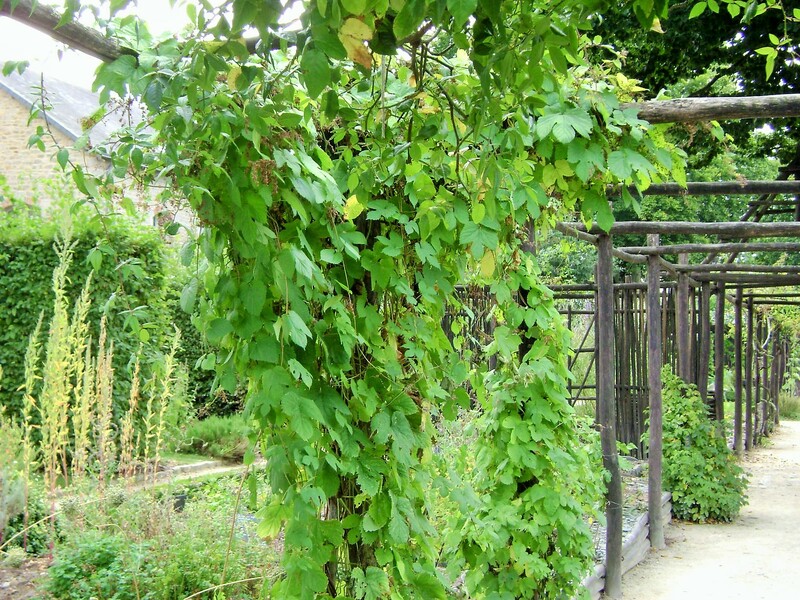 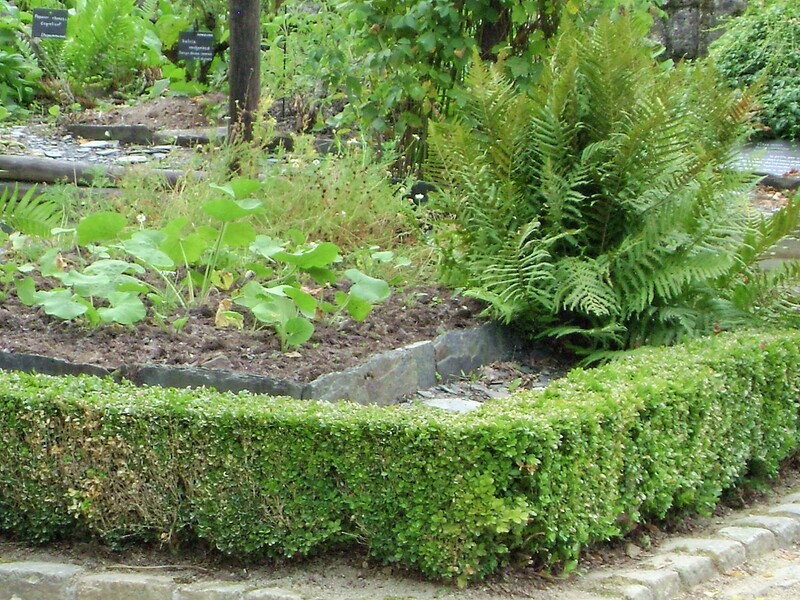 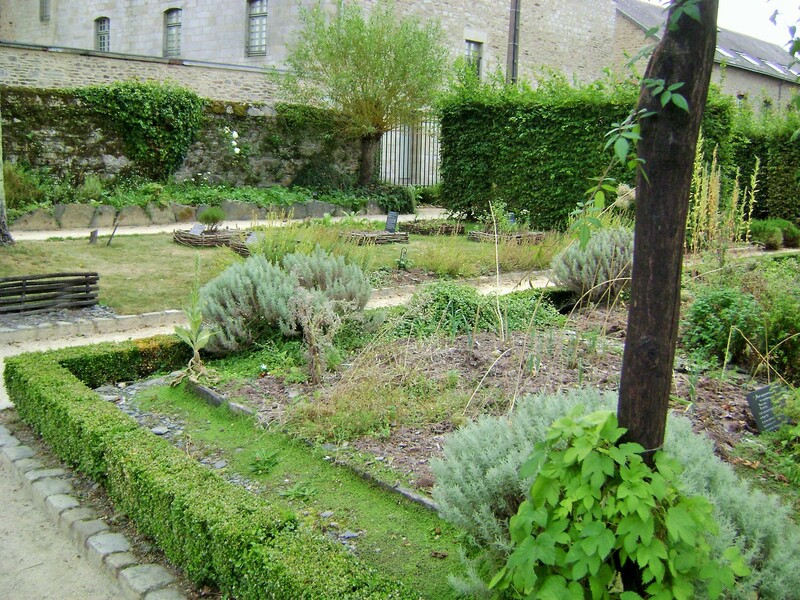 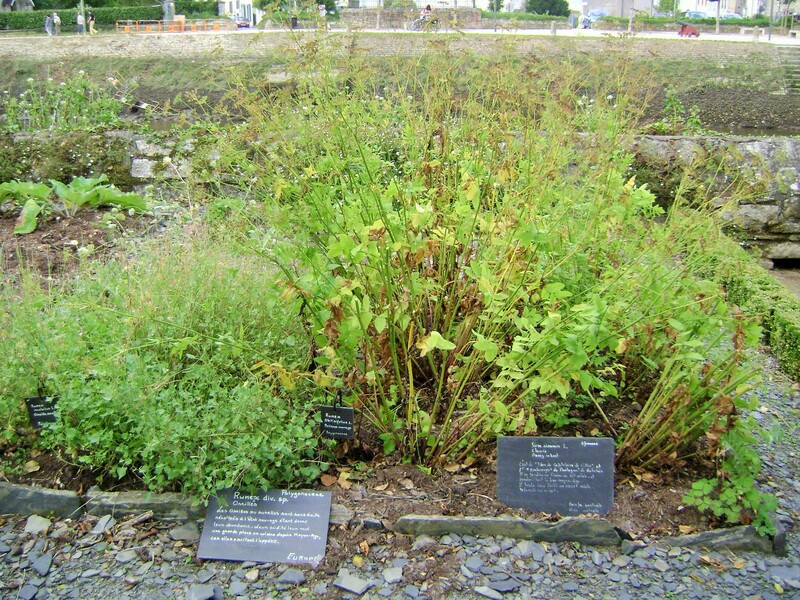 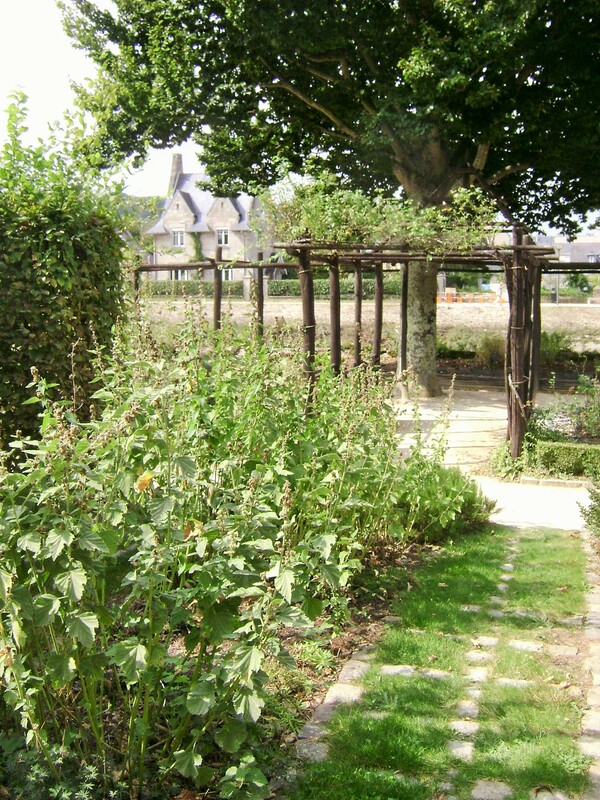 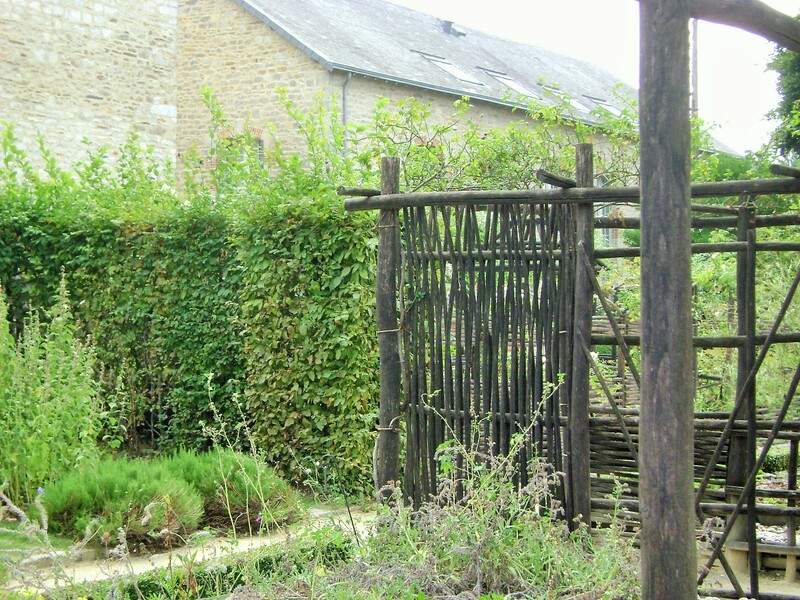 The medicinal and herb garden, used by monks to make their own remedies from plants not readily available in the surrounding areas and therefore grown in the garden. 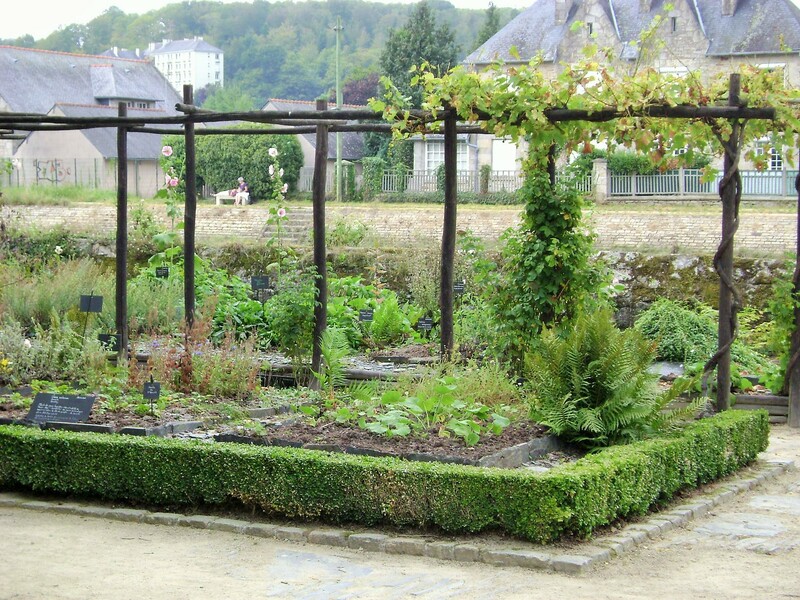 The edible garden: nutritious roots, fruit, fresh or dried, beans, barley, and other garden crops made up the menu of the time. 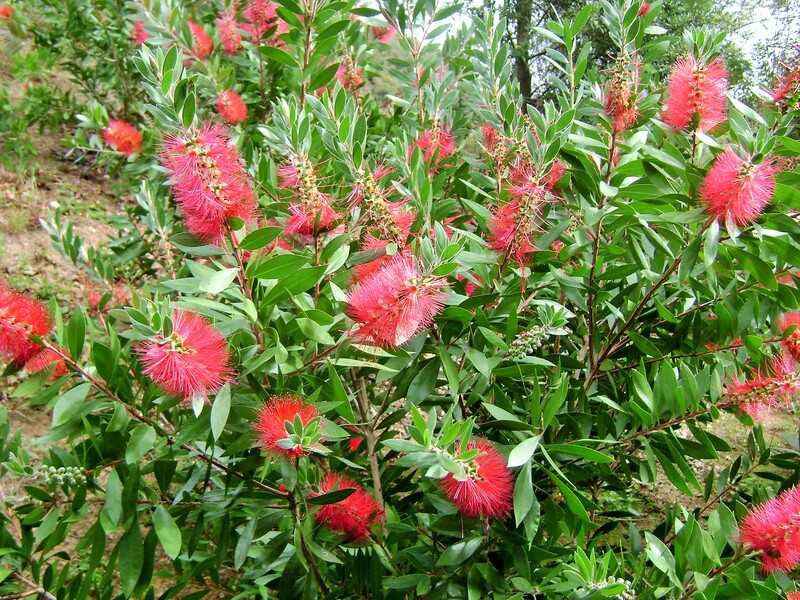 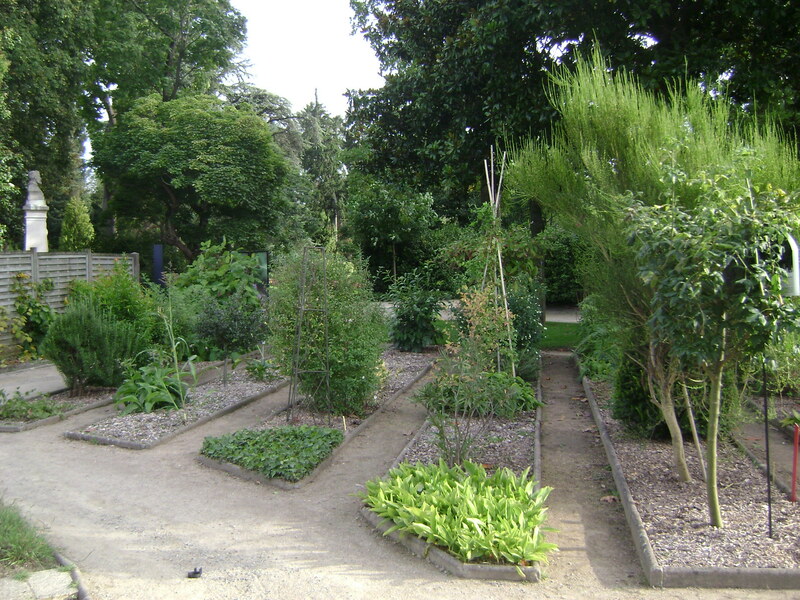 The tinctorial garden grew plants used for clothing such as hemp, linen or catharmus which was used for red coloring. 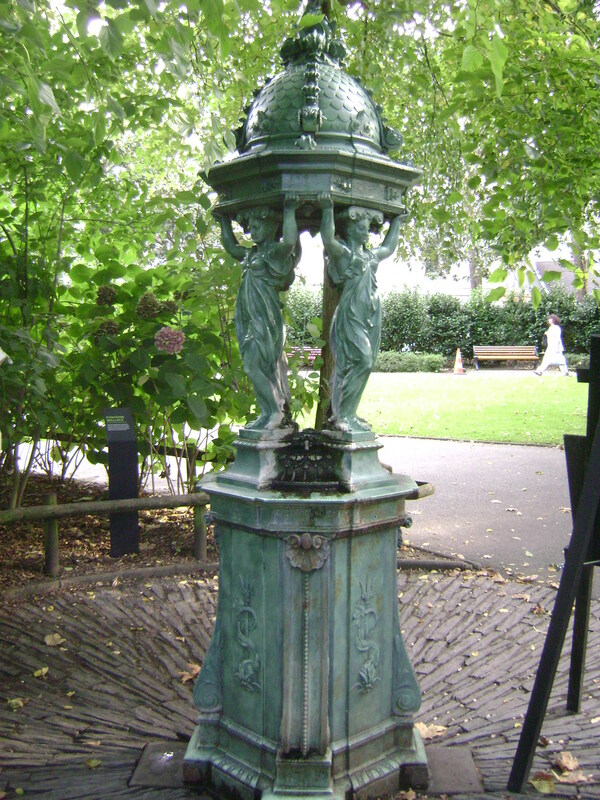 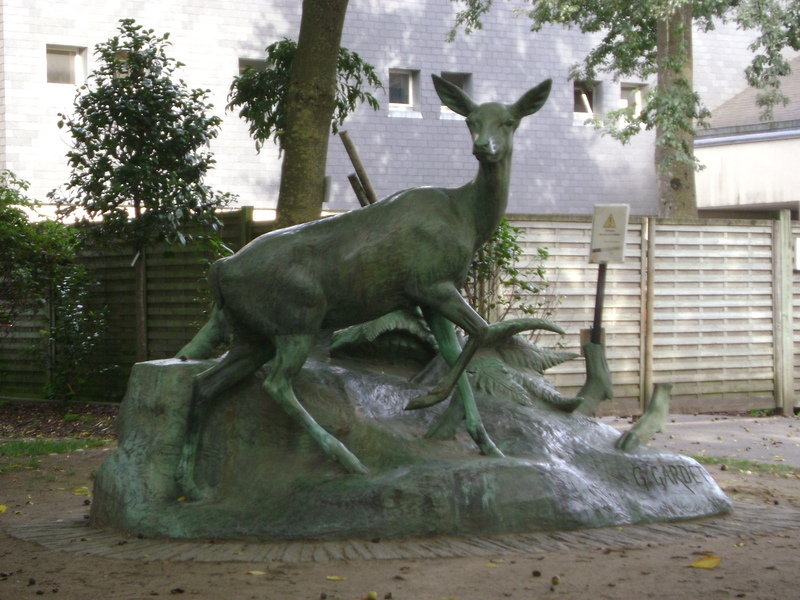 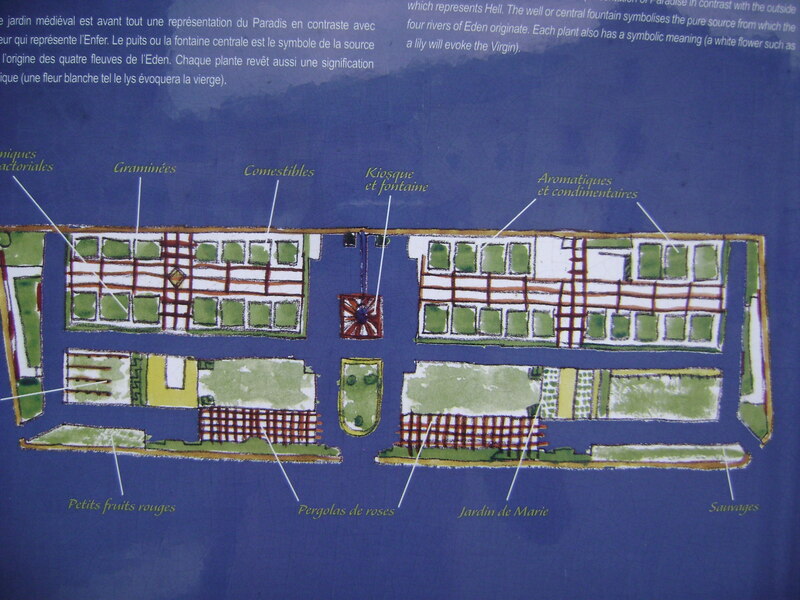 Note also that the medival garden is a representation of Paradise, with the fountain in the center representing the pure source from which the four rivers of Eden originate. 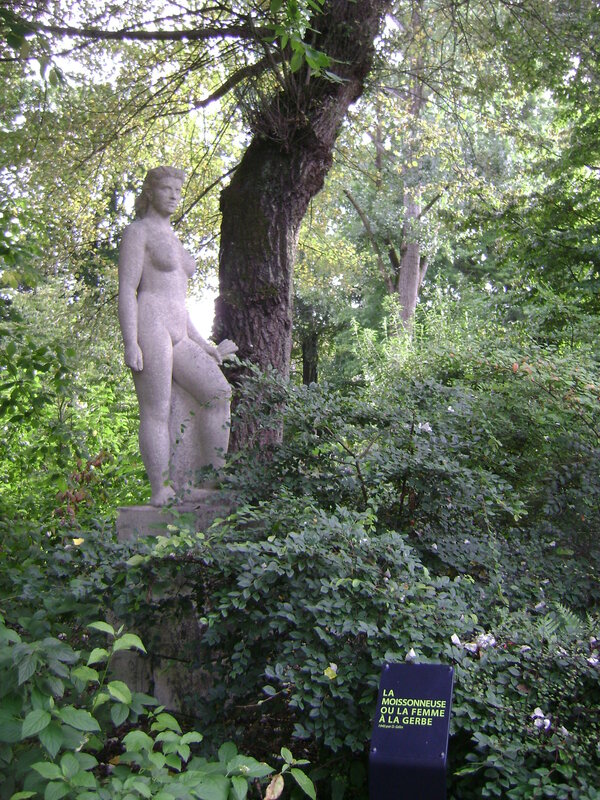 Plants such as white lilies and other white flowers represent the virgin. 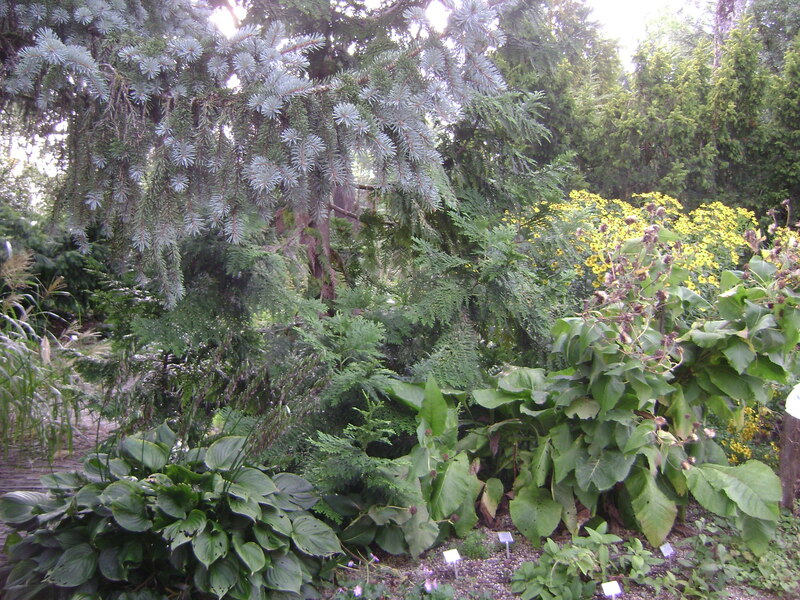 In this first post, I am featuring the front portion of the garden, with the medicinal and herb section. 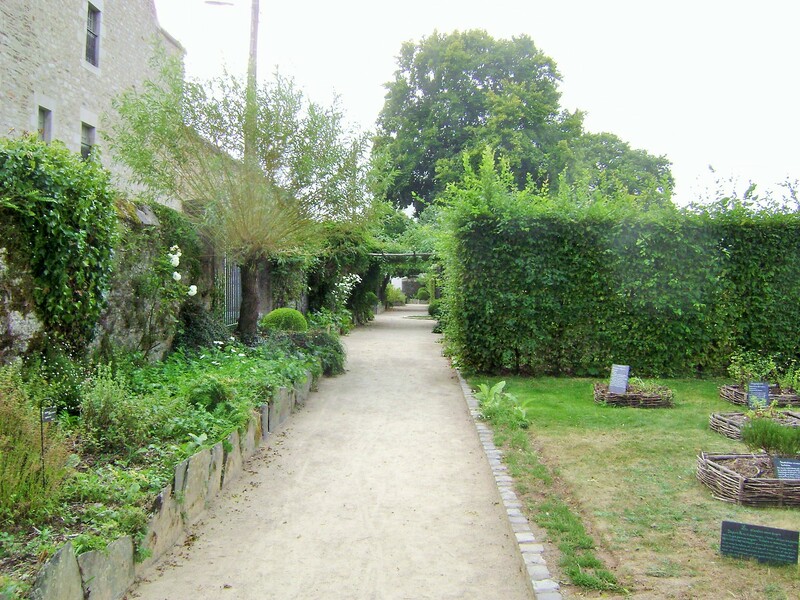 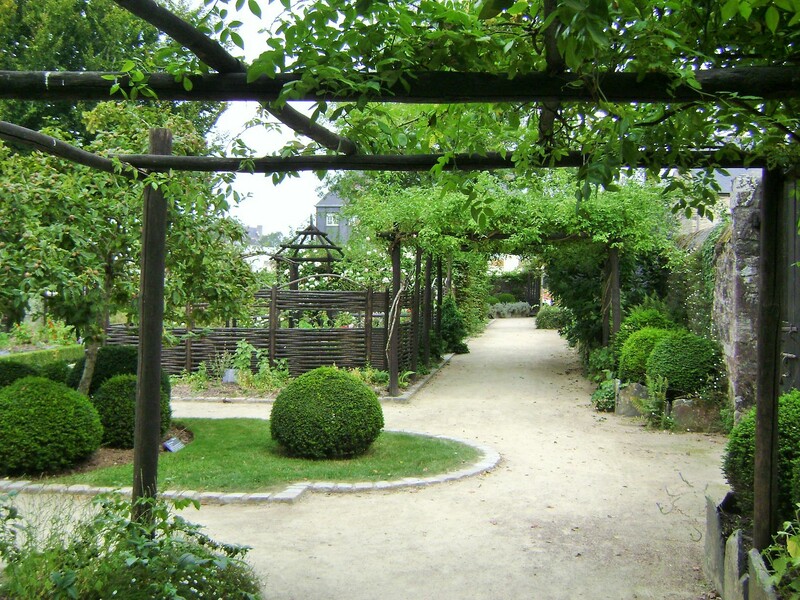 This is one of the loveliest gardens in this style I have had the chance to visit and it was also awarded “Jardin Remarquable” (remarkable garden”. 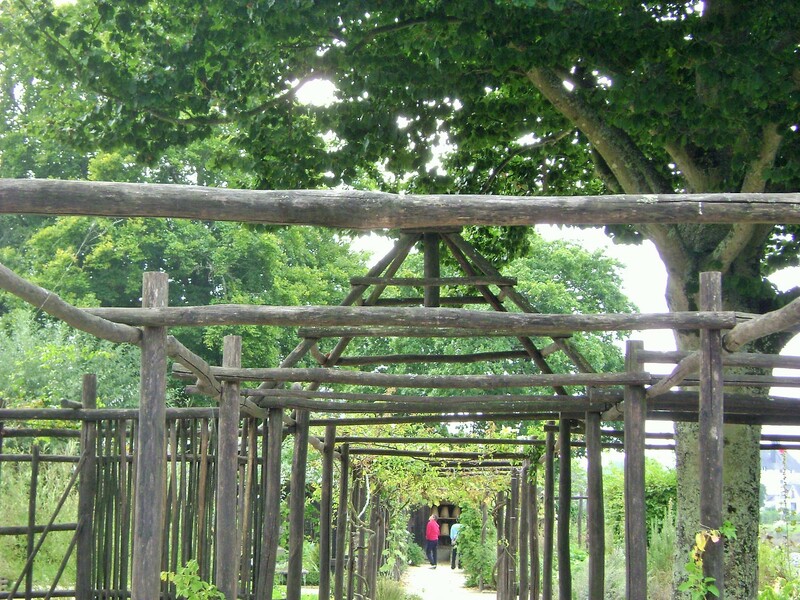 It was designed not only for function but also form, with a pavilion, arbors, pergolas, benches in cozy nooks, decorative borders for raised beds, woven Plessis, and a fountain, making it a feast for the eyes as well as the palate. 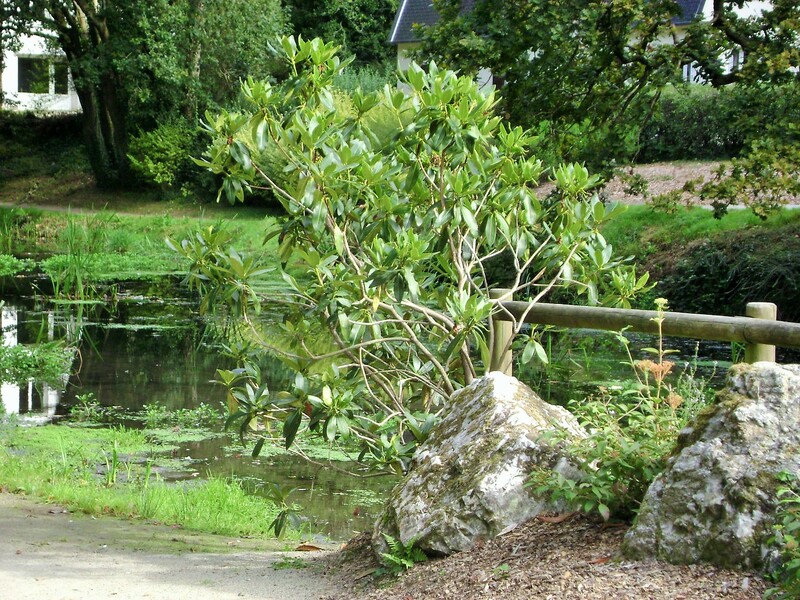 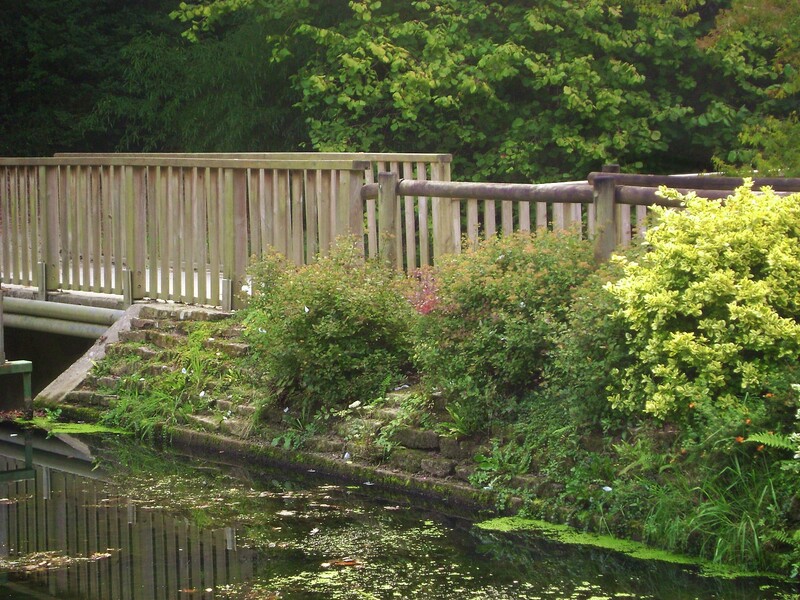 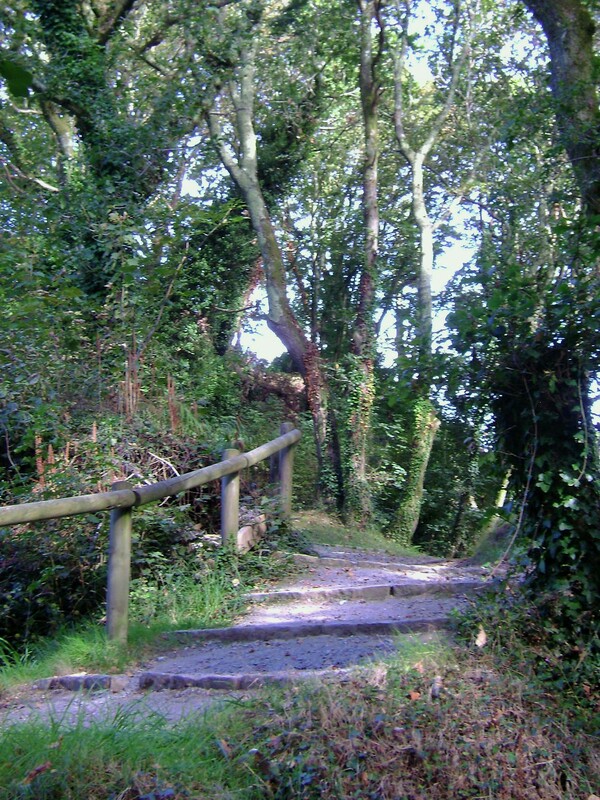 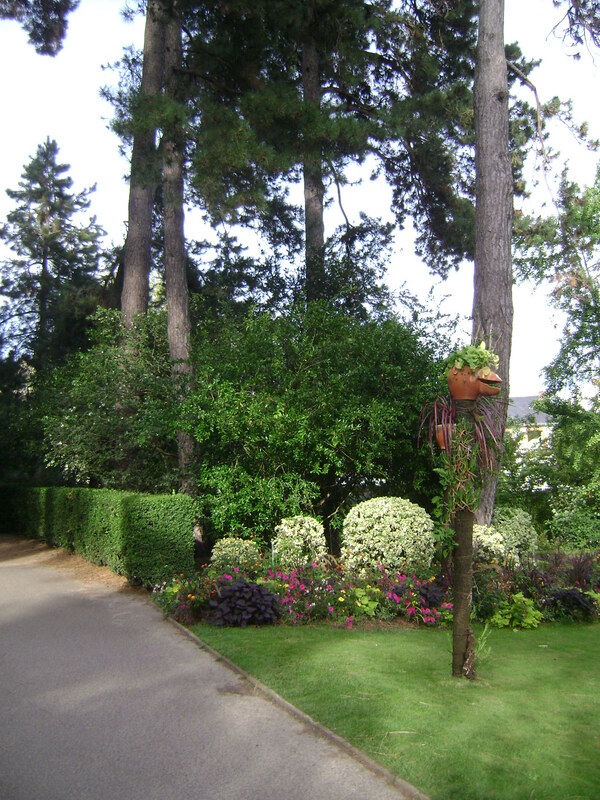 It also overlooks the river Odet, making it a truly enchanting setting. 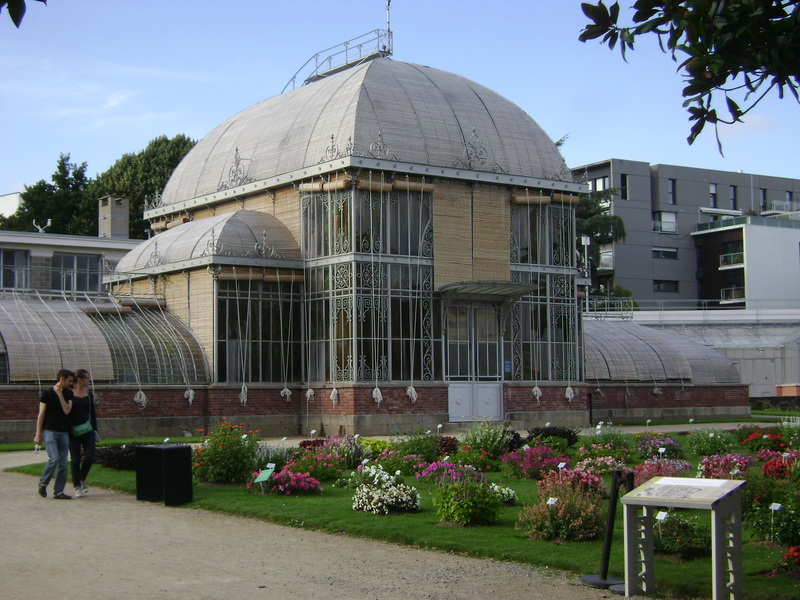 My first post on the Jardin des Plantes in Nantes was about the hothouses and scientific garden, the second one was on the art and statuary, this one focuses on the theme gardens and plantings. 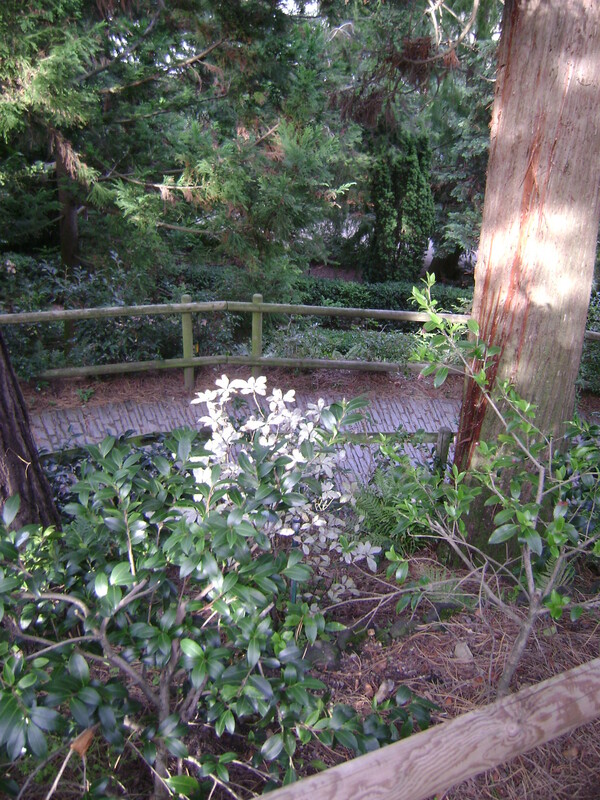 Meandering through the park, from the scientific garden, I first came across the shade garden, ferns and hostas surrounded by an amazing variety of evergreen shrubs and trees. 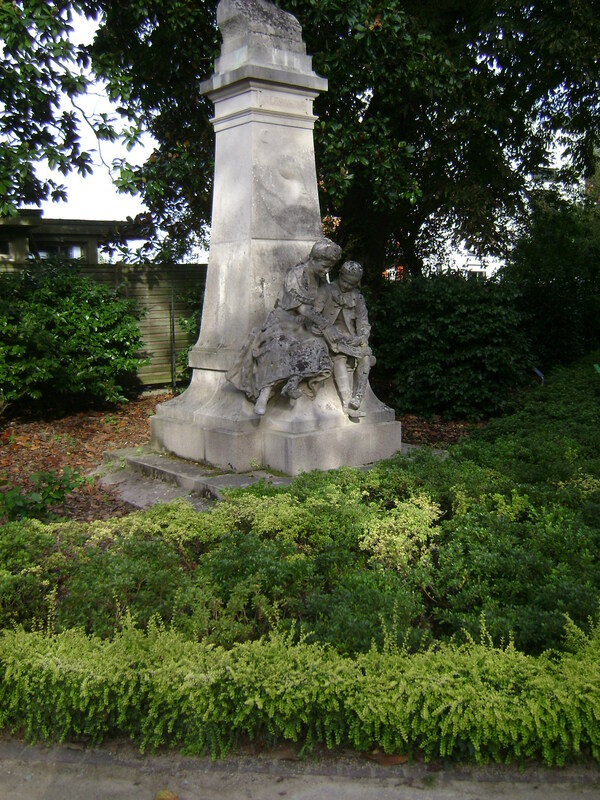 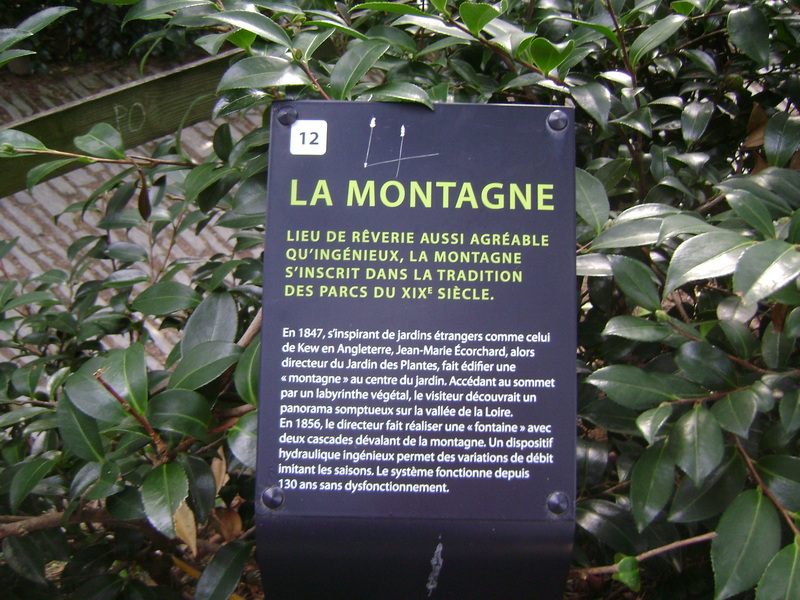 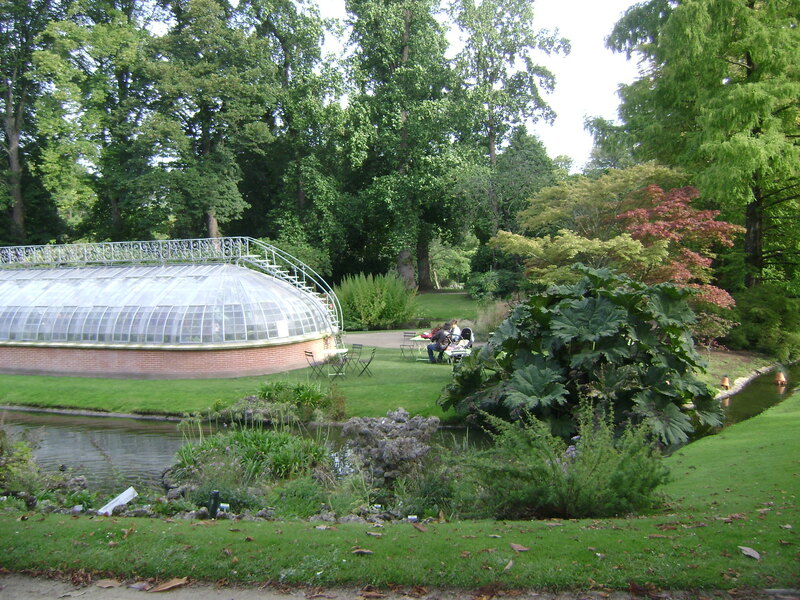 The theme garden “the Mountain” is inspired by 19th century gardens such as Kew garden in England, and was installed in 1847 by the then director of the Jardin des Plantes. 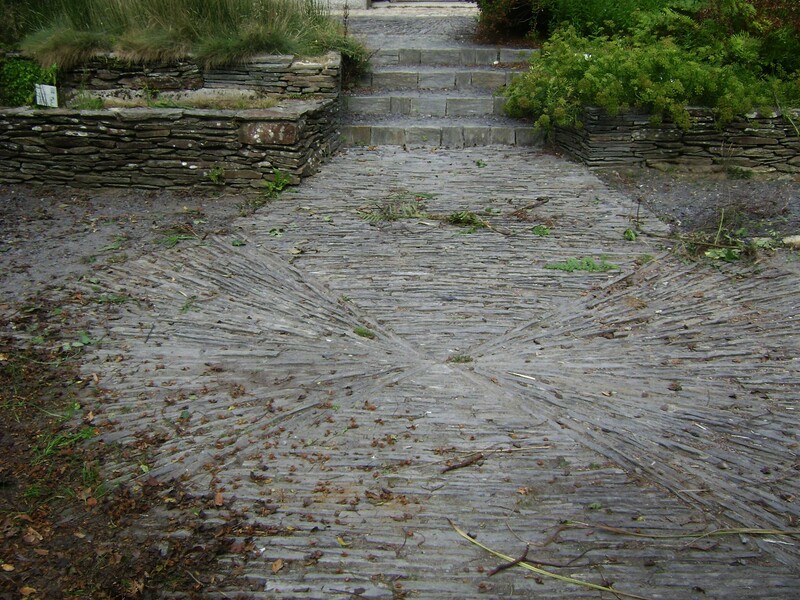 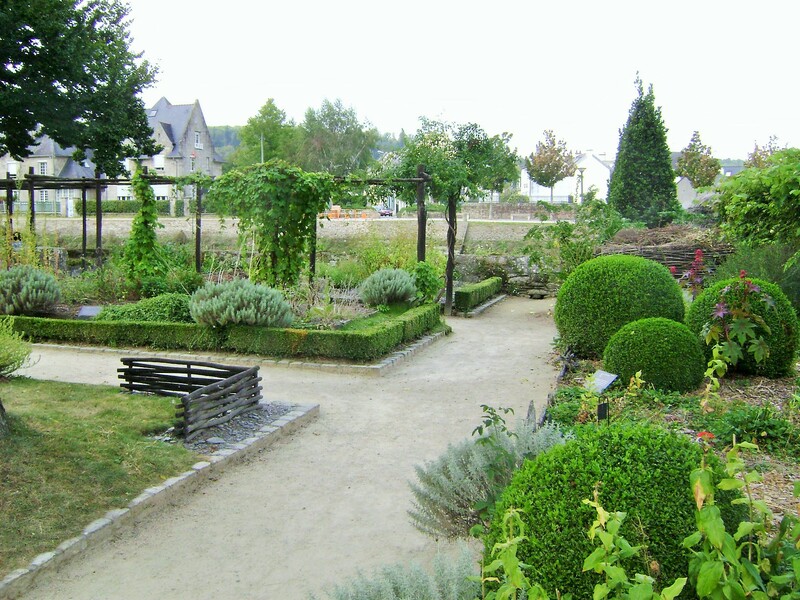 A labyrinth of plantings guides a circular ascension to the top and a lookout point to the Loire river. 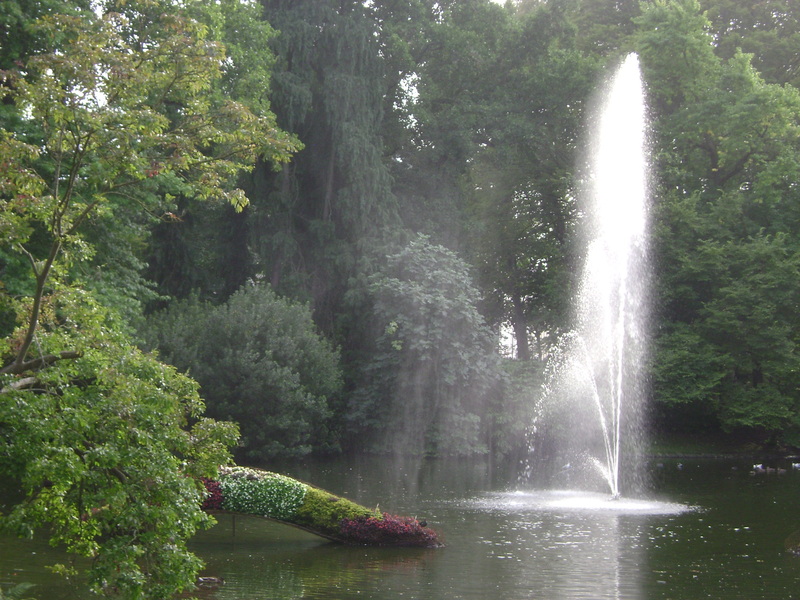 Water features dot the park. 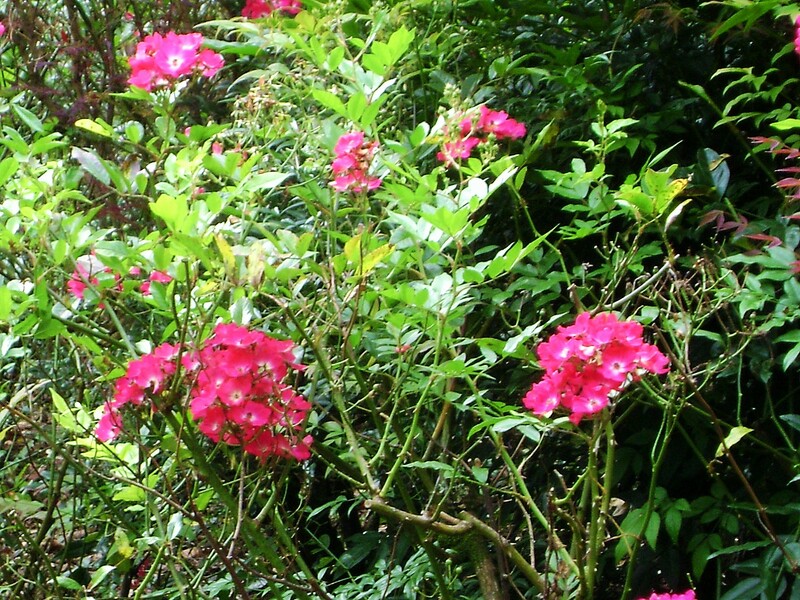 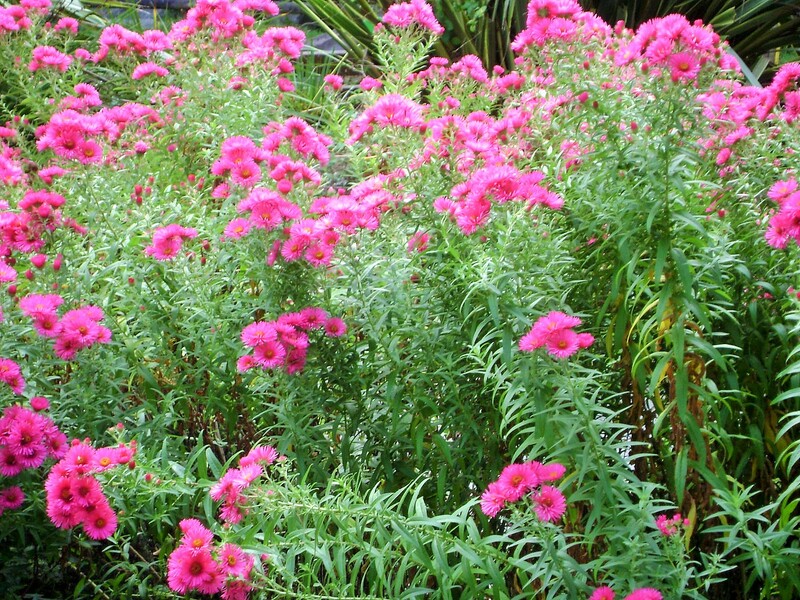 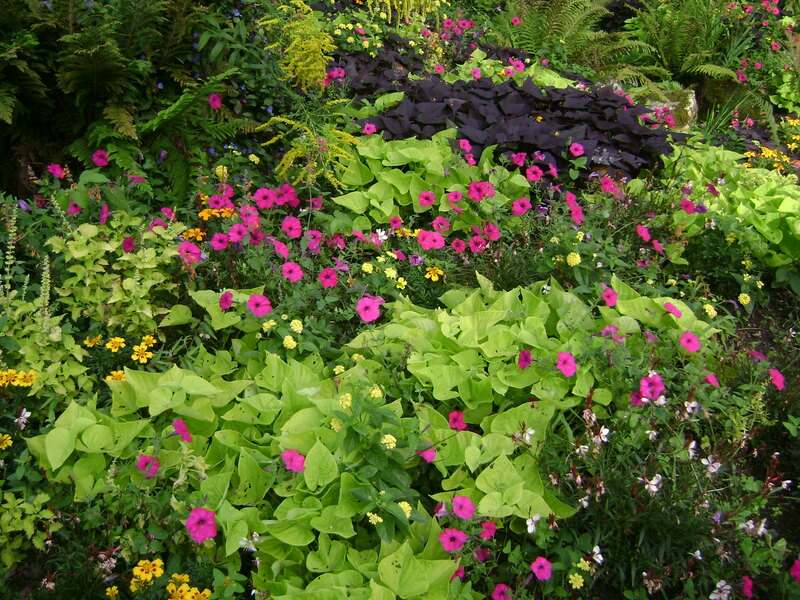 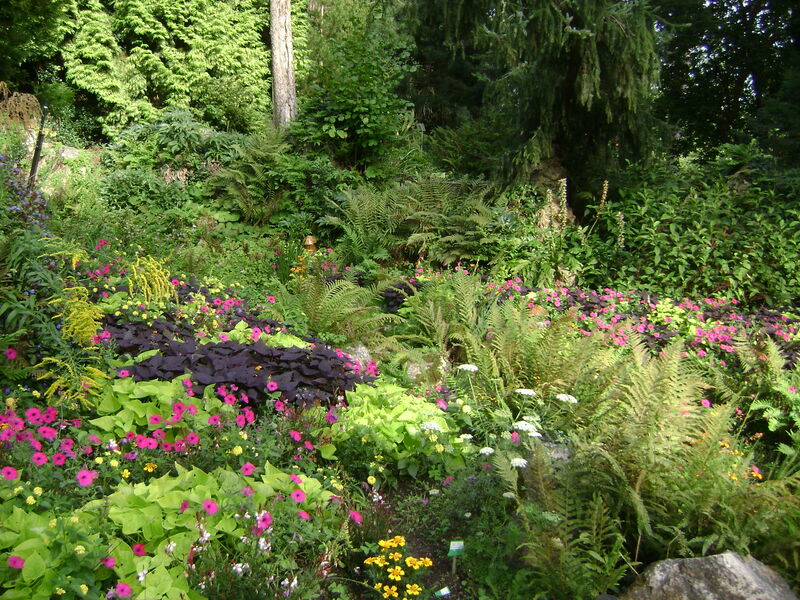 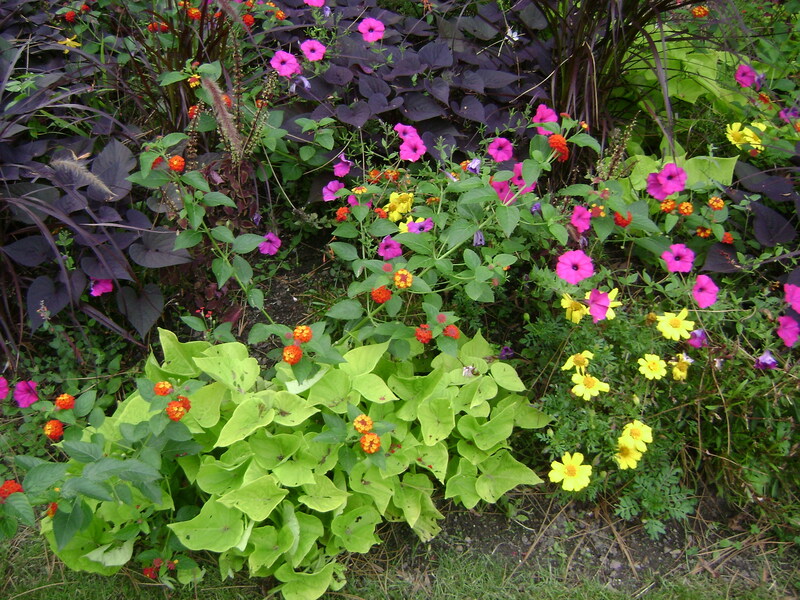 Thousand of annuals, perennials and shrubs create lush borders year round. 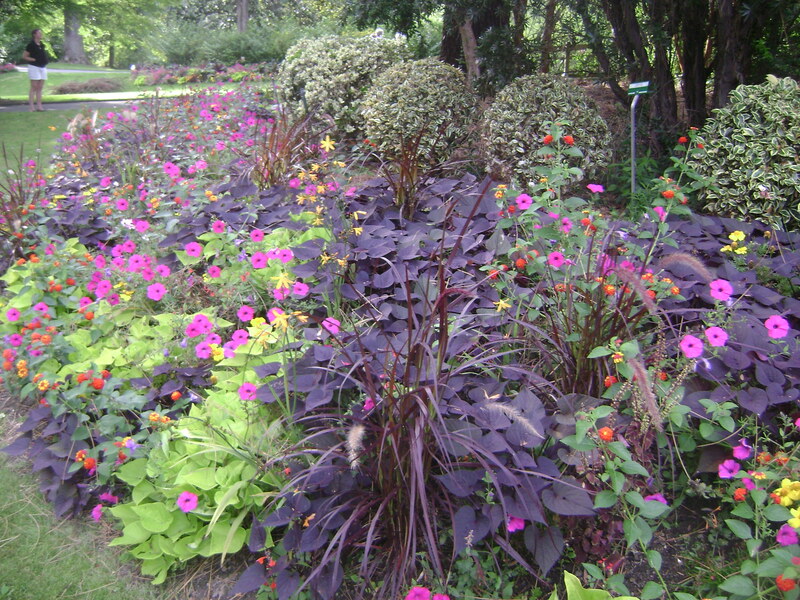 Photos below show just a small sampling and include gunnera, pennisetum, gingko, silk tree, hydrangea borders and mixed borders throughout the park. 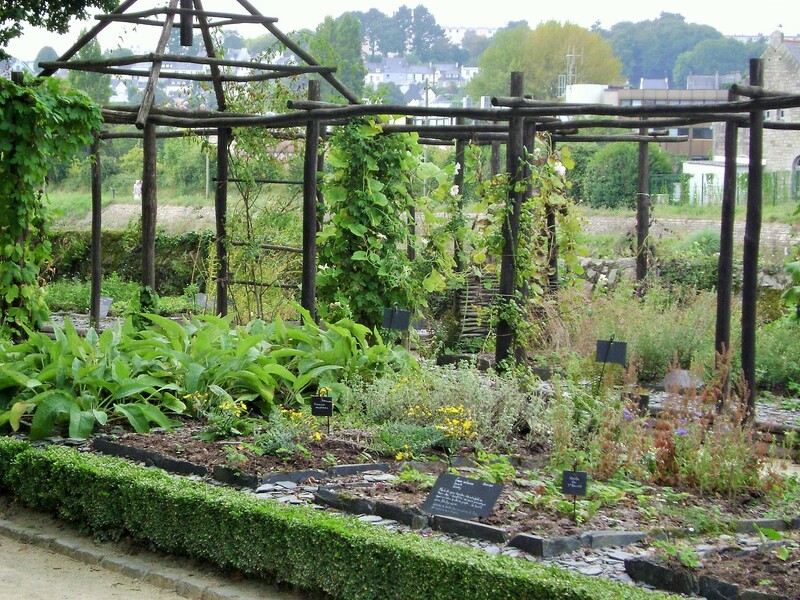 My first post on the Jardin des Plantes in Nantes was about the hothouses and scientific garden, this one focuses on the art installations and statues. 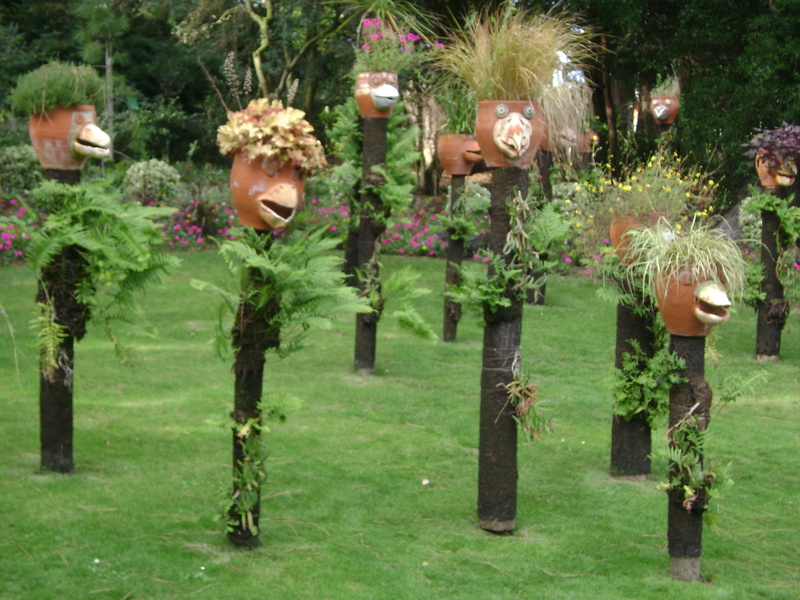 Art ranges from classic to modern with planted “totems” and an installation by Claude Ponti. 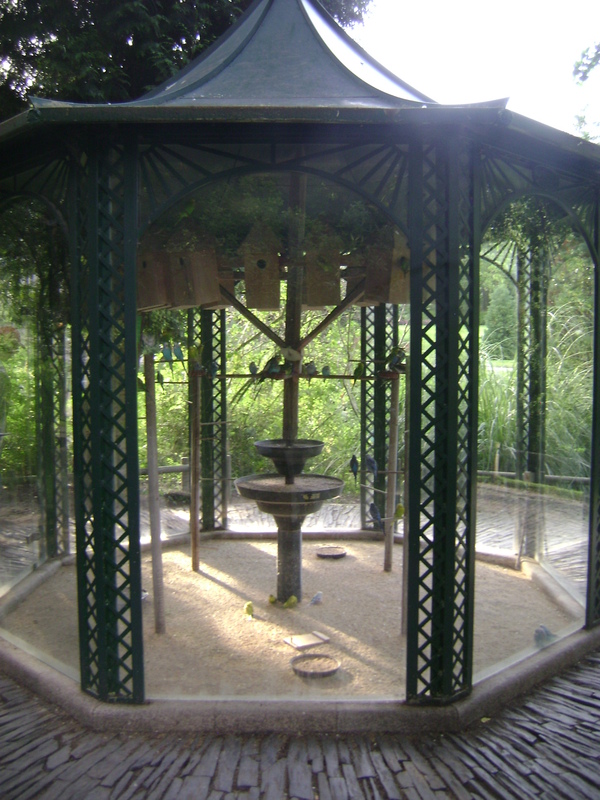 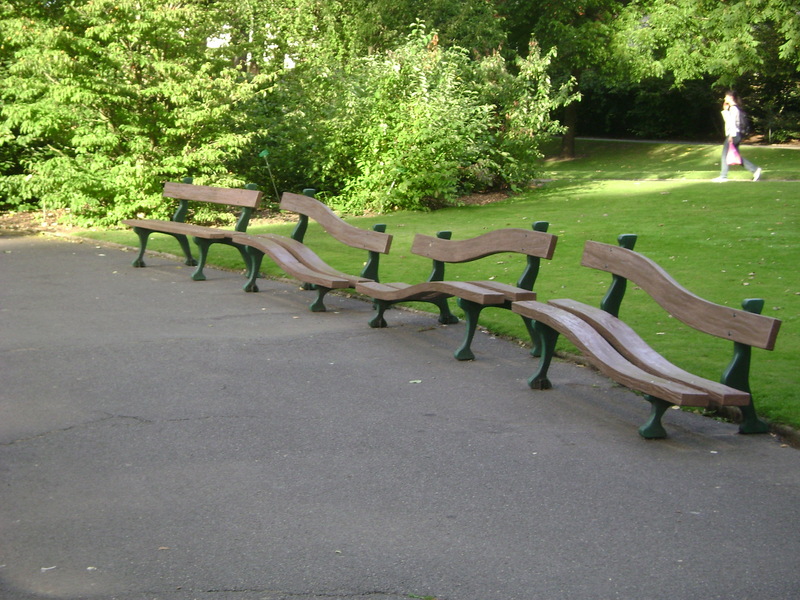 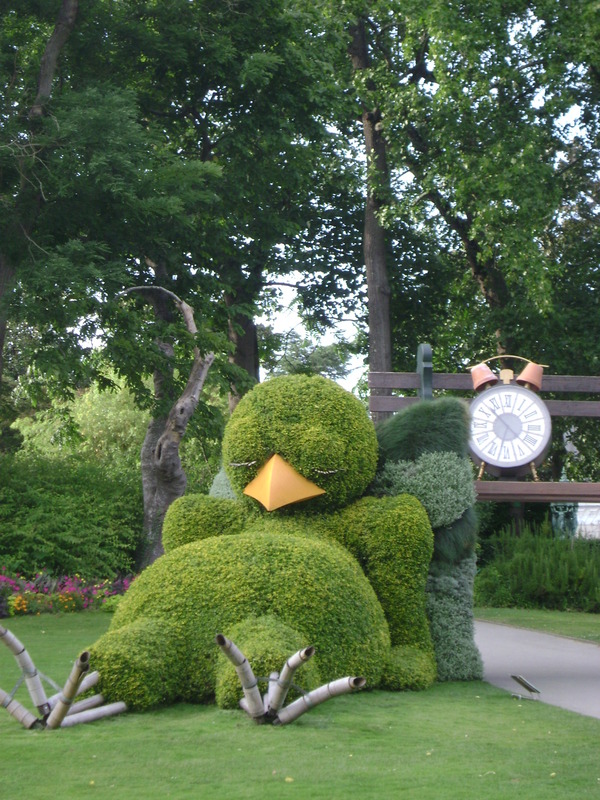 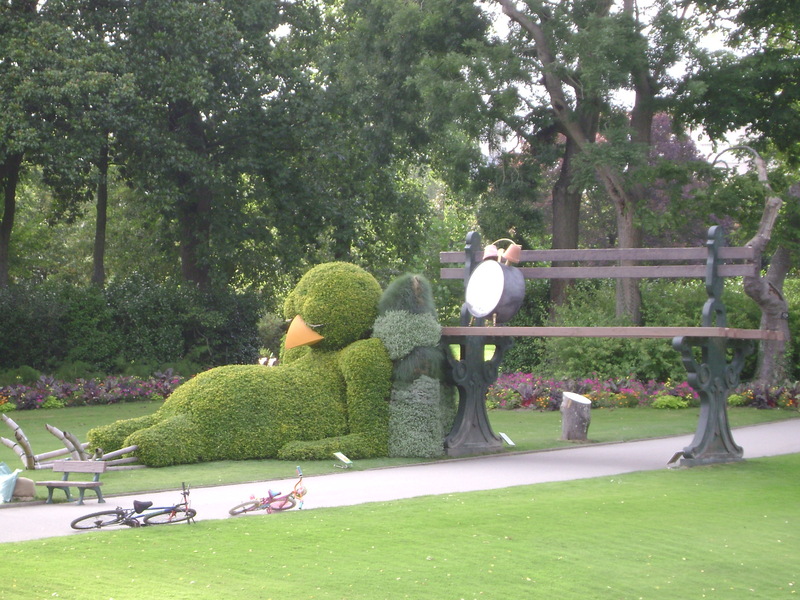 Also dotting the park are other features, some quirky, such as a bird house, wavy benches, or a lookout point with a frame for photo taking. 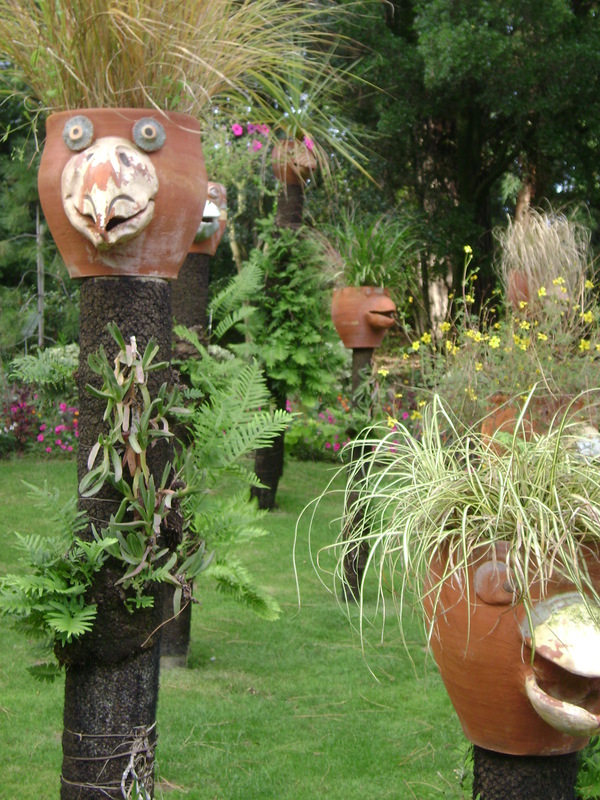 Not only are the planting stunning, but this garden offers unexpected and delightful surprises at every turn. 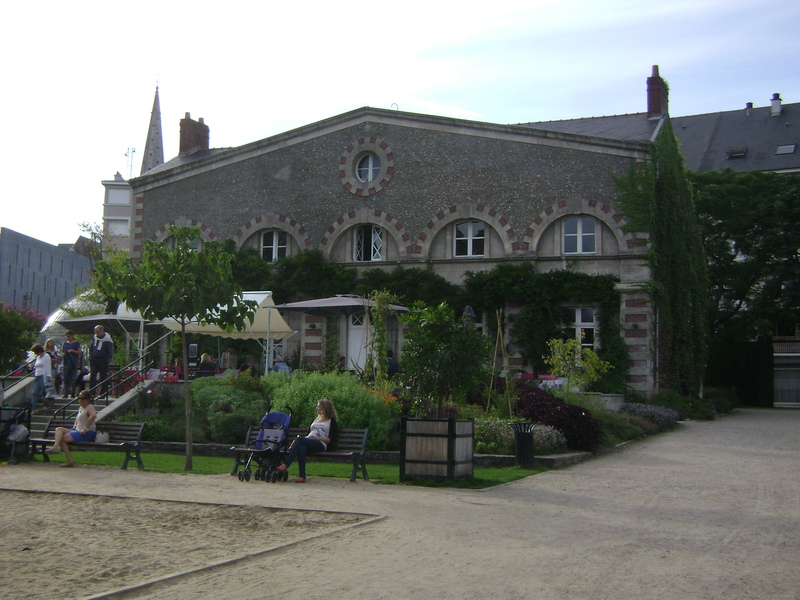 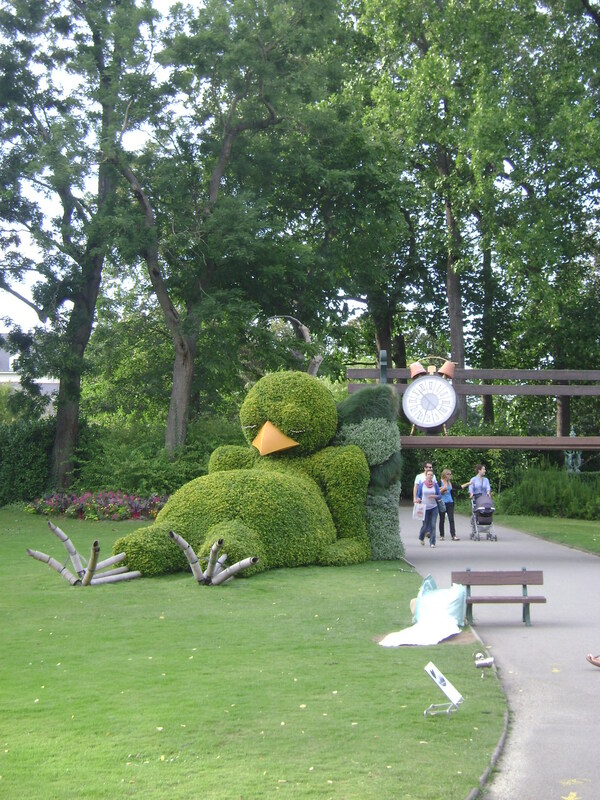 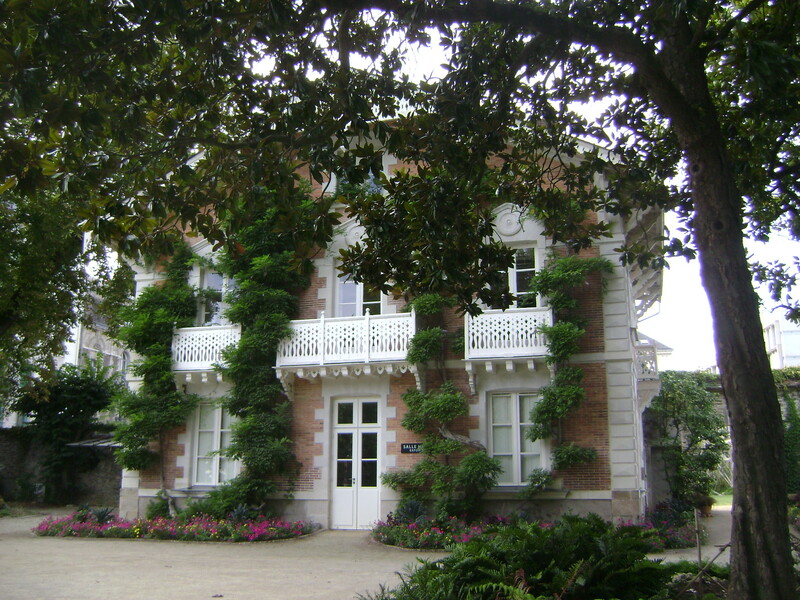 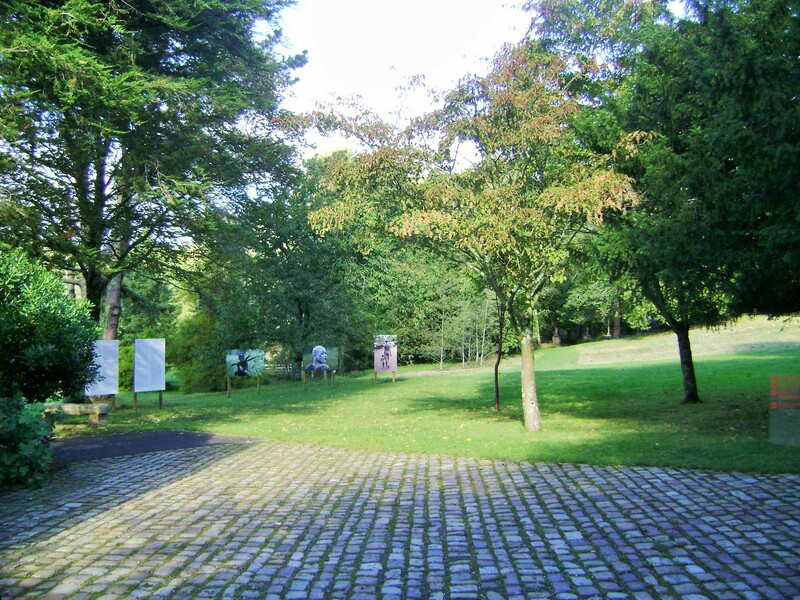 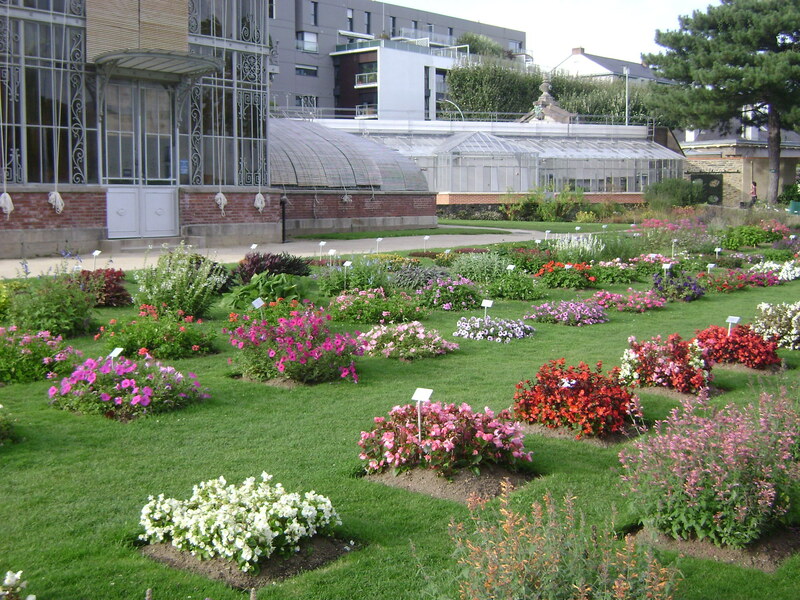 The Botanical Gardens (Jardin de Plantes) in Nantes have been awarded the title of “Jardin Remarquable” (garden of exception), and are also one of the four largest in France. 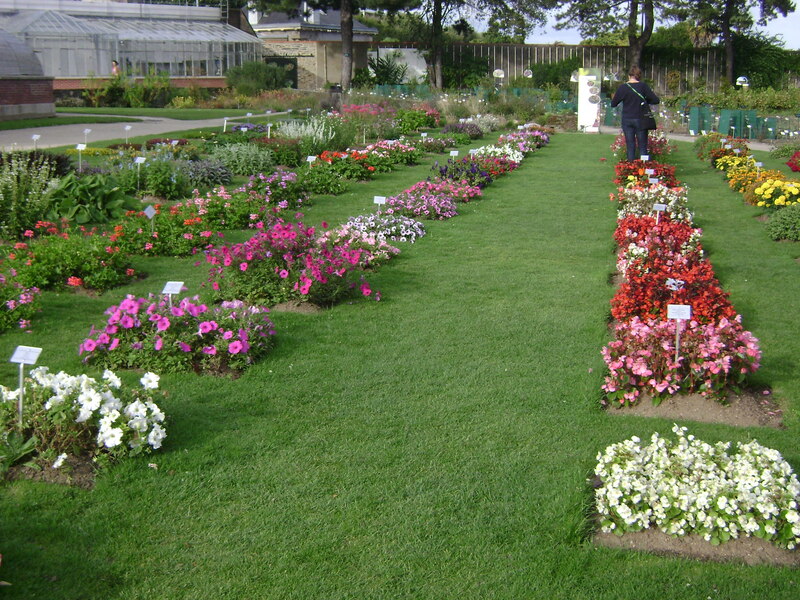 They showcase 10,000 species/varieties, 800square meters of hot houses, and over 50,000 flowers are planted each year. 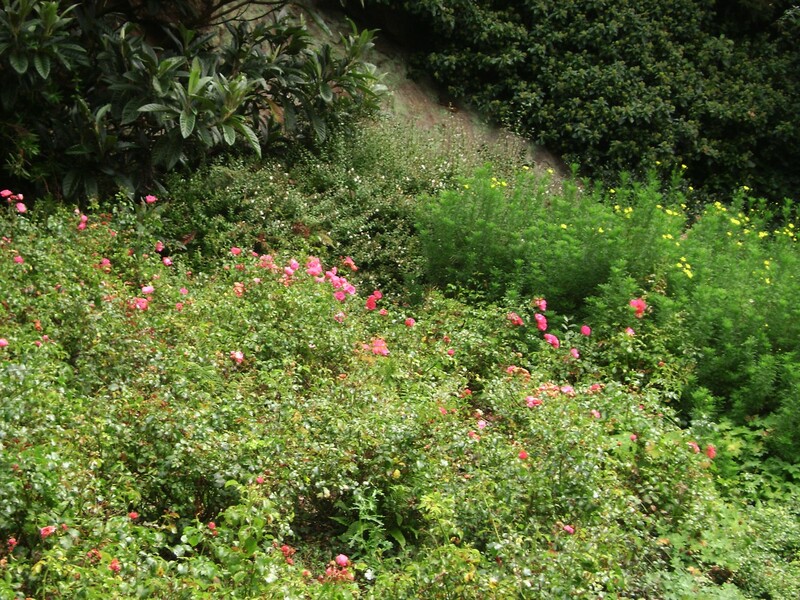 The collections have grown over the past 150 years, and are renowned worldwide, for camellias in particular. 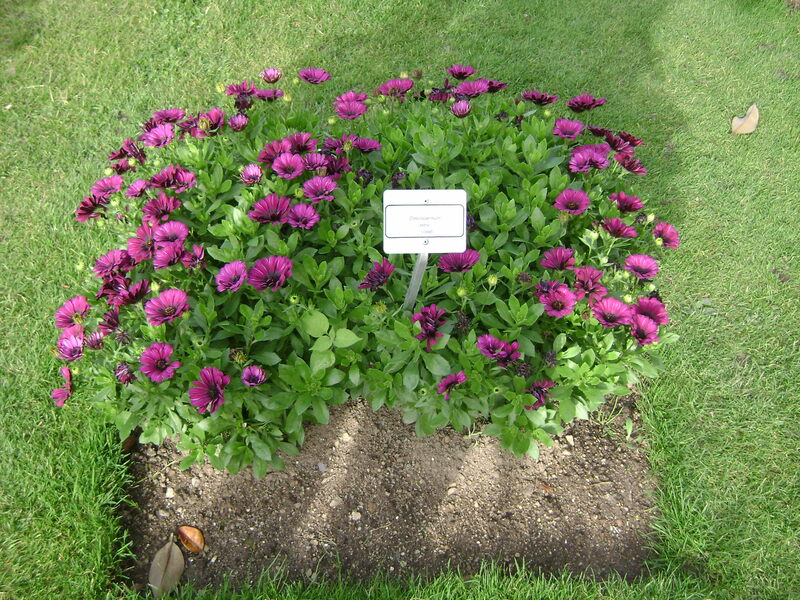 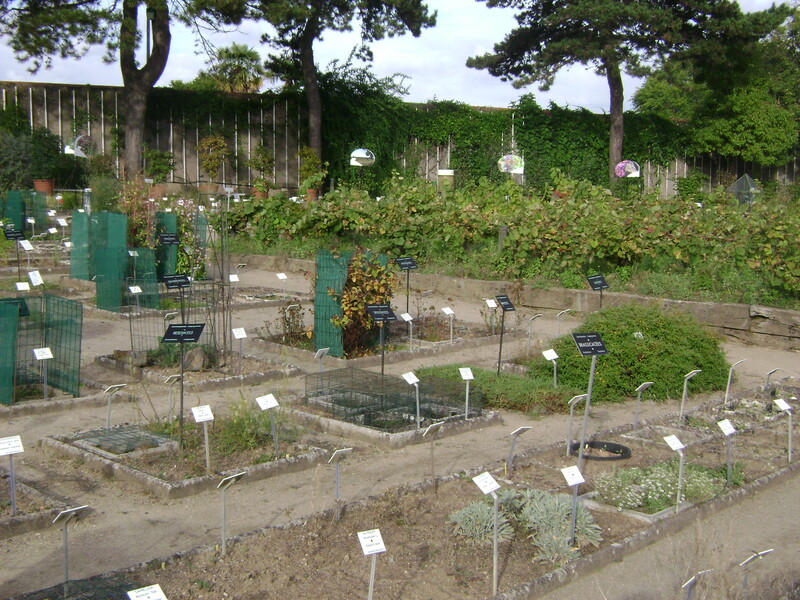 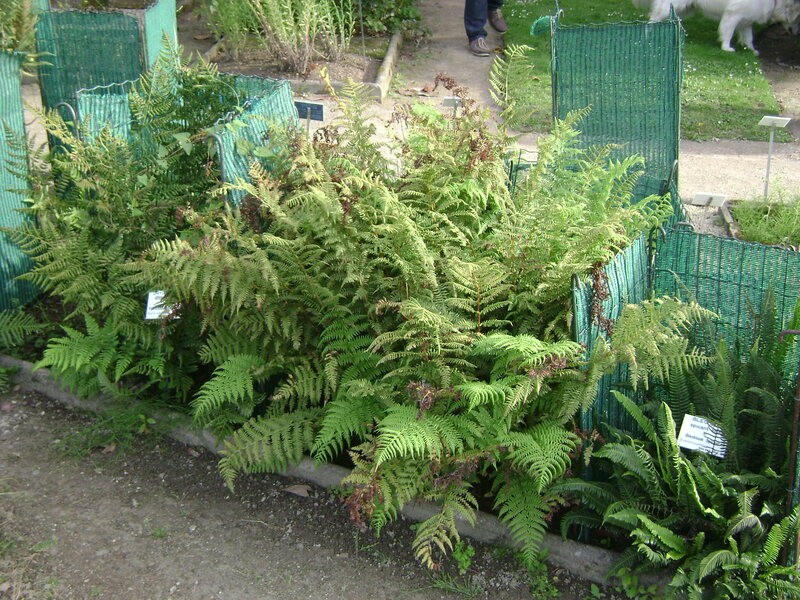 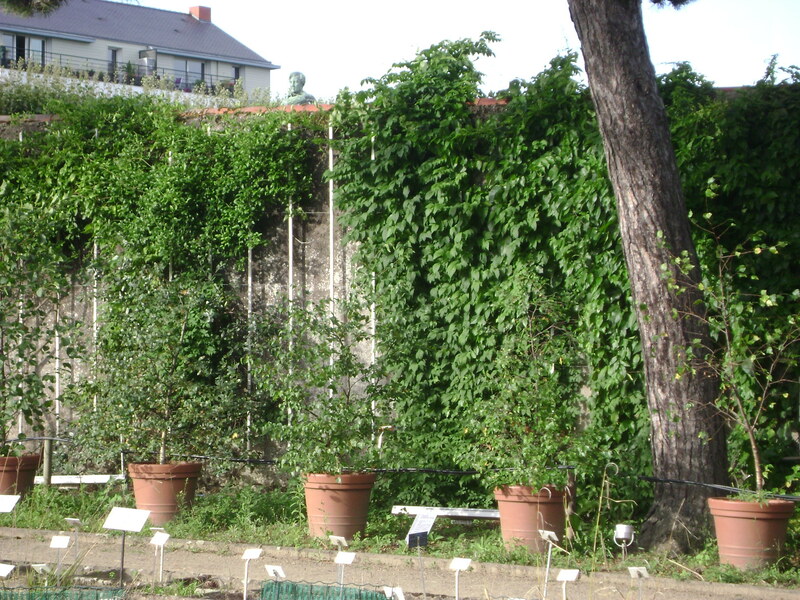 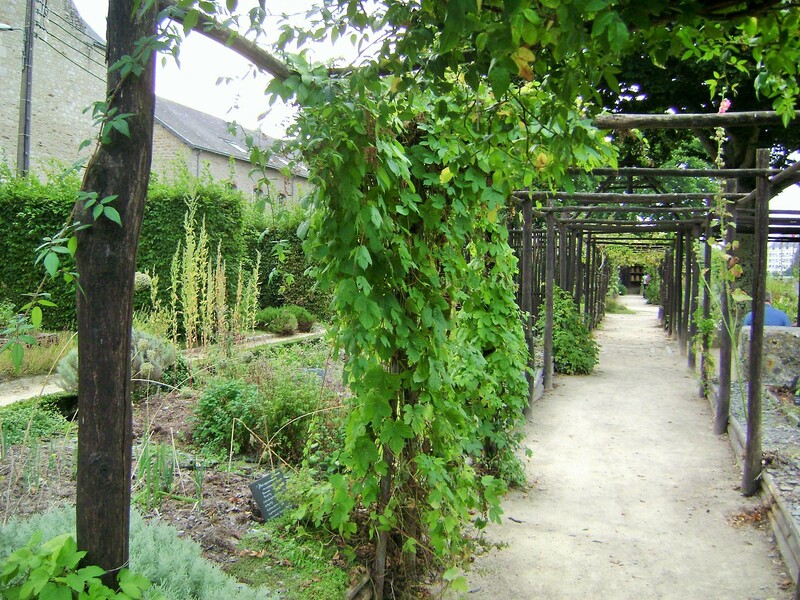 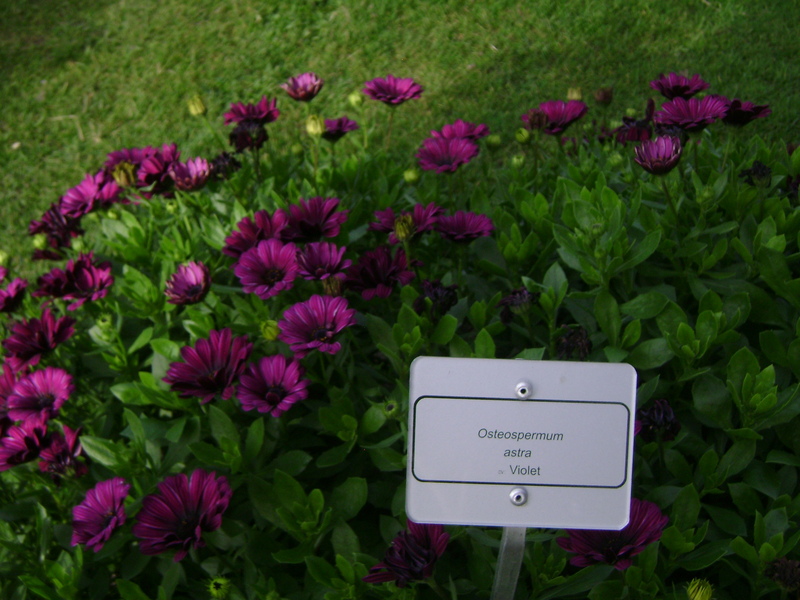 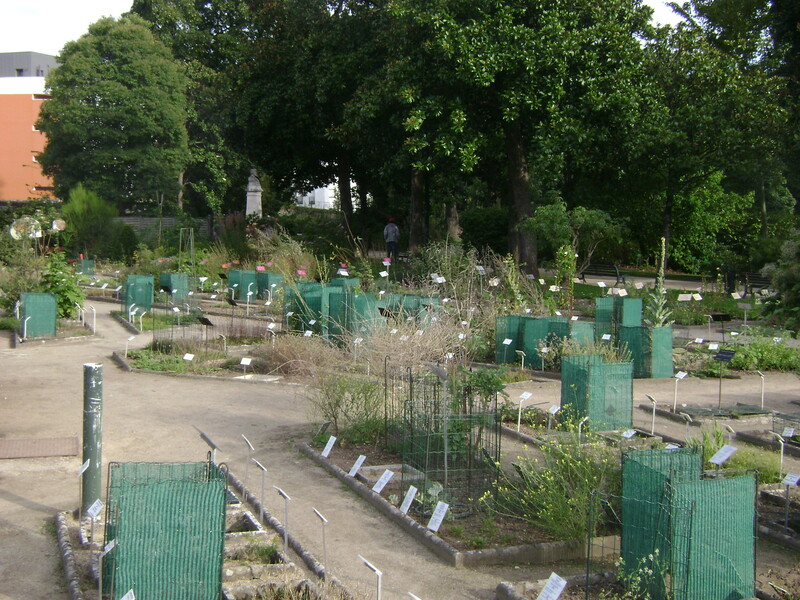 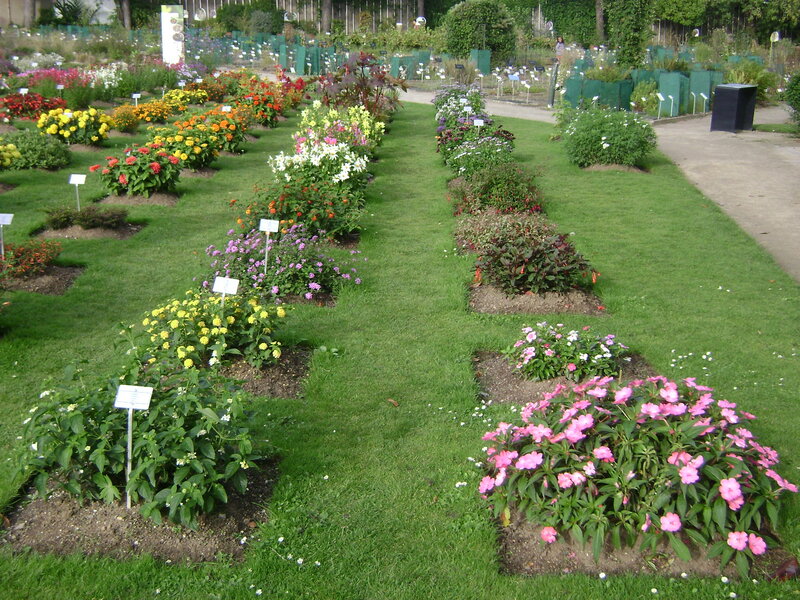 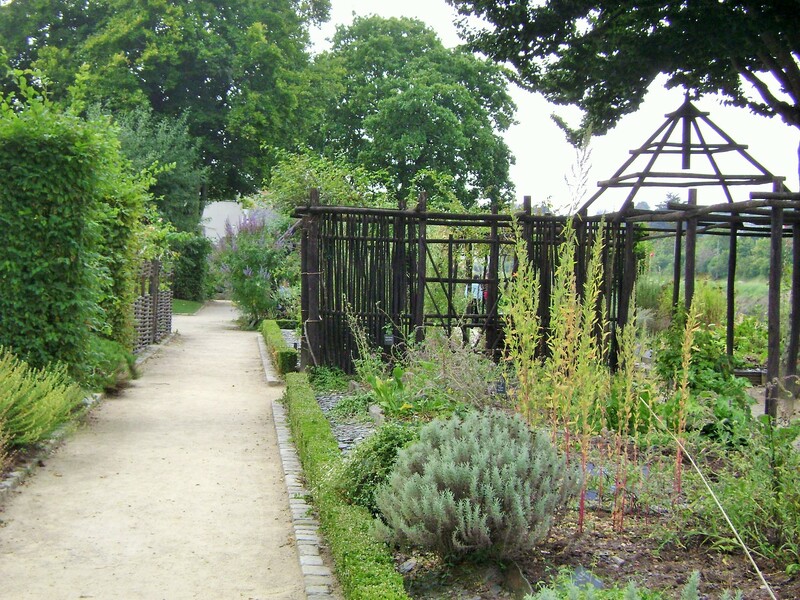 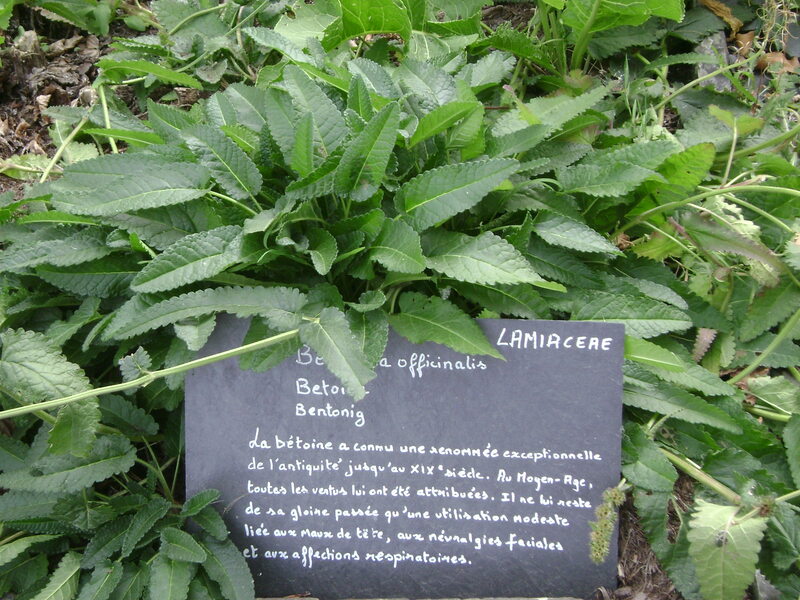 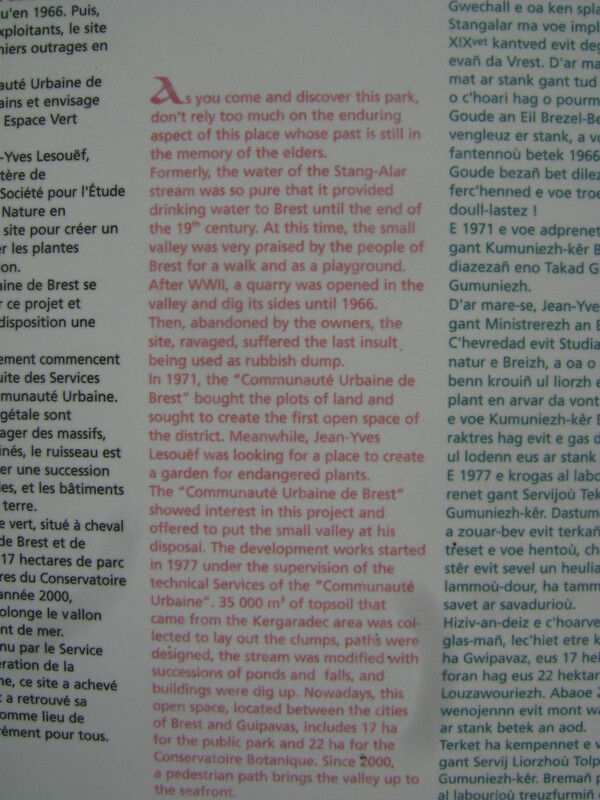 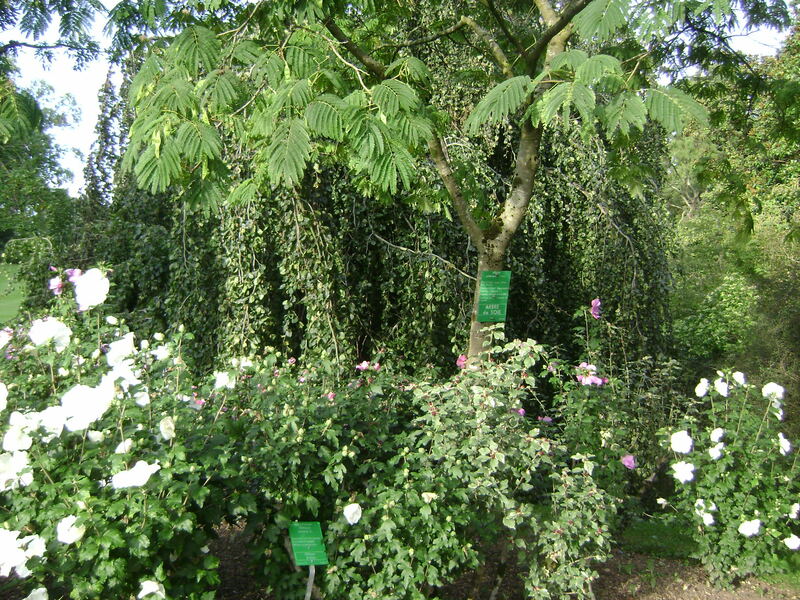 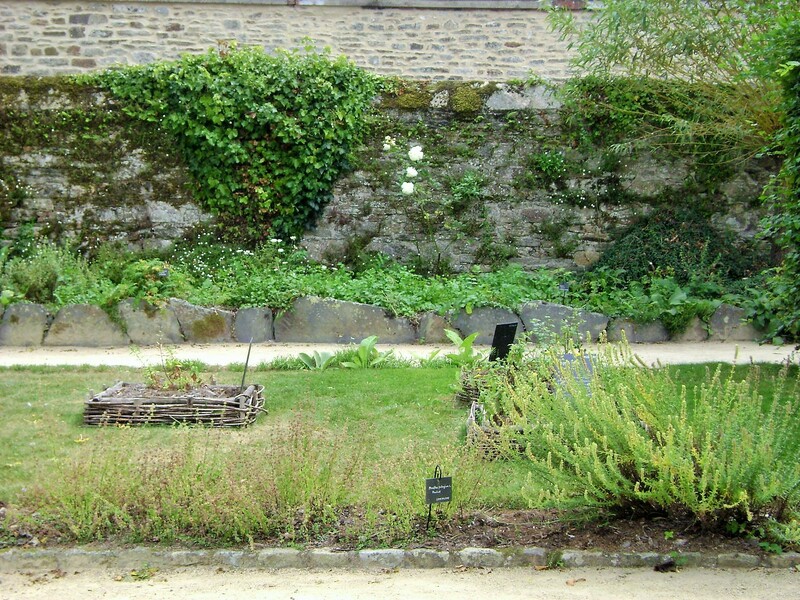 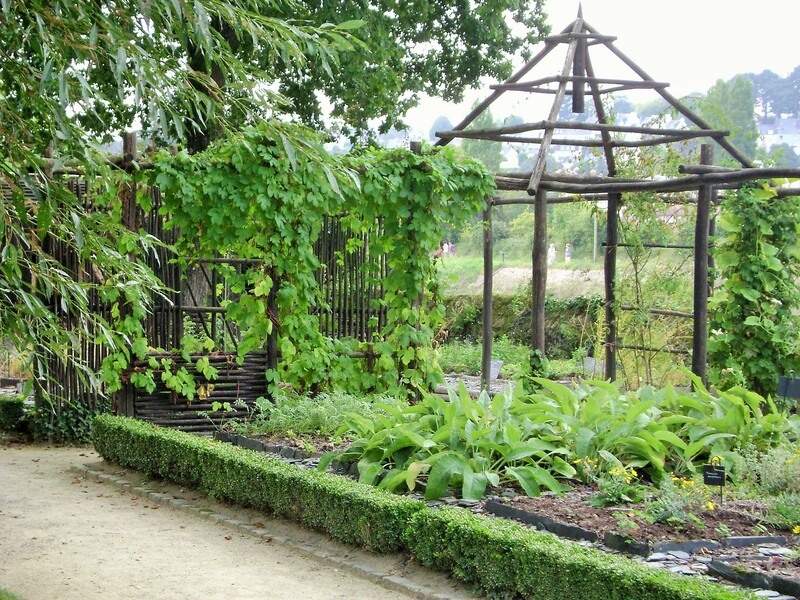 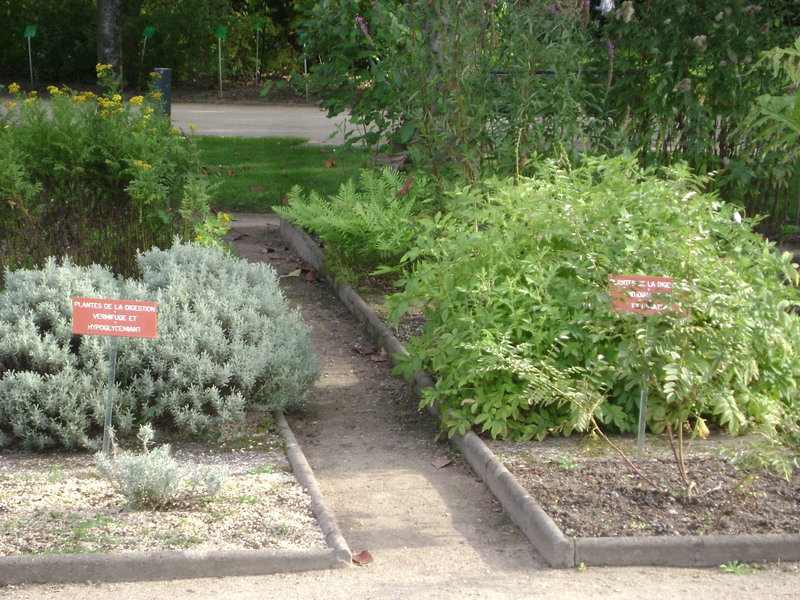 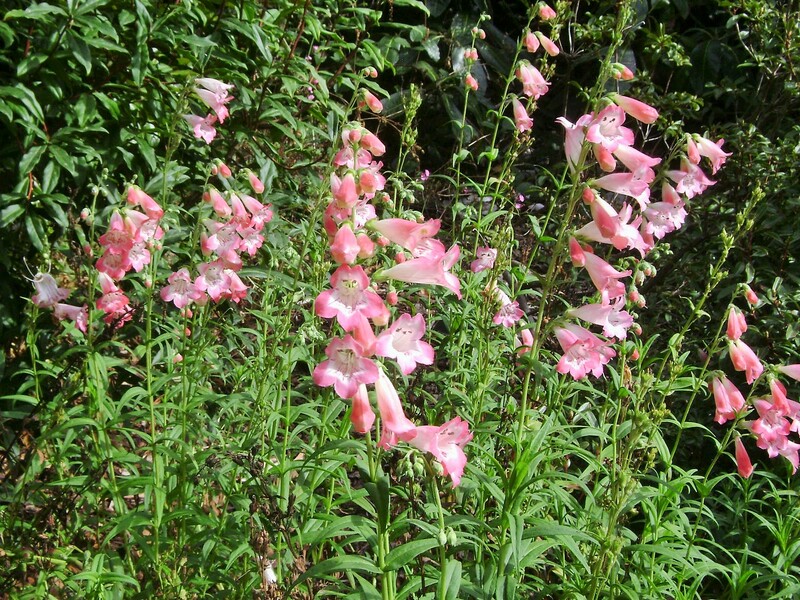 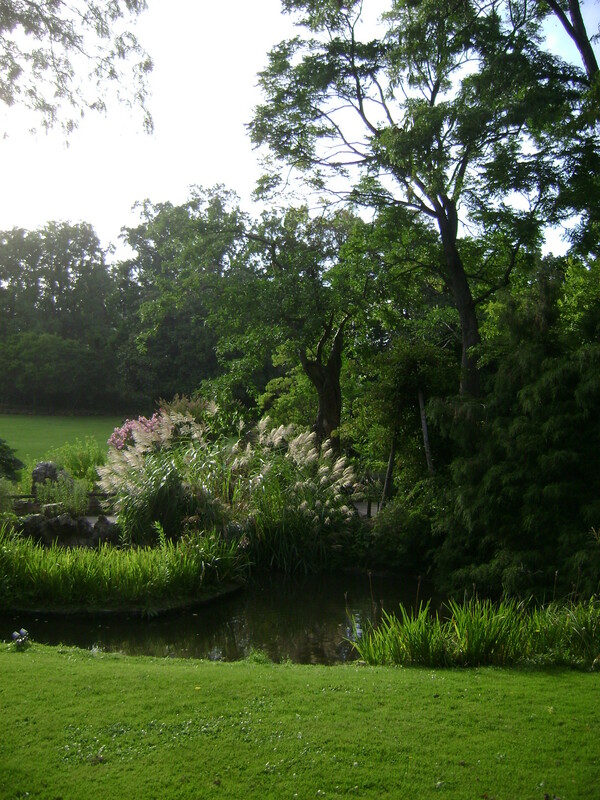 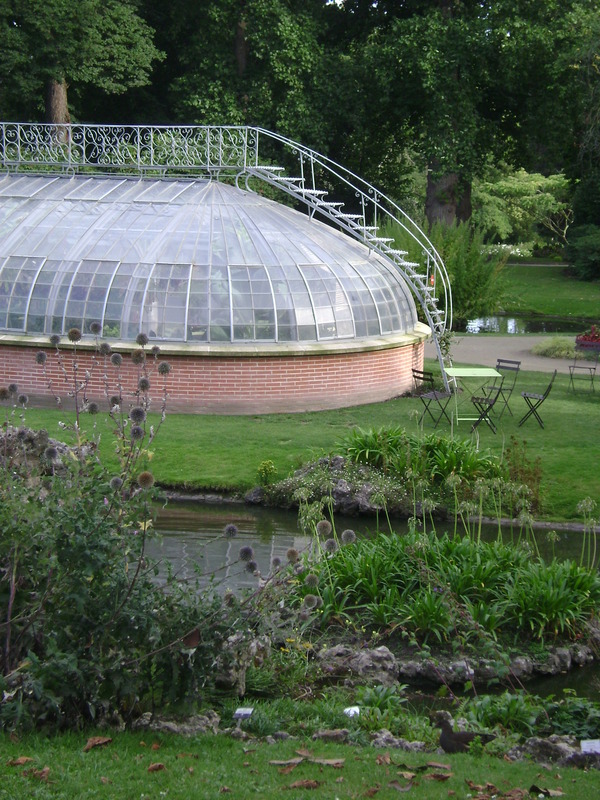 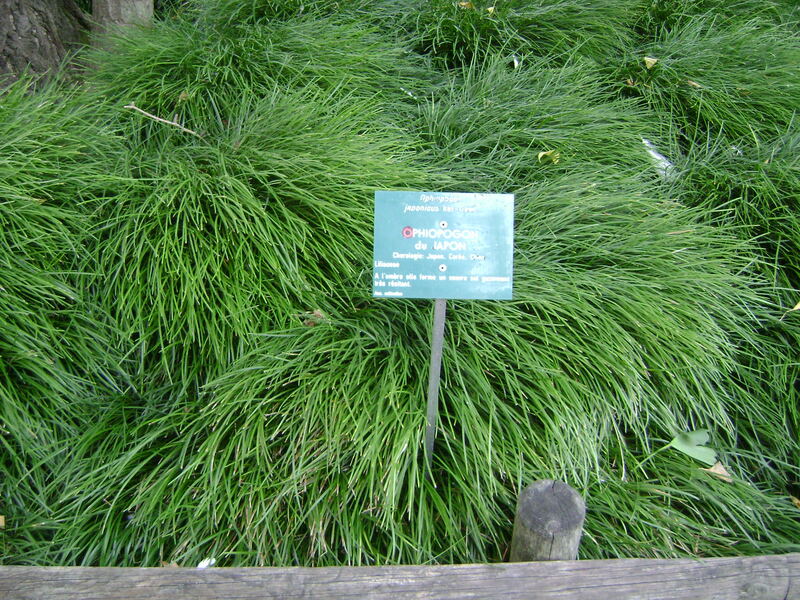 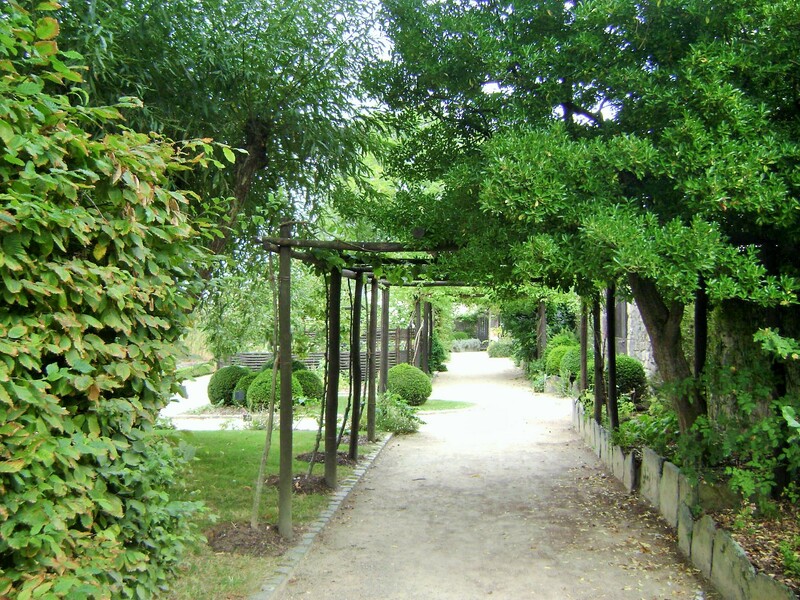 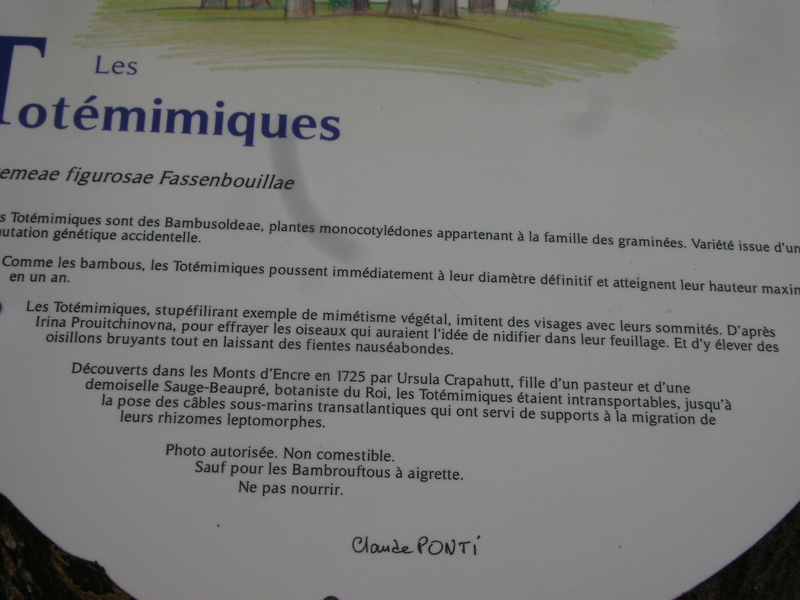 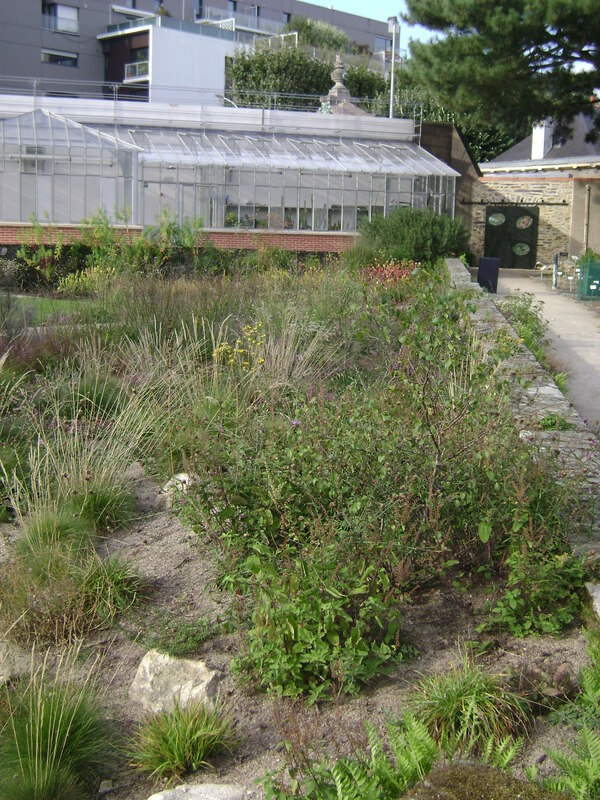 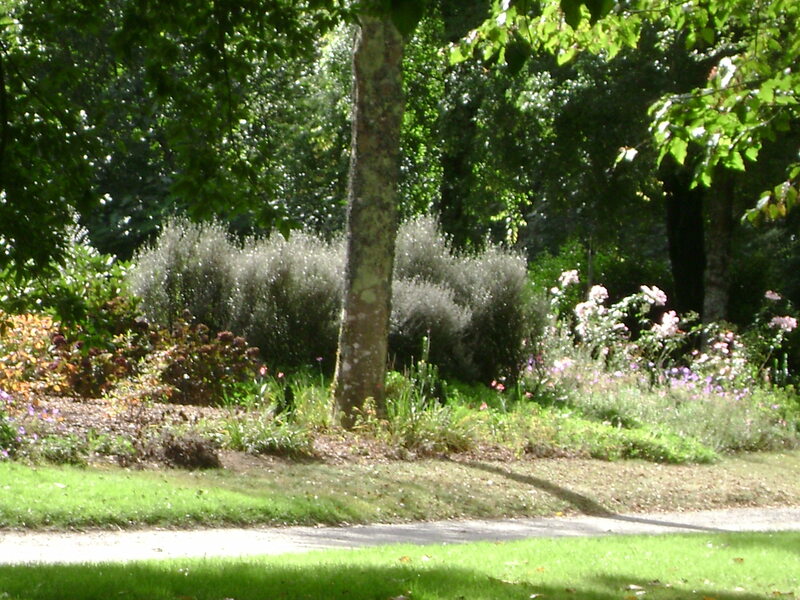 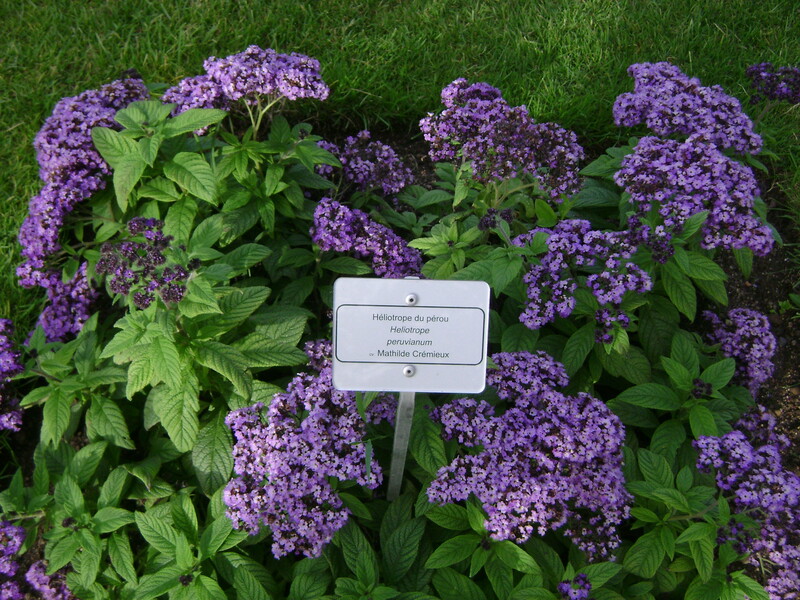 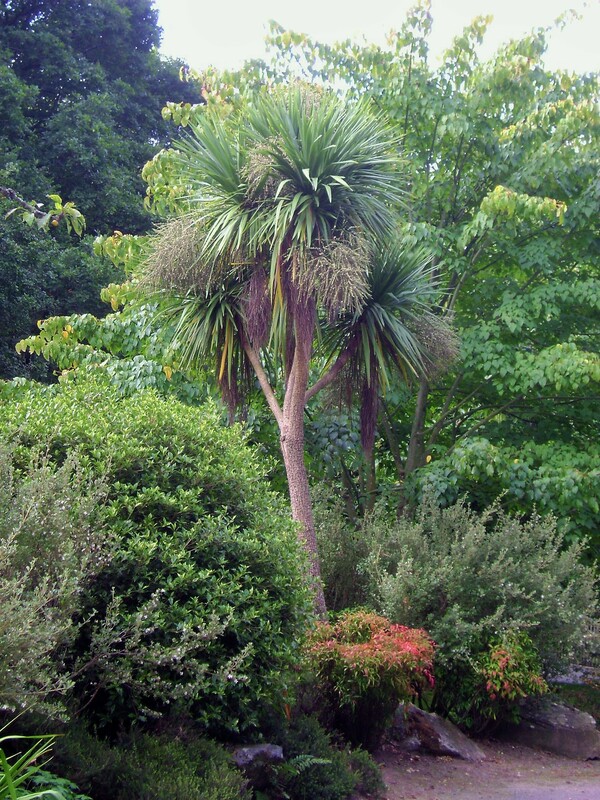 The Jardin the Plantes also strives to protect and reintroduce rare plants. 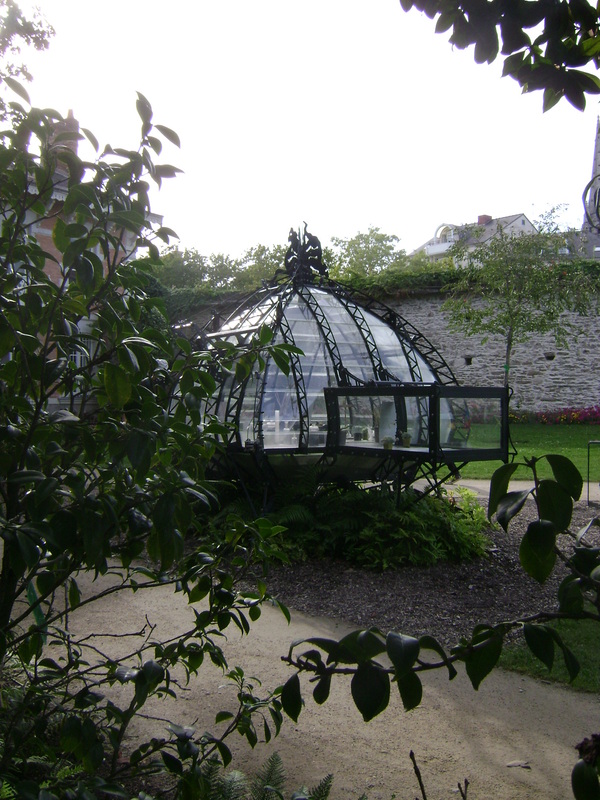 A portion of the Gardens is dedicated to the green houses as well as a showcase for organizing, labeling, and experimenting with many species of plants. 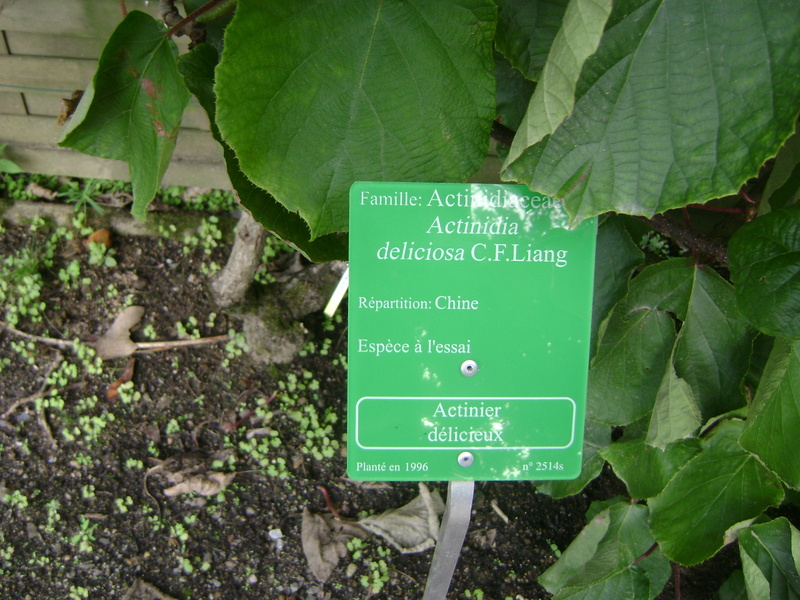 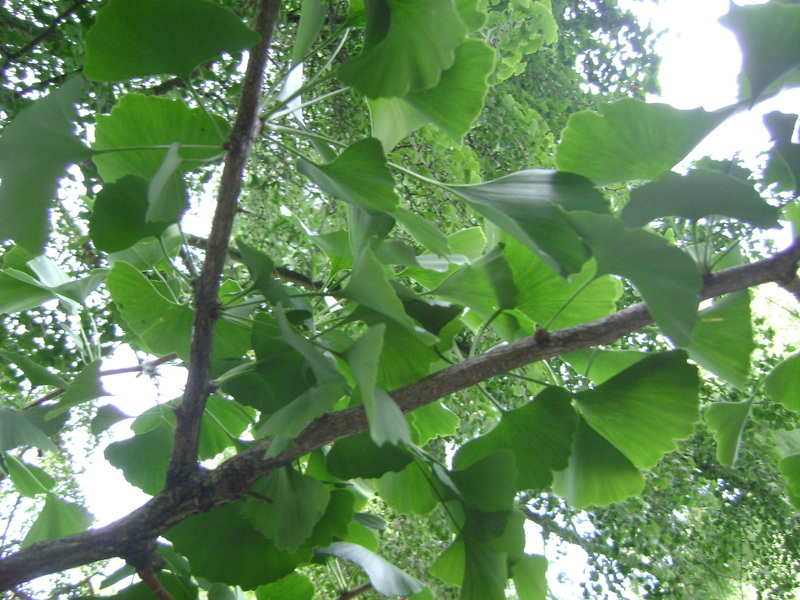 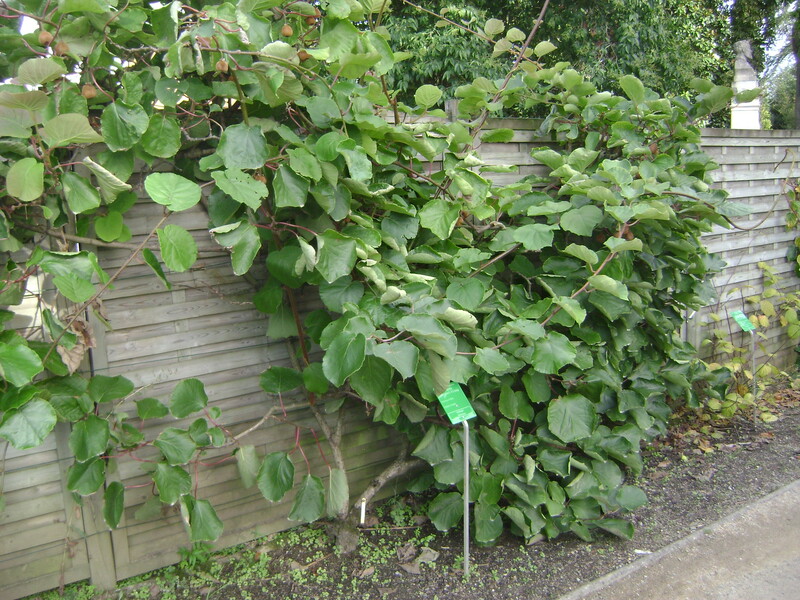 Several greenhouses, both humid and dry, house tropical plants. 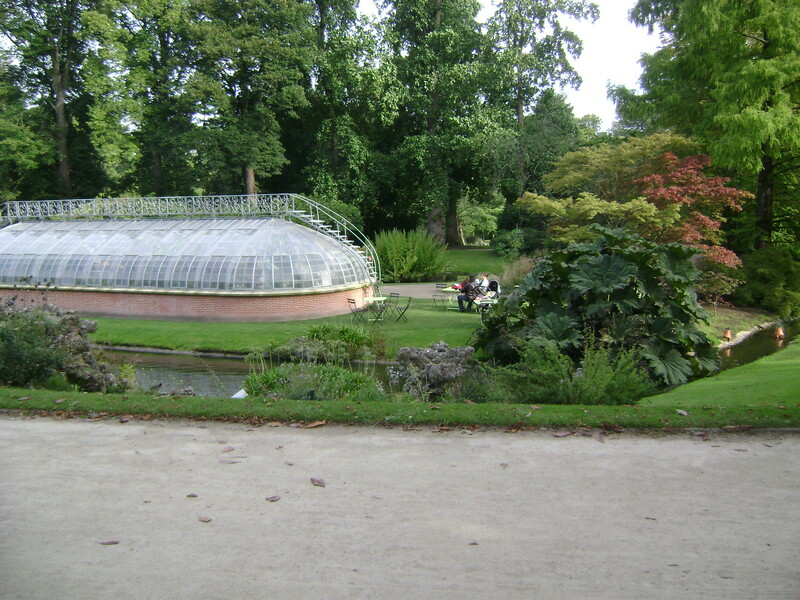 There is also a conservatory style café and a welcome center. 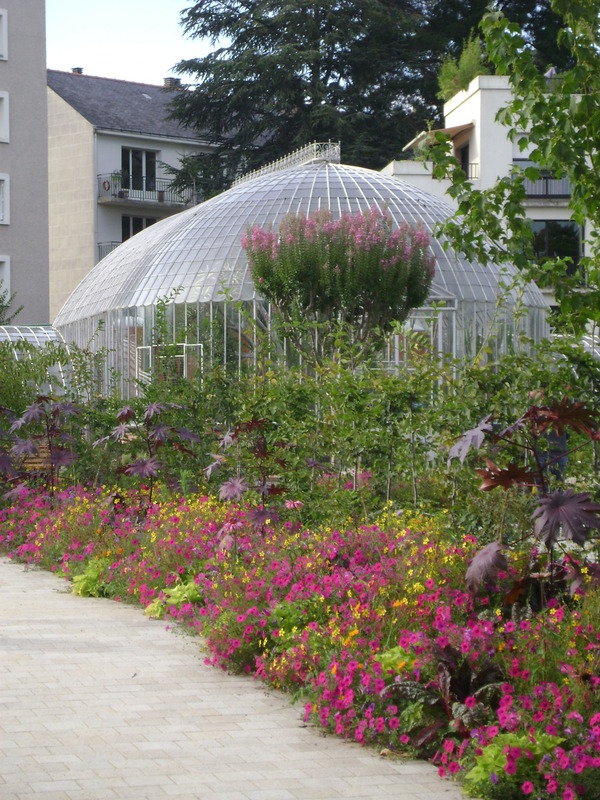 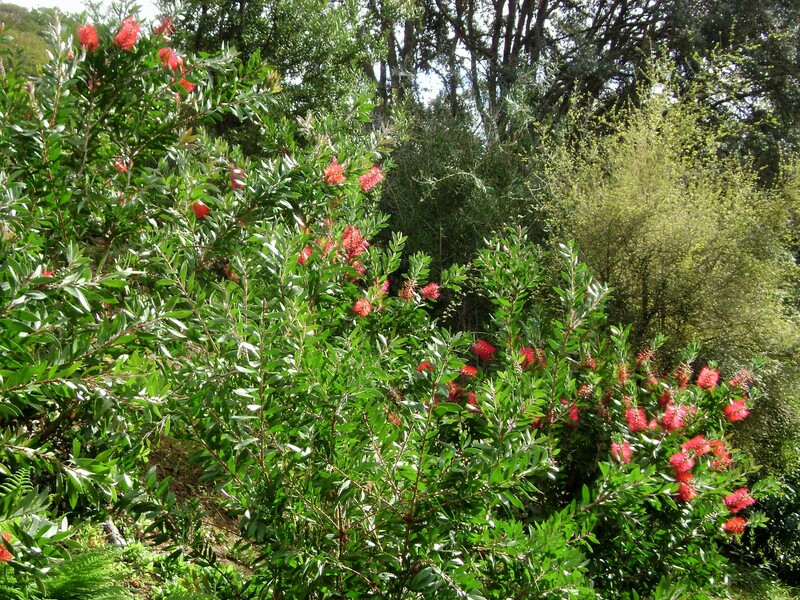 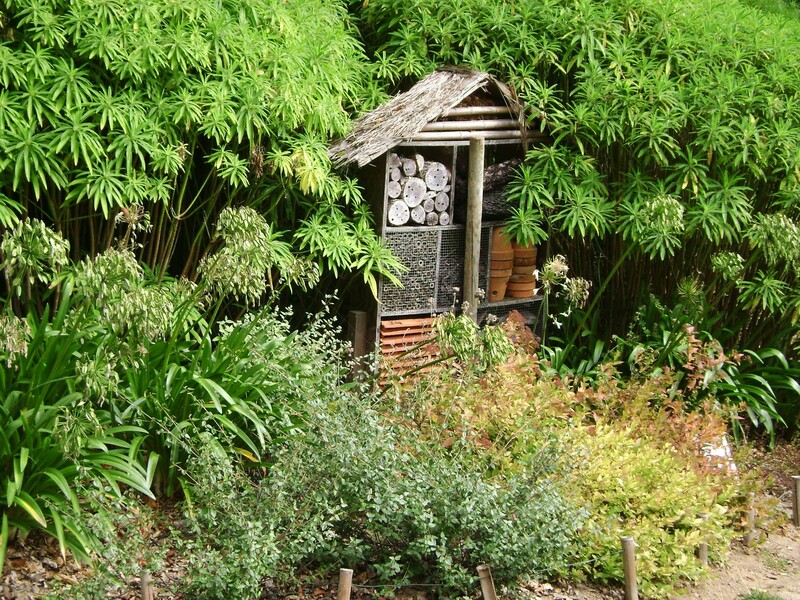 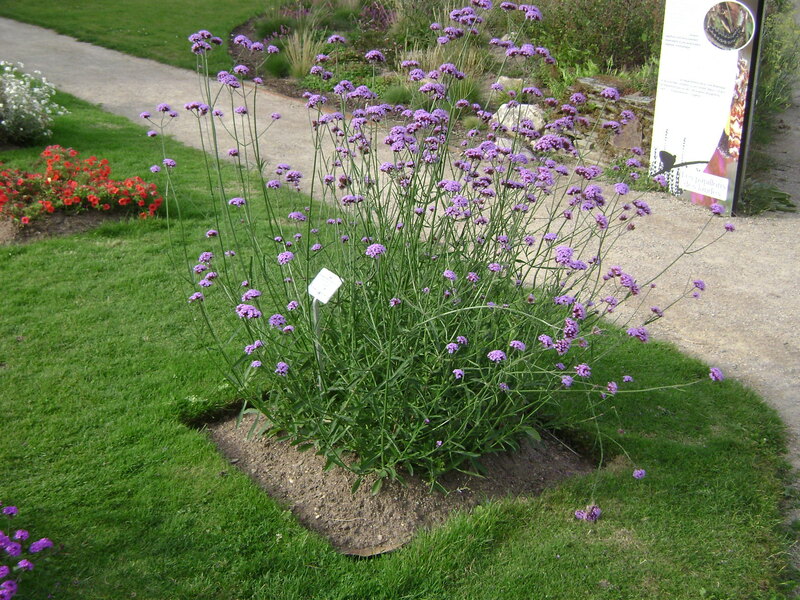 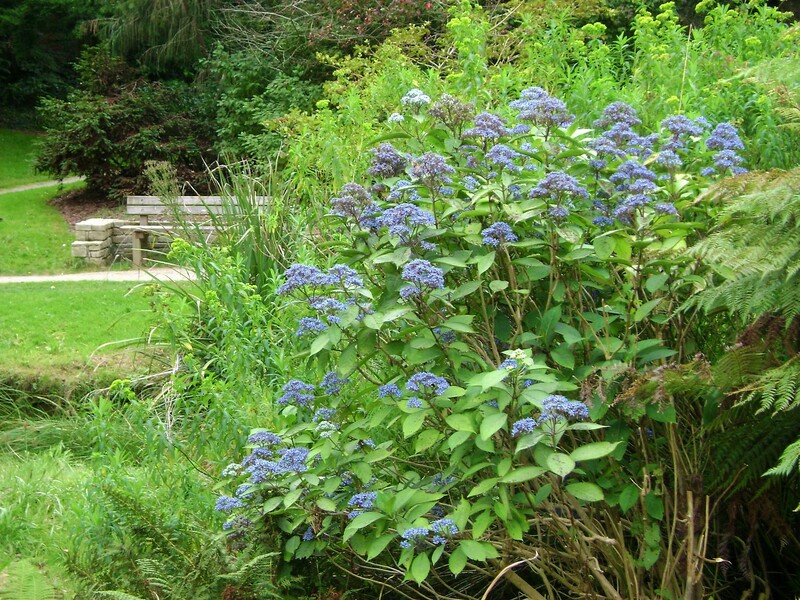 Another area features a meliferous “butterfly” garden, to foster pollination in the gardens. 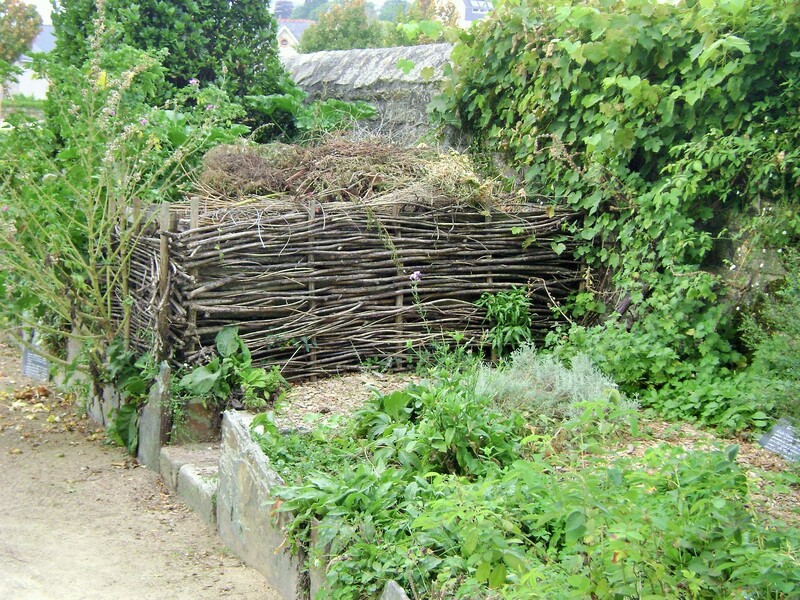 Raised beds include herbal and edible plants, as well as new varieties of grapevines being developed for wine growing.